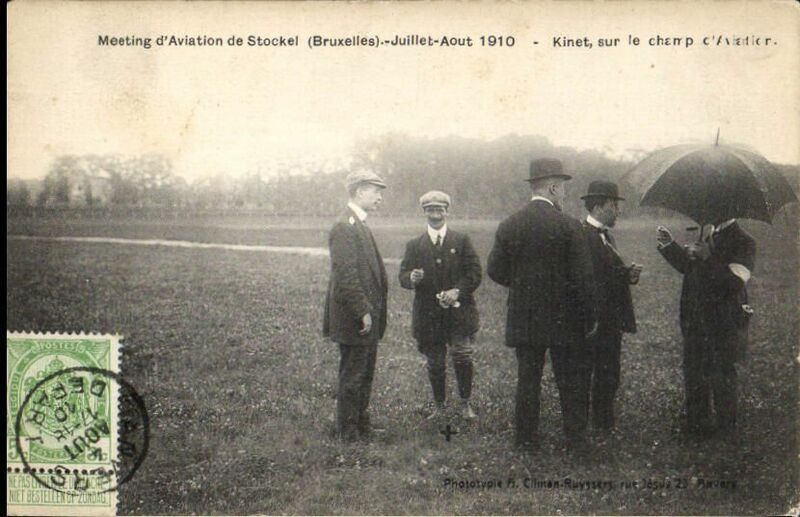 Stockel Aviation Meeting, special B&W picture card franked Belgium 1c tied by 'Anvers/4 Aout 10' /Depart' cds, picture side shows "Meeting d'Aviation de Stockel - Juillet -Aout 1910 - Kinet, sur le champ d'Aviation" . 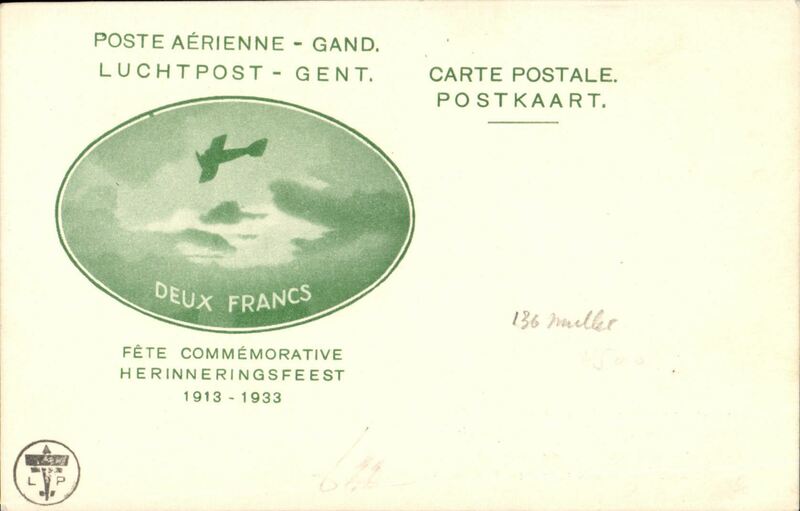 Gent Airpost Exhibition, 2F green/cream card commemorating the 'Herinneringsfest 1913-1933', unused. 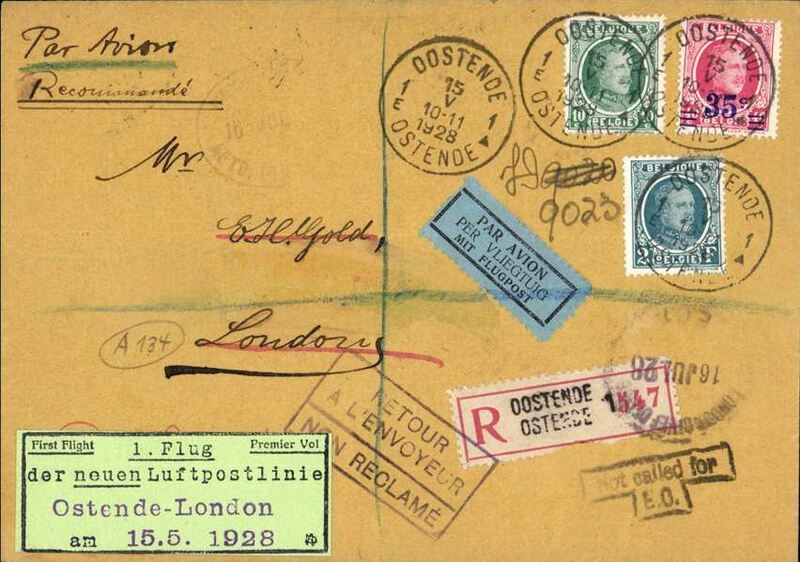 De Panne royal correspondence flight card to England. 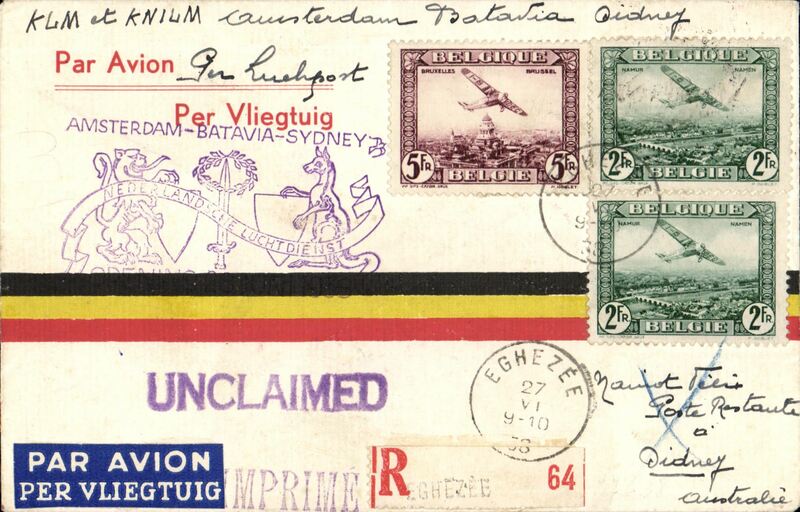 A special military air mail service was operated to carry official correspondence and soldiers' mails from the Western Front to Folkestone by Belgian Military Aircraft. This service was known as the 'King Albert Line'. 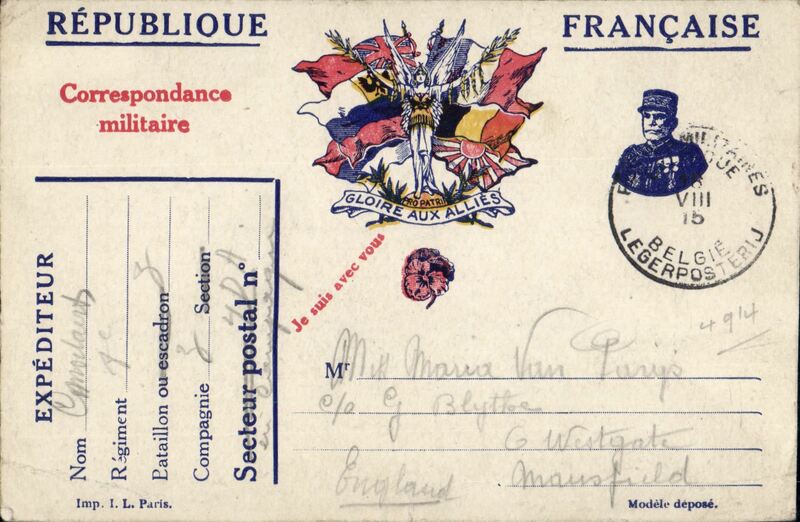 Red/white/blue 'Republique Francaise/Correspondence militaire' PC addressed to Mansfield, England. King Albert I lived in De Panne during the First World War because it is located in the tiny fraction of his country that was not conquered by the Germans. Rare item in fine condition. 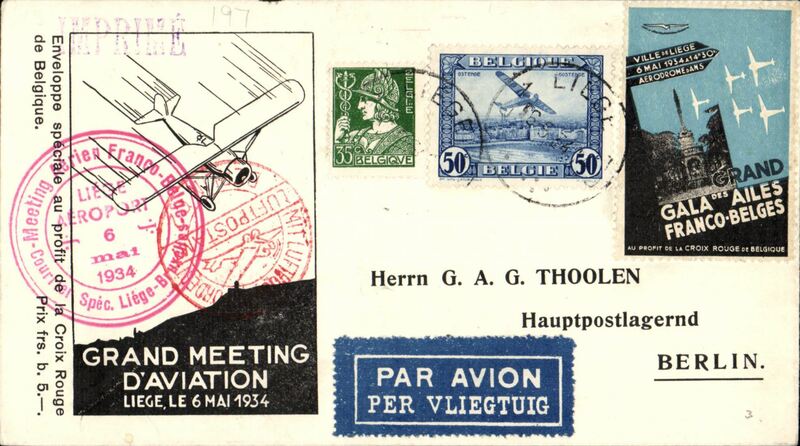 Brussels Aviation Meeting, flown registered cover addressed to Paris, bs La Poueze 27/6, posted at meeting, franked 2x 50c, each cancelled special dated Expo cachet "Brussels Aviation/ Brussle-Vliesplein", also red/white registration label ""Brussels Aviation/ Brussle-Vliesplein/Evere". Scarce item, even more so with special regn label which Jennekens & Godinas value at 2x non regstered cover. 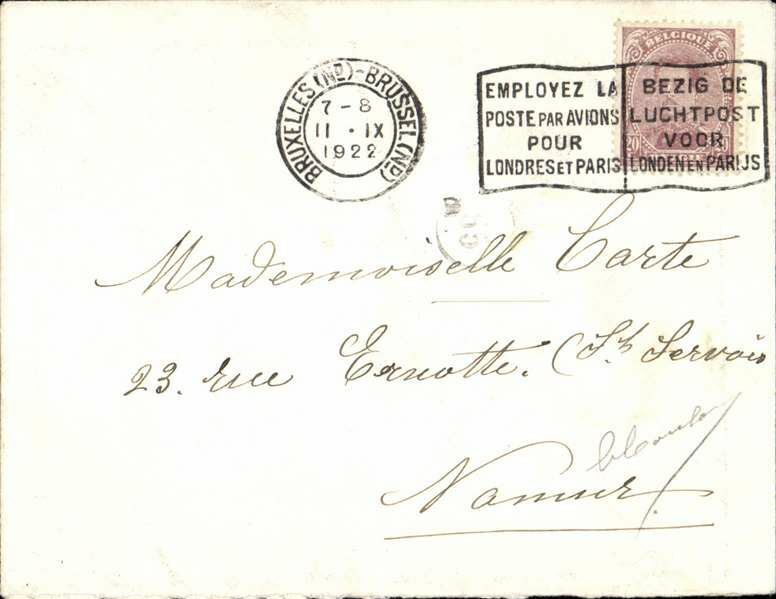 Brussels to Namur, cover (NOT FLOWN) franked 20c, fine strike bilingual "Emplyez La/Poste par Avion/Pour/Londres et Paris". 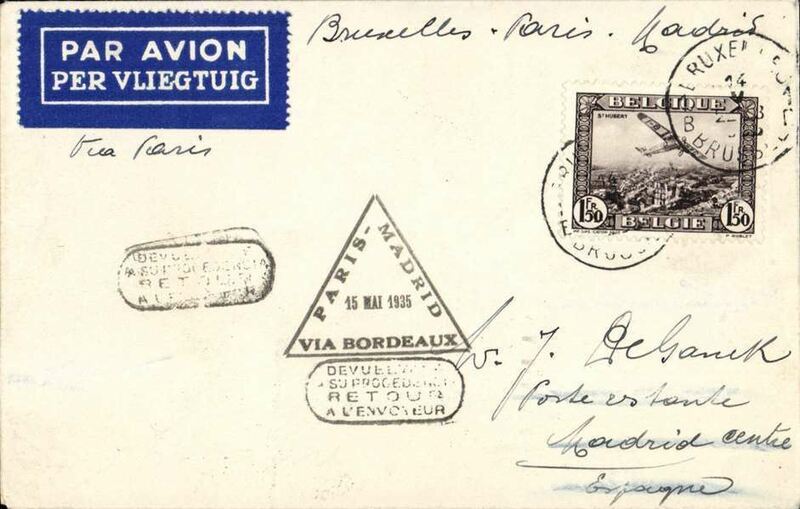 Early airmail, Brussels to Paris, bs 5/2, plain cover franked 1F20, ms 'France/Par Avion', black framed 'Par Avion/Per Vliegtuig' hs. .Exhibition quality cover written up on display page. 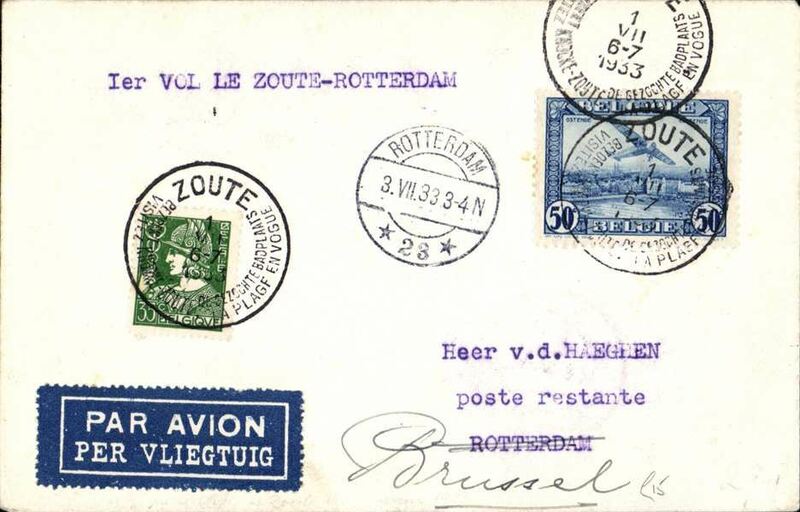 Ostende to London, bs 2/5/27, reistered (label) cover franked 2F5c canc Ostende cds, black framed bilingual 'Par Avion' hs, typed 'Per Flugpost'. 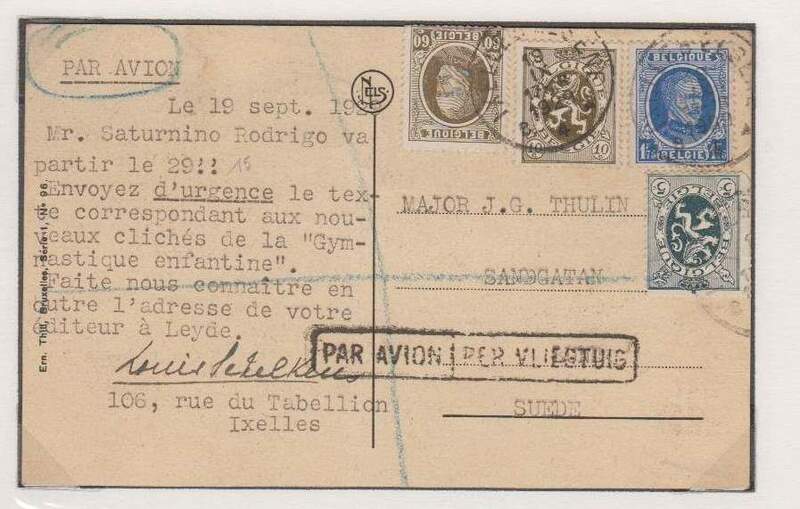 Flown by Sabena on their Brussels-Ostende-London serice which opened in 1923. 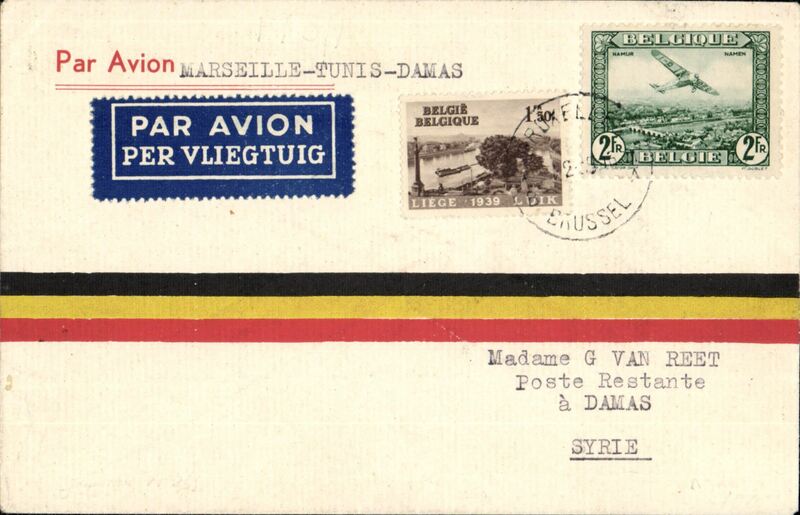 LIgnes Farman/Air Union, Belgium to Carthage,Tunis, via Marseille St Charles, 29/6, plain cover franked 1F75 postage + 1F airmail fee, canc Maeseyck cds, black framed 'Par Avion/Per Vliegtuig' hs. Exhibition quality cover written up on display page. 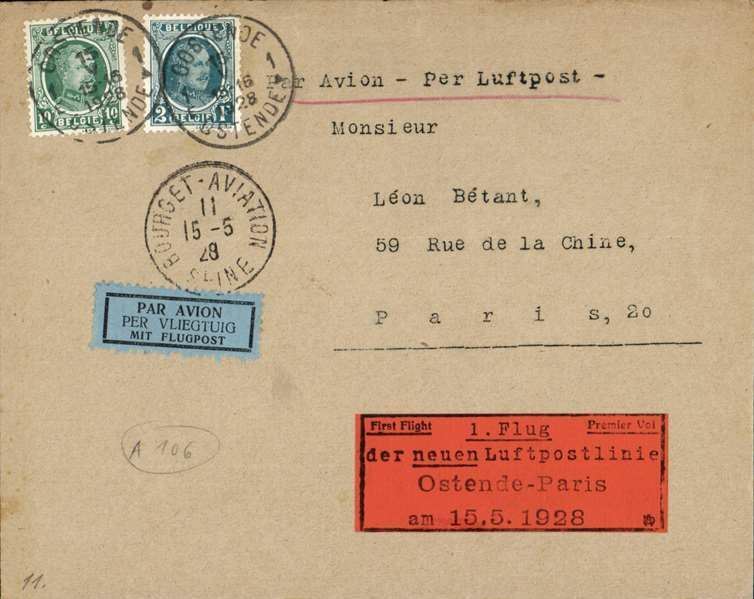 Unlisted inaugural flight Ostende to Paris, Bourget Aviation 15.5.28 arrival cds on front, plain cover franked 2F10 canc Ostende 15.5.1928 tying trilingual black/blue airmail etiquette, black/orange First Flight Premier Vol/1. 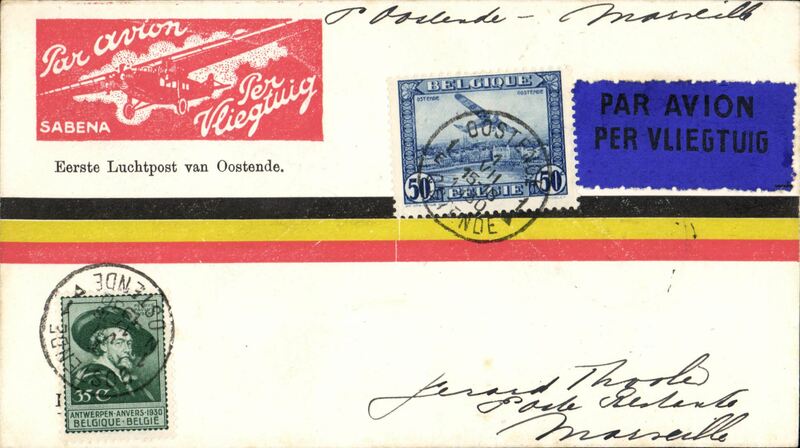 Flug/der neuen Luftpostlinie/Ostende-Paris/am 15.5.1928". Exhibition quality cover written up on display page. 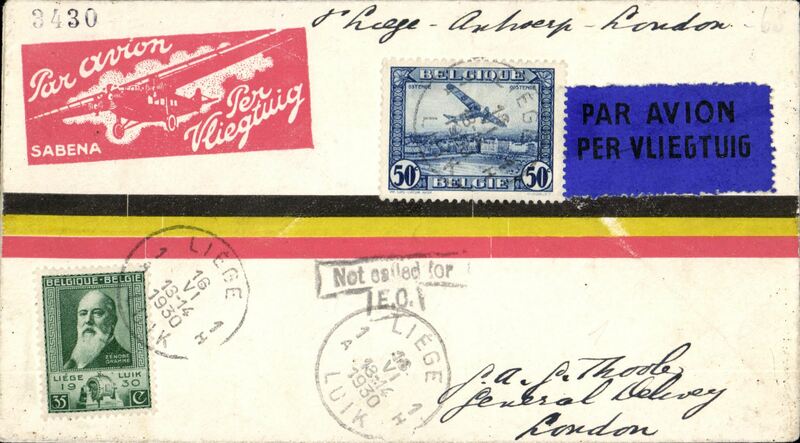 Unlisted inaugural flight Ostende to Paris, Bourget Aviation 15.5.28 arrival cds on front, plain cover franked 2F10 canc Ostende 15.5.1928 tying trilingual black/blue airmail etiquette, black/orange First Flight Premier Vol/1. 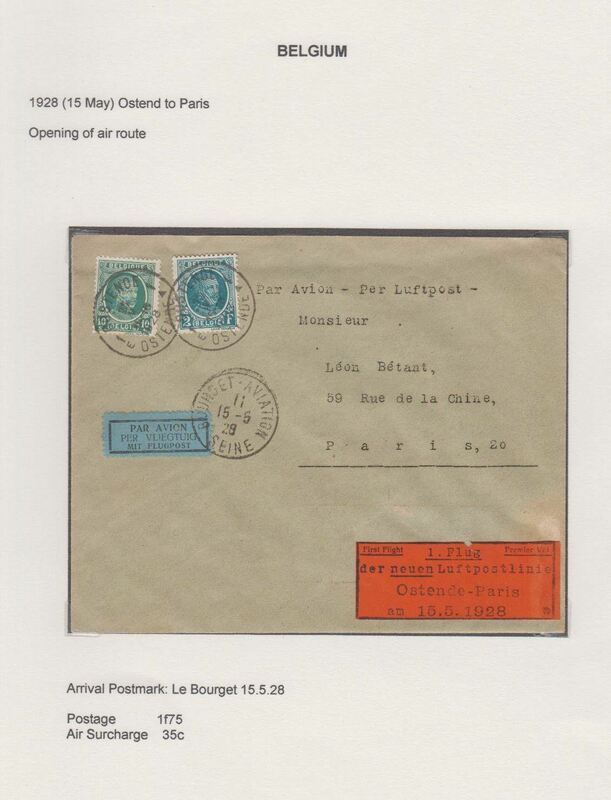 Flug/der neuen Luftpostlinie/Ostende-Paris/am 15.5.1928" (The new airmail line/Ostende-London). 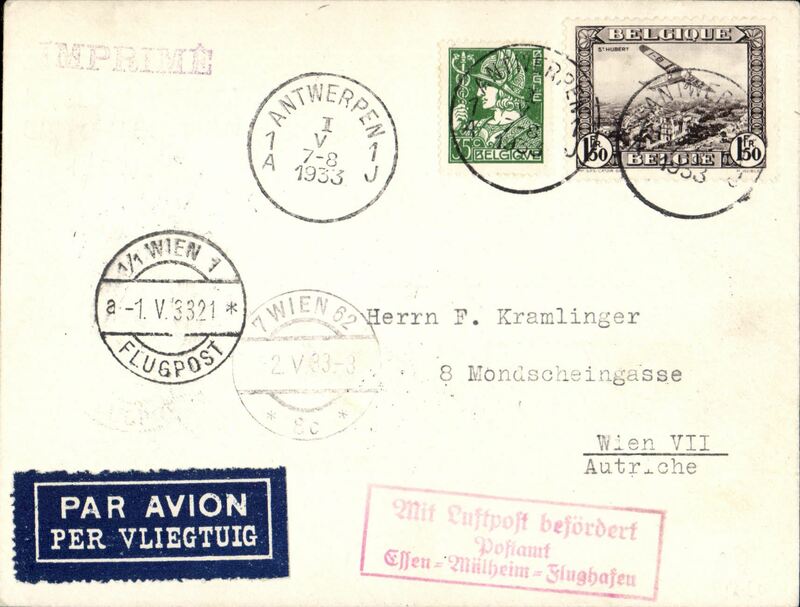 Antwerp to Vienna, 15/5 arrival ds on front, scarce F/F of the Antwerp-Vienna leg of the Ostend-Brussels (Antwerp)-Koln-Munich- Wien service, plain cover franked 4F90c, canc Antwerpen 15.V.28, red 'Nur Mit Flugpost, red framed 'Mit Luftpost befordert/Postampt Nr 1 Stuttgart, and black framed bilingual 'Per Vliegtuig' hand stamps. See flight 28.15 'Der Flugpost von Osterreich', RF Kohl 1998, Cat 700 Punkt (£260 GBP). 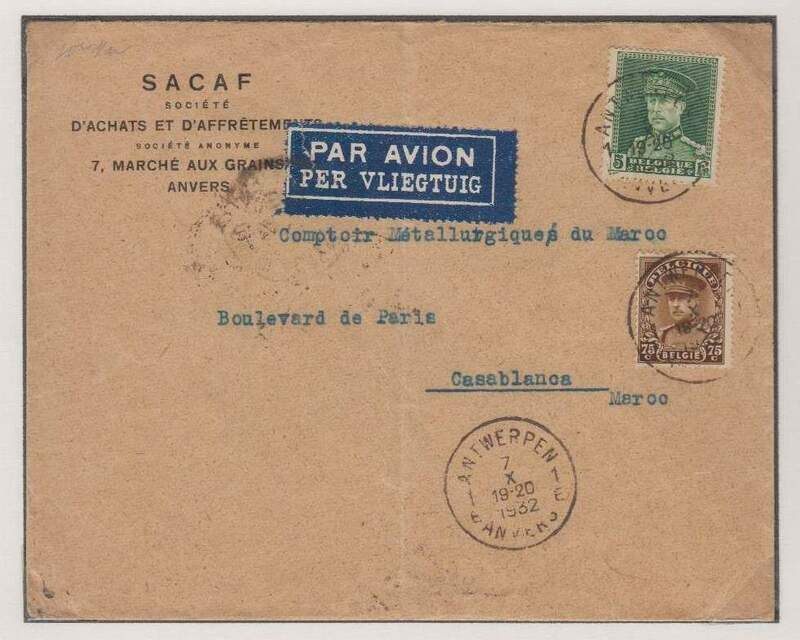 Lignes Farman/Compagnie GeneraleAeropostale, Belgium to Morocco, bs Casablanca 17/3, company corner cover franked 1F75 overseas postage + 2f (10g) air surcharge, black framed bilngual 'Par Avion'hs. Exhibition quality cover written up on display page. Sabena F/F Antwerp to Hamburg, carried on the new Brussels-Anvers-Essen-Hambourg service, PC franked 149c, canc Antwerp cds, red three line 'Mit Luftpost/befordert/Hamburg 1' arrival, Godinas A29 1250Bf, Mu98 3000Ff., scarce. Image. Belgium to Sweden, Ixelles to Malmo, bs Luftpost 20/9, B&W PPC showing Tomb of Unknown Soldier, franked 1f postage (postcard rate) + 2F50 airmail surcharge, boxed bilingual 'Par Avion/Per Vliegtuig' hs. Likely flown by LIgnes Farman. 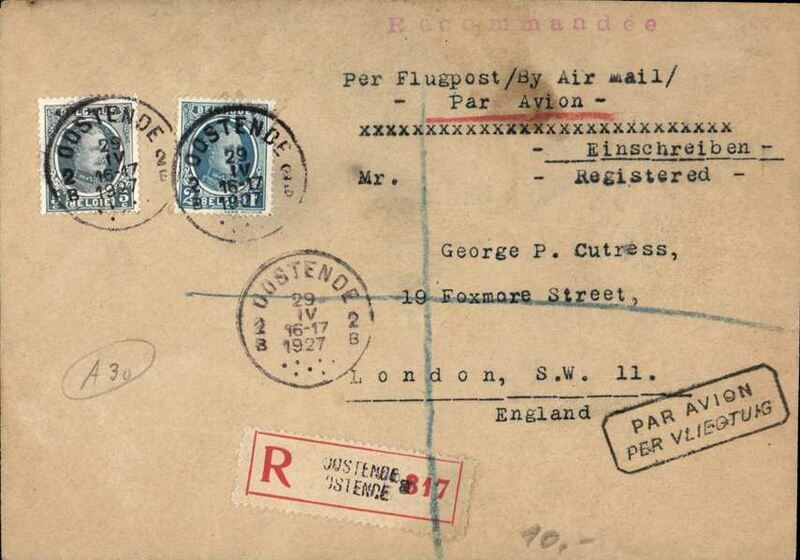 First experimental night flight, Brussels to London, no arrival ds, registered (label) cover franked 1.75f x2, violet three line "First Night Flight/Brussels-London/April 14 1930" vachet, dark blue/black airmail etiquette. 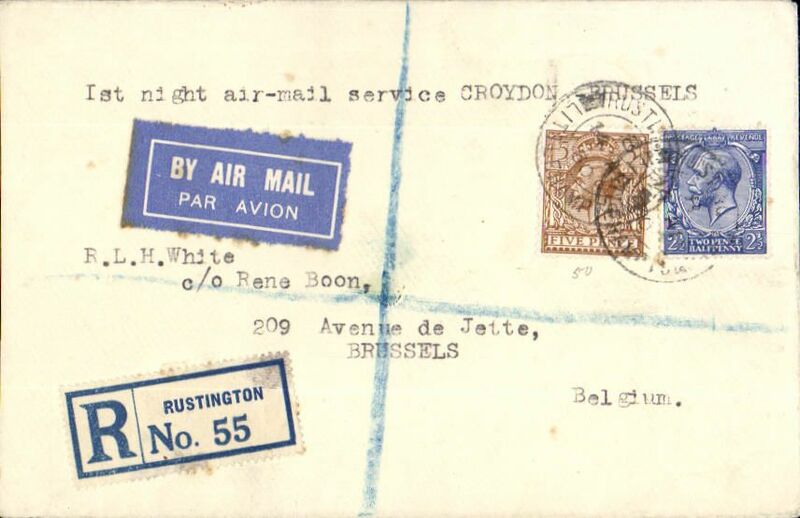 SABENA/Imperial Airways 1st night flight London to Brussels, no arrival ds, registered airmail etiquette cover franked 7 1/2d, typed "1st night air mail service Croydon-Brussels". Sabena/Imperial AW first night flight, Brussels to London, sepia PPC of the 'Ecole Veterinaria'. 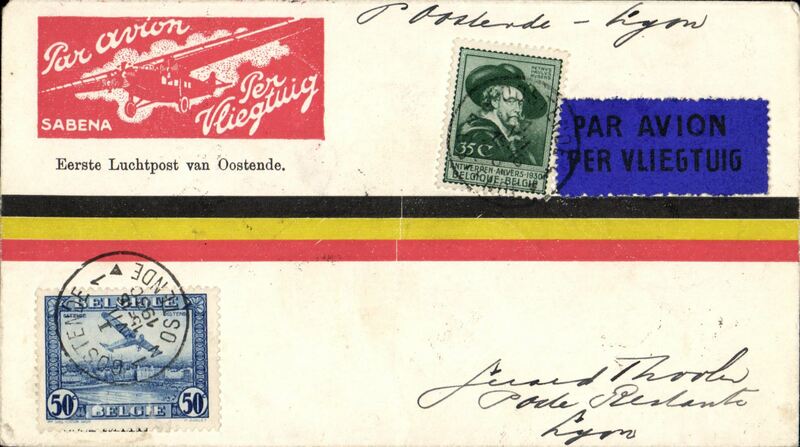 franked 35c fine black two line strike 'Premier Vol de Nuit/Bruxelles-Londres', and fine red three line strike 'Premier Vo De Nuit/Bruxelles-Londres/14-15-IV-1930, Mu 102a 750 Ff. Image. 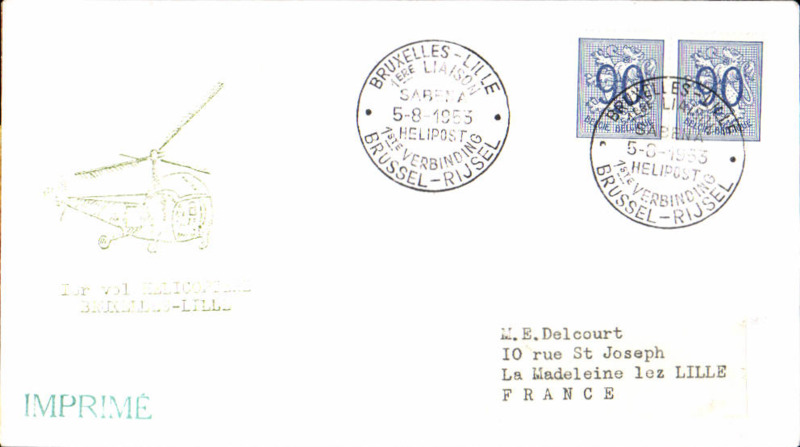 F/F Ostende to Paris, bs Paris Gare du Nord 1/7, tricolour commemorative cover franked 85c, Mu 105 800. Image. 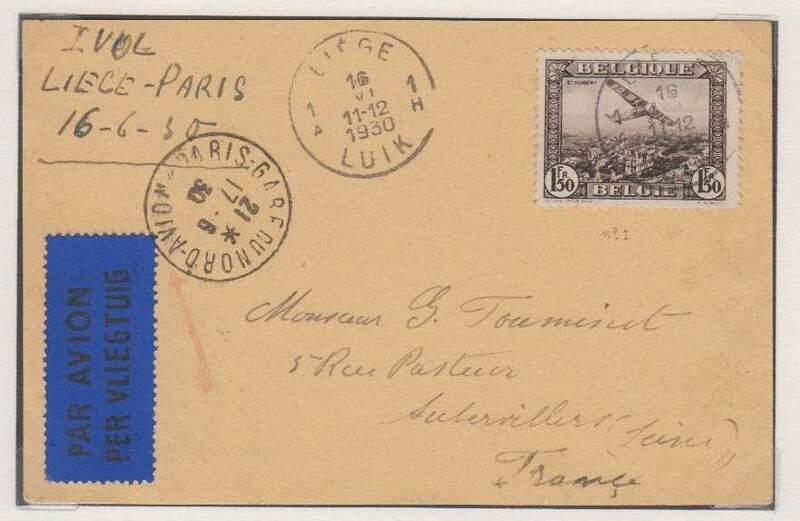 F/F Ostende-Paris-Marseille, bs 3/7, via, bs Paris Gare du Nord 1/7, tricolour commemorative cover franked 85c, Mu 105, 800. Image. F/F Liege-Brussels-London, bs London Chief Office 18/6, Service Special De L'Exposition de Liege, Godinas A41, Mu104 3000, scarce. Image. F/F Liege-Brussels-London, bs Liverpool 18/7, Service Special De L'Exposition de Liege, Godinas A41, Mu104, 3000, scarce. Image. 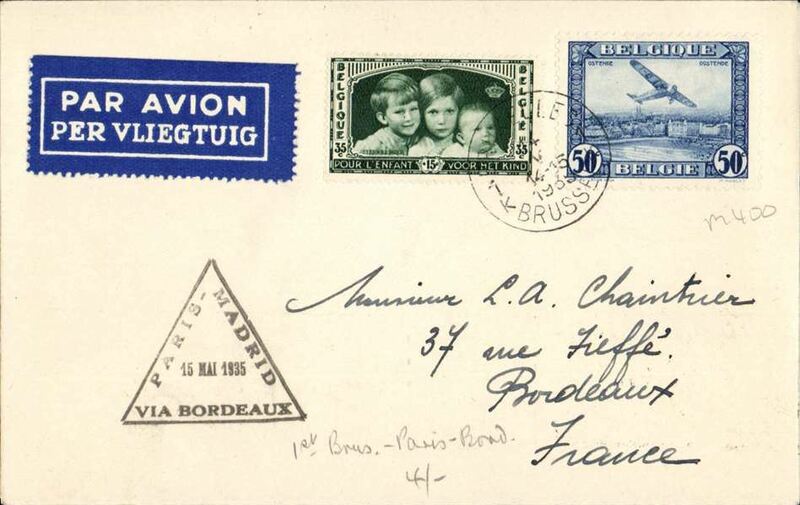 Liege to Paris, bs 17/6,' Service Special de L'Exposition de Liege', plain cover franked 1F50 canc Liege cds, Paris/Gare du Nord Avion/17.6.30 arrival cds verso, light brown/dark brown Liege 1930 Expo International vignette, Mu 103, 75 flown, 750. 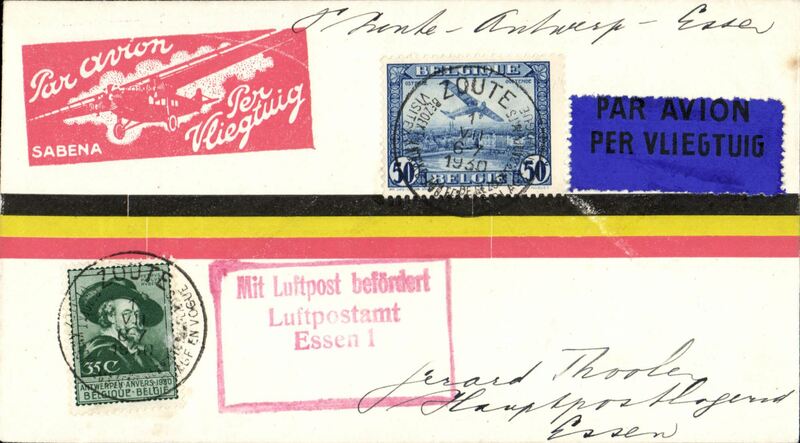 Sabena F/F Zaute to Essen, a scarce intermediate stage on the route to Cologne, Sabena cover franked 85c, canc Zoute cds, nice strike red framed arrival cachet, "Mit Lufpost befordert/Luftpostamt/Essen 1", dark blue/black airmail etiquette. 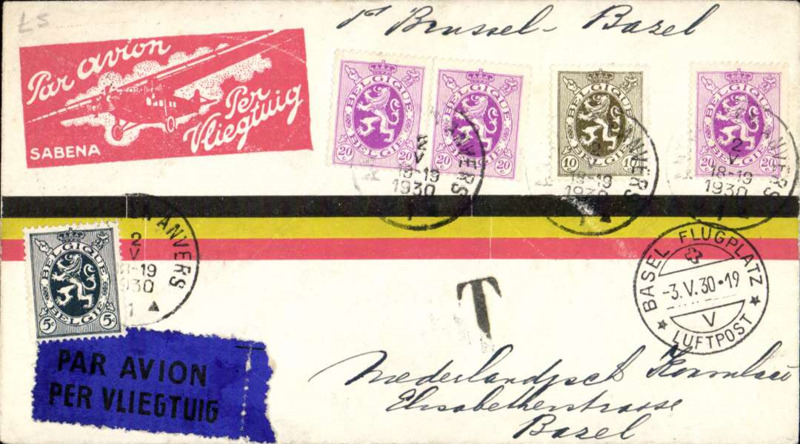 Belgian acceptance for KM F/F Amsterdam-Batavia, registered label cover franked 7.5F, canc Bruge cds, arrived Weltevreden 4/10 cds verso, returned from Weltevreden 18/10, arrived back underpaid to Gent/Gand 15/11 cds tying 30c postage due. Nice item. Image. 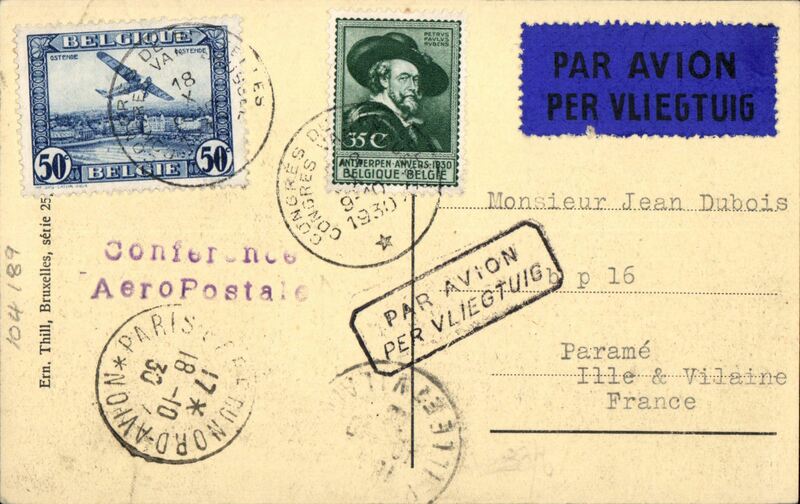 Brussels Conference Special Flight, flown Brussels to Paris, bs,sepia PPC with viewof Anvers verso, franked 85c, special Conference cancellation, two line 'Conference/ Aeropostale' cachet, framed 'Par Avion' hs, Mu 111, 1250. Image. Very fabry and Vanderlinden interrupted flight, Brussels-Leopoldville, bs 15/12, flight interrupted near Alicante for repairs, Ni 301208. Registered (label) cover correctly rated 5F air surcharge, 1.25F basic postage, 1.75F Reg fee, red flight cachet. Then flown on by a Sabena internal flight en route to final destination Likasi-Panda, 20/12. Nice routing. Faint ironed non invasive fold, 2cm from bottom edge, does not detract, see image. Fabry and Vanderlinden interrupted flight, Brussels to Matadi, bs 19/12, via Leopoldville,bs15/12 . The flight was interrupted near Alicante for repairs, Ni 301208. 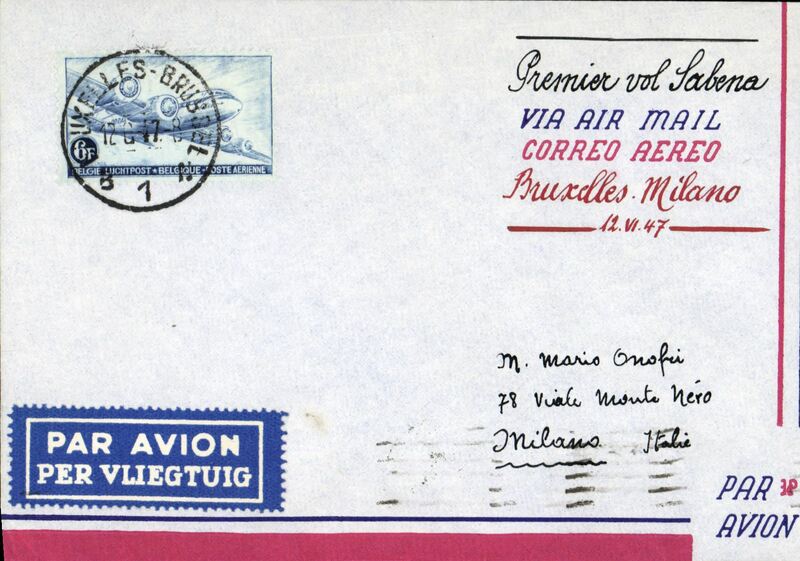 Purfina corner cover franked Belgium 5F Air+1F45 ordinary, red flight cachet. Imperial Airways, intended Belgium acceptance for Kenya for carriage on first London-East Africa service. 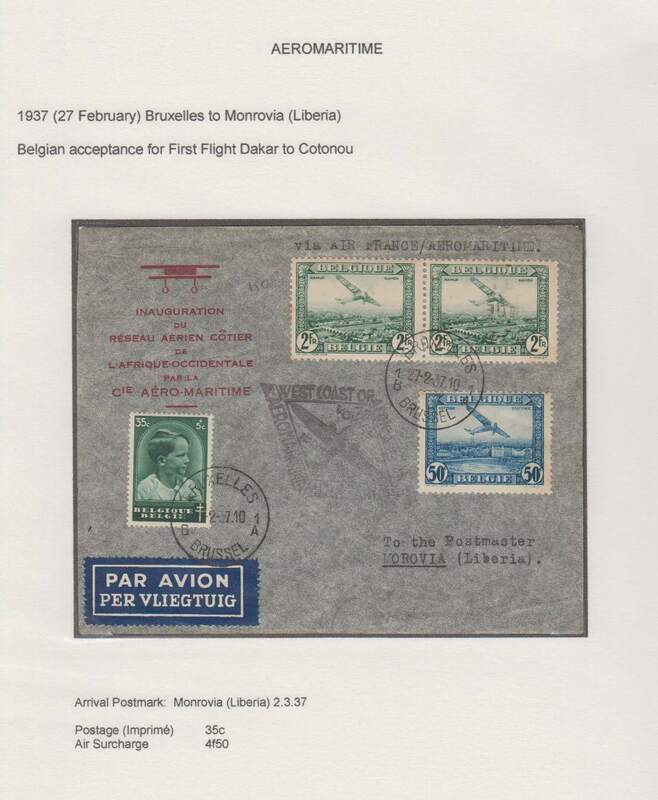 However this cover caught the second flight arriving Kisumu 15/3, via Alexandria 11/3, franked 5F air and 75c ordinary canc Brussels cds, buff imprint 'A#Via Air Mal' cover, Imperial AW/Airways House/London hs verso. 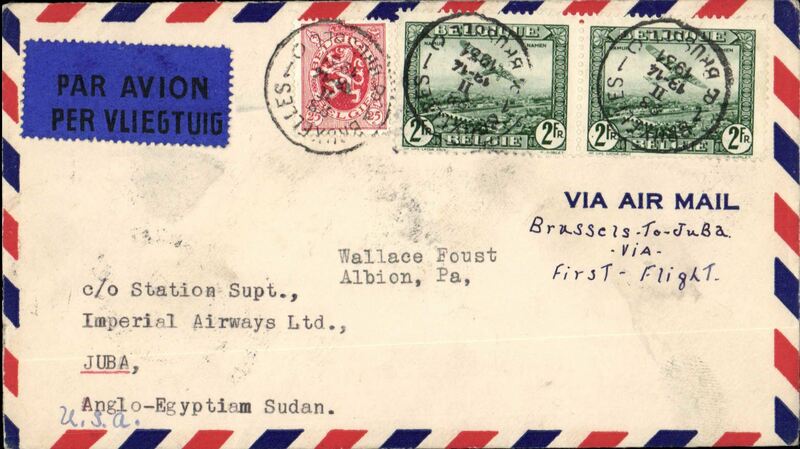 Imperial Airways, intended Belgium acceptance for Sudan for carriage on the first London-East Africa service, however this cover caught the second flight arriving Juba, 14/3, via Cairo 11/3, airmail cover franked 1930 2d air x2, 25c ordinary, canc Brussels cds, Imperial AW/Airways House/London hs verso. 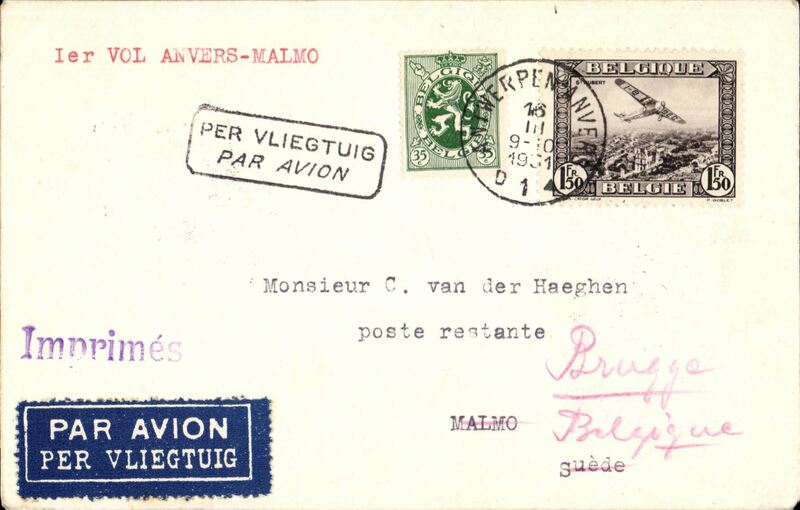 Antwerp to Malmo survey flight, bs16/10, plain cover franked 1.50F and 35c surcharge both canc Antwerp cds, red typed '1er Vol Anvers-Malmo', framed Par Avion' hs, Mu 116, 2500. Image. 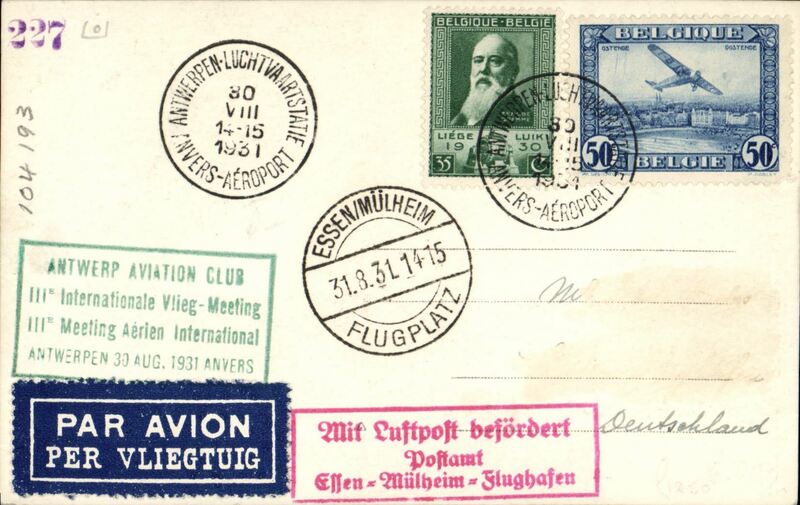 Anvers Aviation Meeting, attractive sepia souvenir PPC showing Sabca/Fokker F.VIIb/3m. 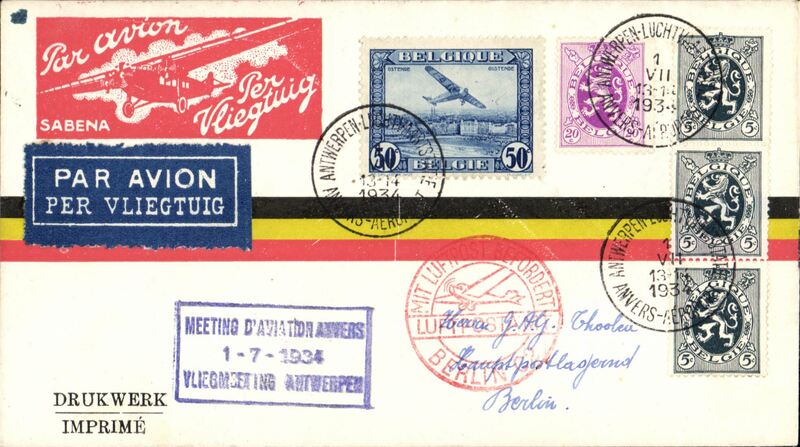 at Antwerp Airport, franked 85c canc special Aviation Meeting cds, flown to Mulheim, 31/8 arrival on front, fine strike red framed 'Mit Luftpost befordert/Pofstamt/Effen-Mulheim-Flughagen' arri8val hs, and fine green framed four line Antwerp Aviattion Club, canc special postmark, green framed 'Antwerp Aviation Club' cachet. Mu 121, 800, Francis Field authentication hs. Nice item, Mu 121, 800. Image. 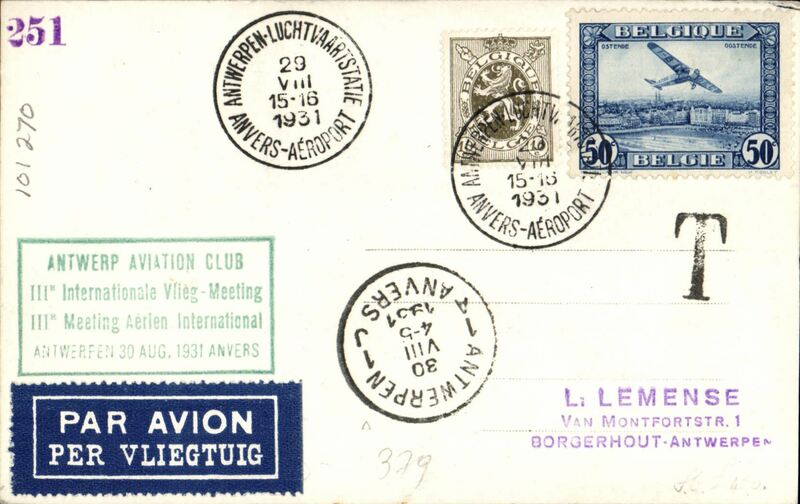 Anvers Aviation Meeting, attractive B&W souvenir PPC showing Anvers Airport, franked 60c canc special postmark, green framed 'Antwerp A viation Club' cachet. 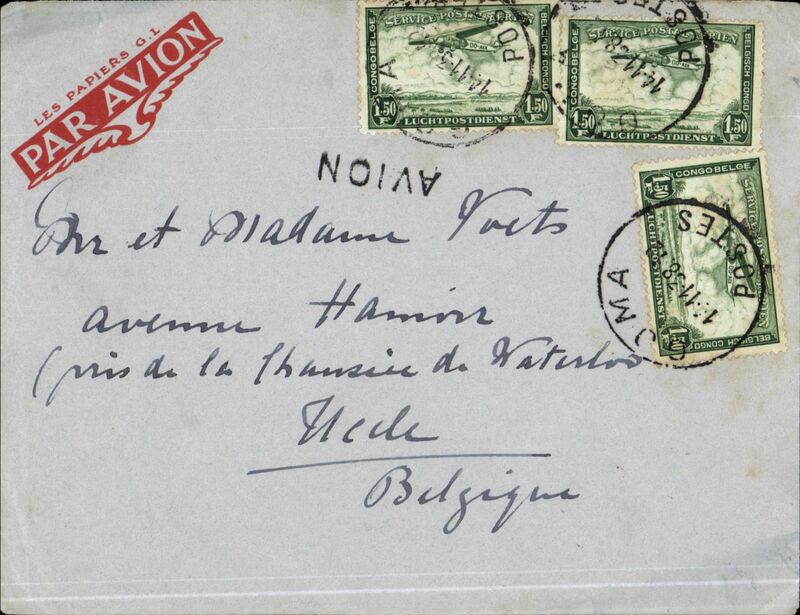 Belgian acceptance for Djakarta, bs 26/10, via Batavia 25/10, Koning cover franked 10F canc Antwerp cds, uncommon. Image. 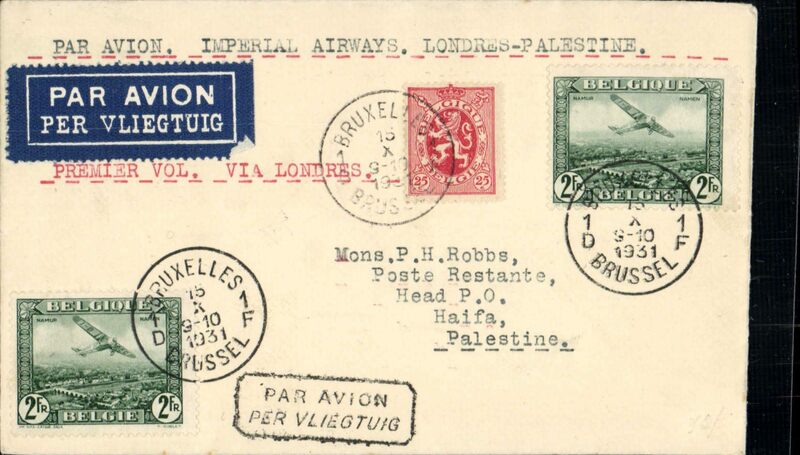 Belgium acceptance for Imperial Airways F/F London to Palestine, bs Haifa 20/10, opening of new winter timetable via Tiberias, airmail etiquette cover franked 2F air x2, 25c ordinary, canc Bruxelles cds, typed "Par Avion Imperial Airways Londres-Palestine". Opening of the Alexandria-Haifa service, Athens-Haifa-Baghdad in one day. Scarce item. 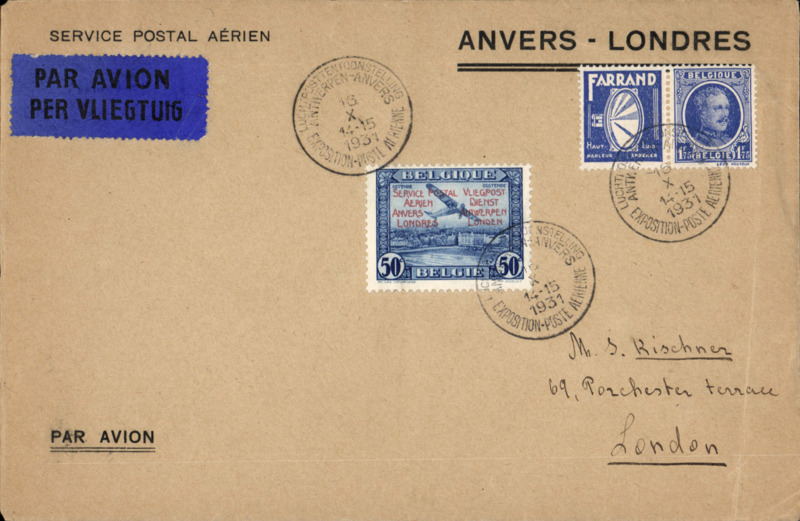 Antwerp to London flight from the Antwerp Aerophilatelic Exhibition, souvenir cover franked 50F air with an illegal red bilingual opt 'Service Postal/Azerien/Anvers/London and 1F75 paired with 'Farrand' ? 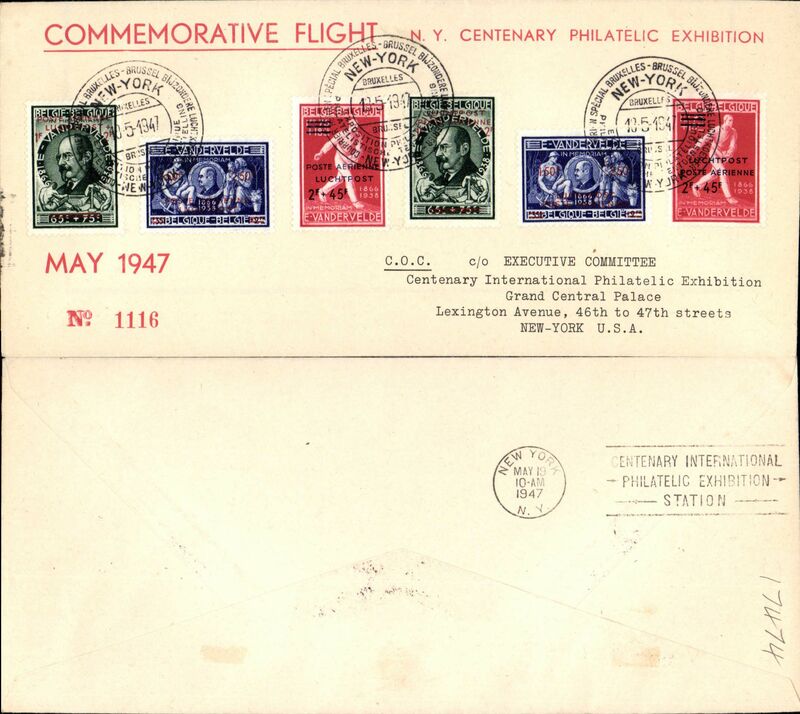 Expo propaganda stamp, both canc special Expo postmark dated 16/10/1931. Image. 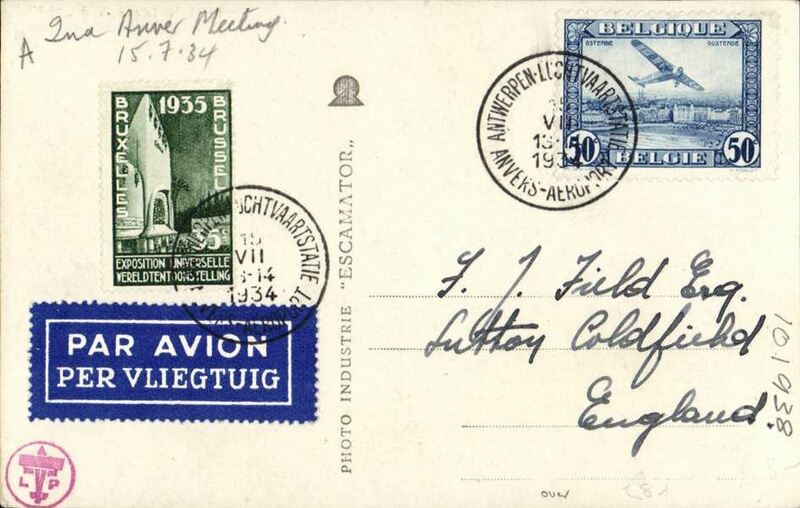 Antwerp Aviation Meeting Aerophil, special flight Antwerp to Malmo, 16/10 arrival cds on front, special souvenir PPC with most attractive blue.red white/cream picture of trimotor in flight, franked 1.50F and 35c surcharge both canc fine strikes special Expo postmark. Mu 122, 750. Image. 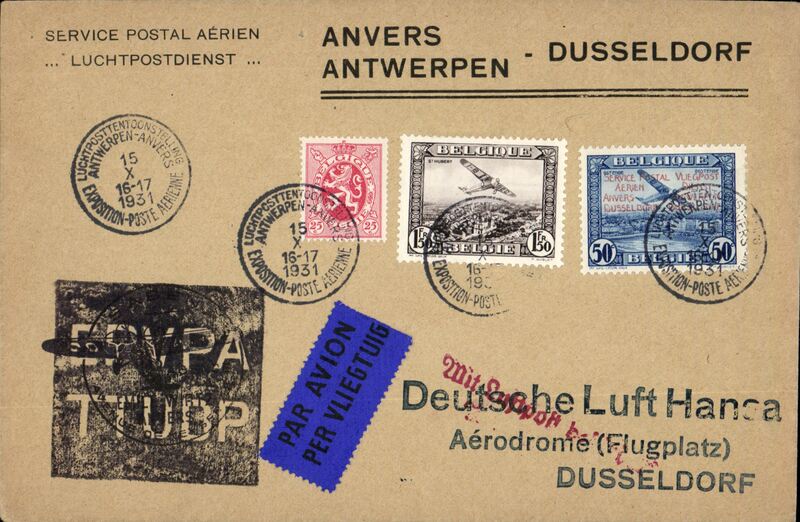 Antwerp Aviation Meeting, special flight Antwerp to Dusseldorf, bs 16/10, also red receiver, souvenir cover with special depart cds, flight cachets front and verso, franked 1.50F inc 50c with special flight overprint..
First Belgium acceptance of mail for South Africa, bs Cape Town 21/12, carried on IAW Christmas flight England to South Africa, Springbok cover franked 7.25F, Imperial Airways. Image. 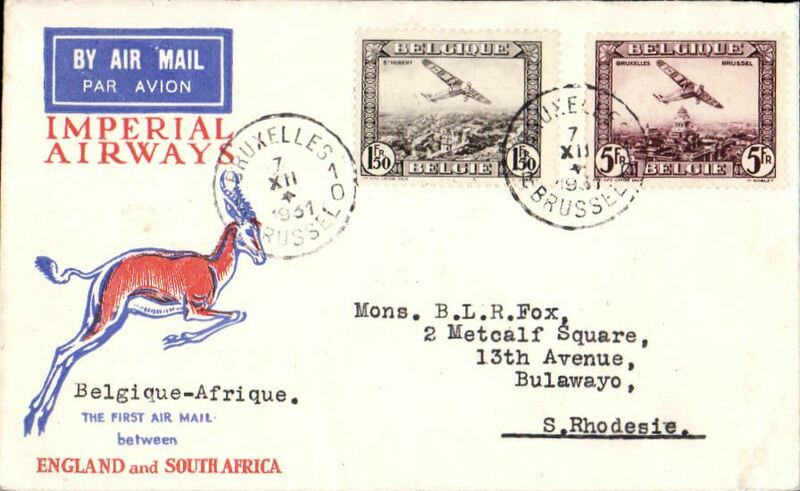 First Belgium acceptance of mail for Southern Rhodesia, carried on IAW Christmas flight England to South Africa, Brussels to Bulawayo, bs 20/12, Springbok cover franked 6.50F, Imperial Airways. 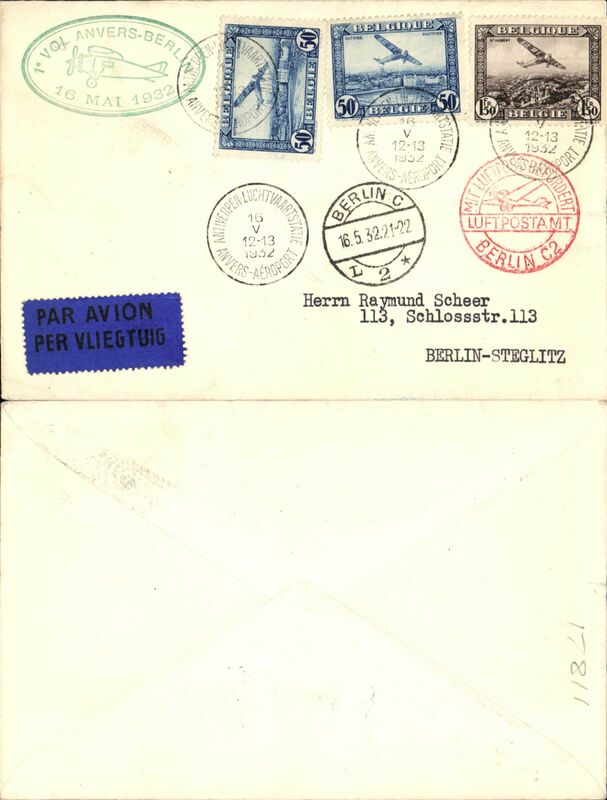 Sabena F/F Antwerp to Berlin, Berlin C/L2 arrival ds on front, plain cover franked 1F50c air, and 50c airs x2, red circular 'Mit Luftpost Befordert/Berlin C2' receiver, green oval "1e Vol Anvers-Berlin/16 Mai 1932" flight cachet, black/dark blue bilingual airmail etiquette. 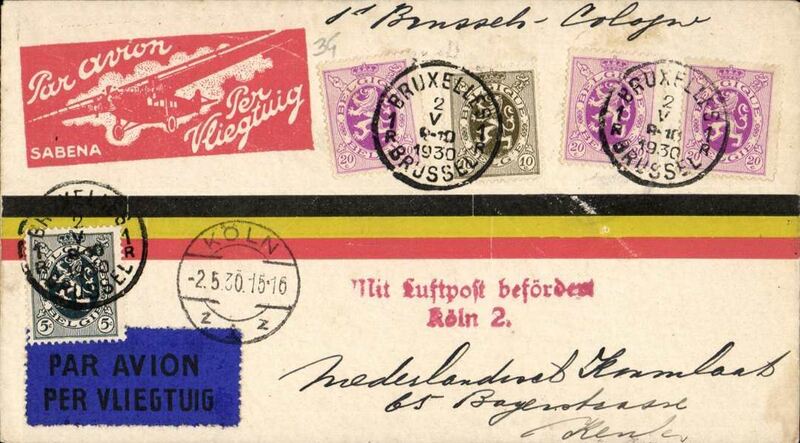 F/F Brussels to Dusseldorf, bs 16/5, plain cover franked 2F50 canc Brussels cds, red two line Dusseldorf arrival hs. Image. 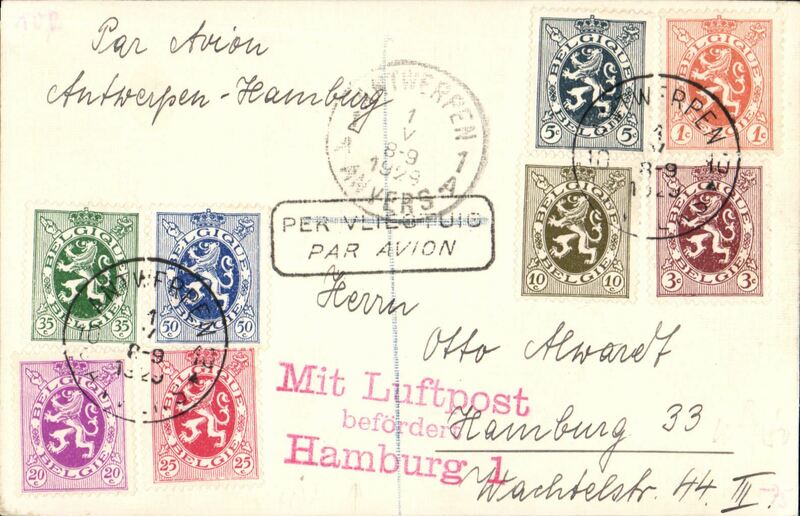 F/F Brussels to Berlin, 16/5 arrival ds's front and verso, plain cover franked 85c canc special 'Anvers Airport' postmark, fine red Luftpostampt /Berlin C2 hs on front.. Francis Field authentication hs. Image. 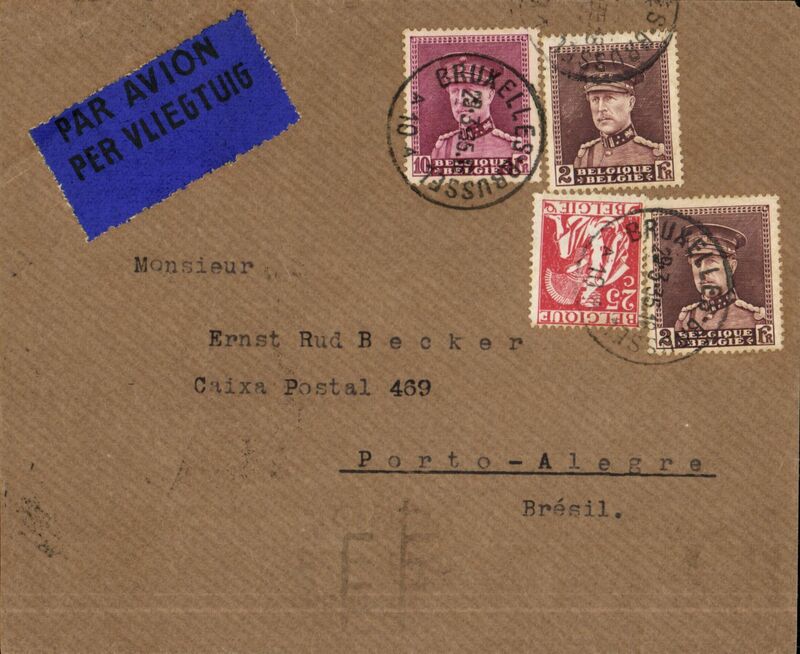 Antwerp to Casablanca, bs 9/10, company corner cover franked 1F75 overseas postage + 4F (20g) air surcharge, dark blue/white bilingual airmail etiquette. 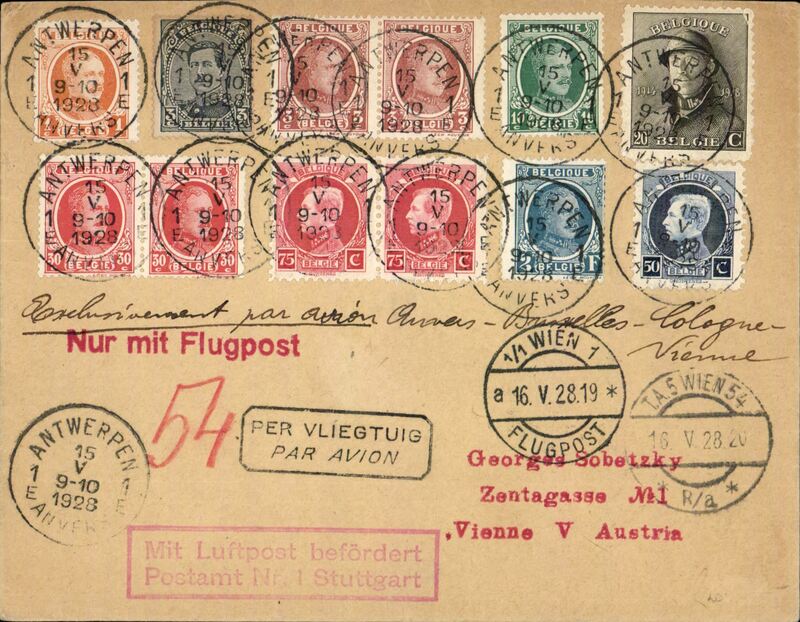 F/F Brussels-Essen/Mulheim-Vienna, plain cover franked 1F85, canc Antwerp cds, Vinna 1/5 arrival cds on front, fine strike red three line framed 'Mit Luftpoft.......Essen/Mulheim-Flughafen' receiver...... Image. 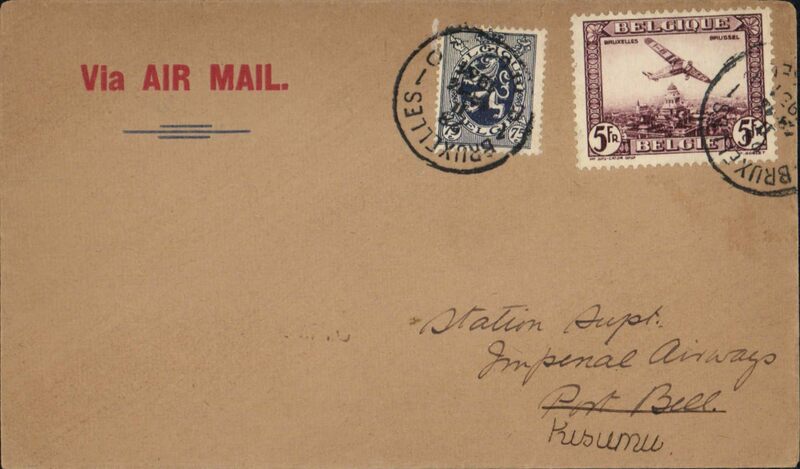 Imperial Airways/Societe de Transport du Katanga, Etterbeek, Belgium to Katanga via Elisabethville 28/5, airmail etiquette cover franked 7.25F, ms 'Par Avion/Imperial Airways', Flown IAW to Broken Hill, then Societe de Transport du Katanga to Elisabethville. Irned vertical crease. 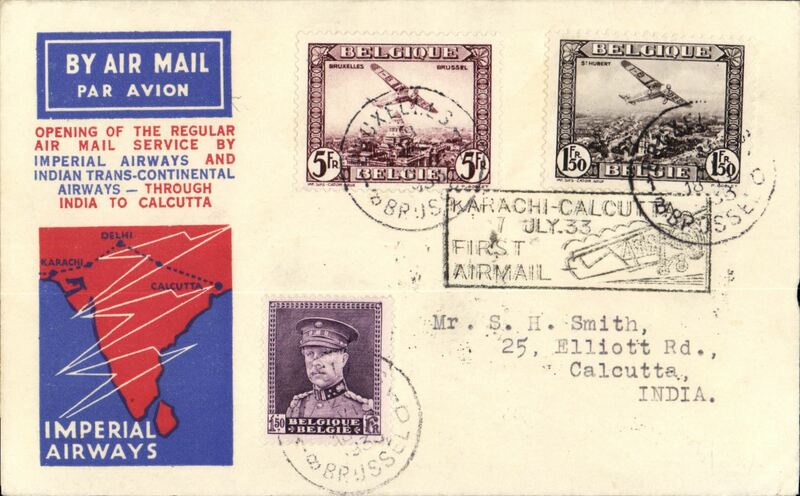 Belgium acceptance for the first regular Imperial Airways/India Trans-Continental Airways service from London to Calcutta, b/s 9/7, via Karachi 7/7, red/white/blue 'speedbird' cover franked 6F50 airs & 1F50 ordinary, canc Brussels cds, black boxed rectangular "Karachi-Calcutta/7 Jul 33/Fist Airmail" arrival cachet verso, Francis Field authentication hs and Stephen Smith signature..
F/F Le Zoute to Rotterdam, bs 1/7 , franked 85c, tied special cancel, KLM. 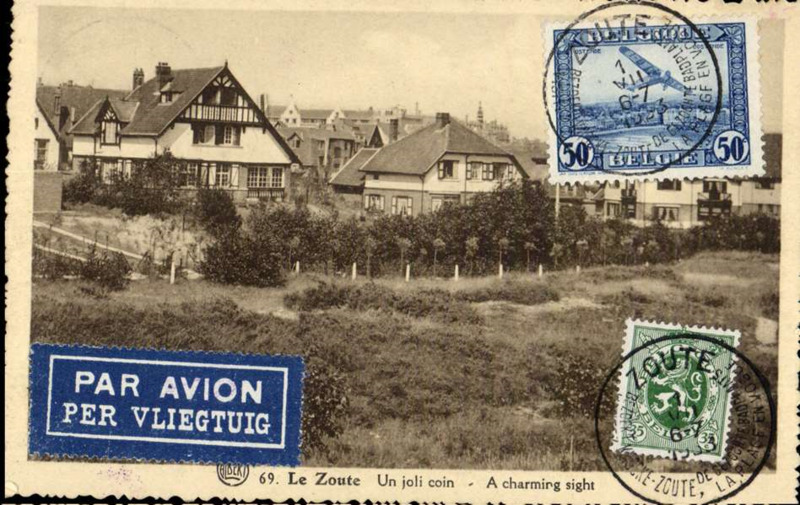 F/F Le Zoute to Rotterdam, bs 1/7 , sepia PPC of Le Zoute franked 85c, tied special cancel, KLM. 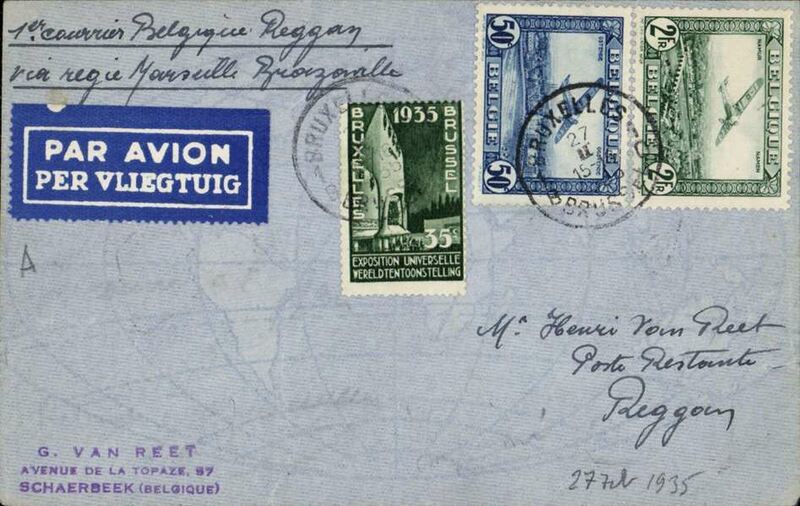 First Belgium acceptance for Imperial Airways extension to Rangoon, Brussels to Akyab 1/10, franked 6F 75c canc Brussels cds, via Paris 23/9, official blue/yellow "map" cover, Imperial Airways/ITCA. 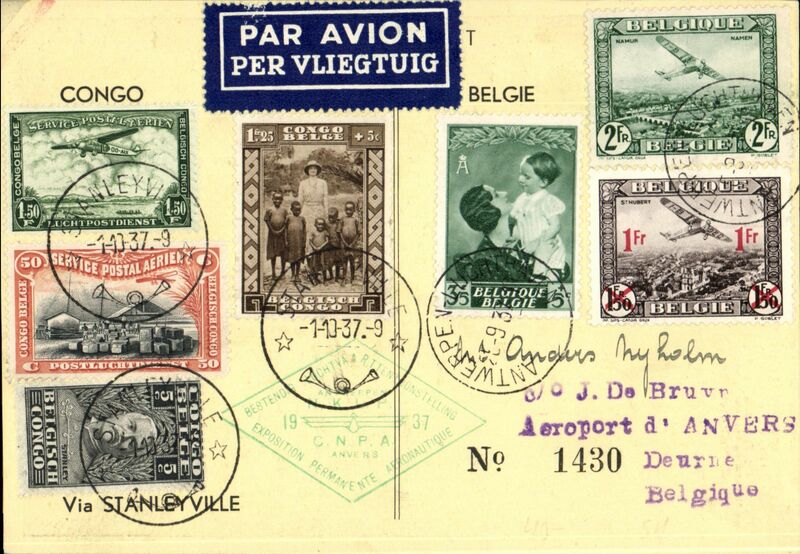 Guy Hansez survey flight, round trip, Brussels-Leopoldville(bs 28/3), plain cover franked Belgium 5Fair and 1.5F ordinary, red boxed official flight cachet, dark blue/white etiquette, ms 'Raid aviateur Hansez'. Flight financed by Sabena, Antwerp Aviation, and the Ministry of Transport. 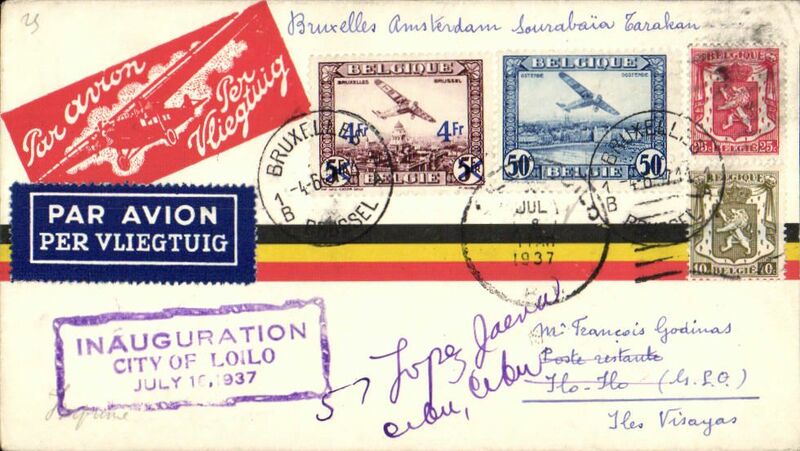 Liege Aviation Meeting, special exhibition label, red Lufthansapost cds, cachet ds, blue/white 'per vliegtuig' etiquette, b/s, official cacheted pc, blue/black/white Meeting vignette. 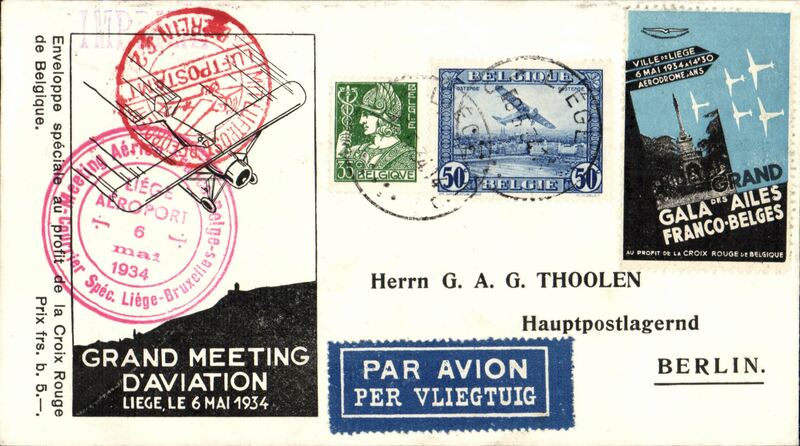 Liege Aviation Meeting, special exhib label, red Lufthansapost cds, cachet ds,per vliegtuig etiquette, b/s, official cacheted pc, meeting vignette tied by Liege cds. 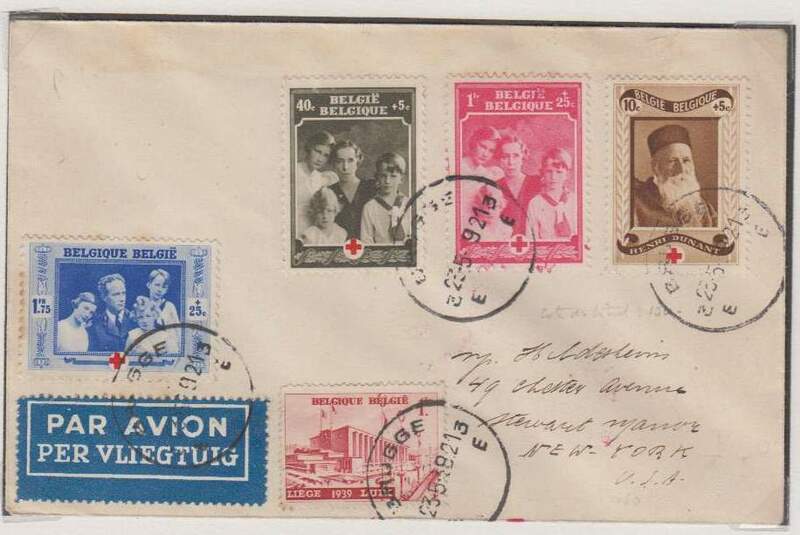 Antwerp Meeting, special flight Antwerp to Berlin, b/s, also red dr C2 receiver on front, special cachet, franked 55c canc aerodrome pm, company cover with imprinted red/whit "Trimotor" etiquette. 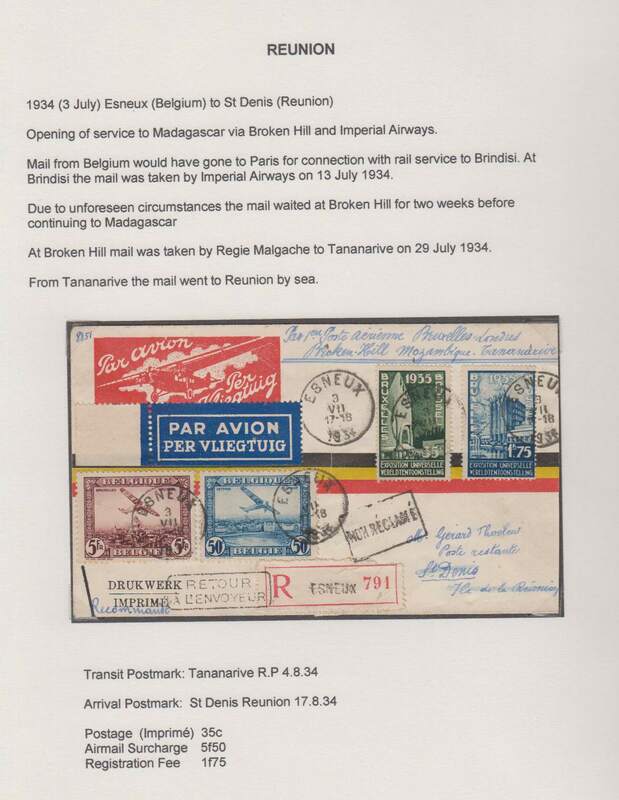 Rare acceptance for Reunion for carriage on the opening service to Madagascar via Broken Hill and Imperial Aireays, Esneux, Belgium to St. Dennis 17/8, via Tananarive P 4/8, registered (label) red/white imprint airmail etiquette cover correctly franked 35c postage, 5F50 air surcharge and 1F75 registration. Exhibition quality cover written up on display page. 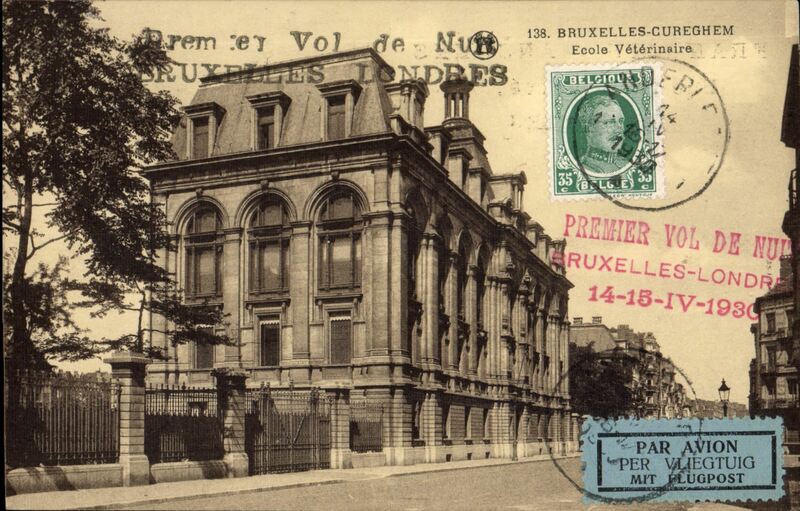 First Belgium acceptance for the Broken Hill- Madagascar Feeder Service, Brussels to Tananarive, 4/8, via Paris 4/7, franked 7.25f, ms "Via Londres Broken Hill", plain etiquette cover. 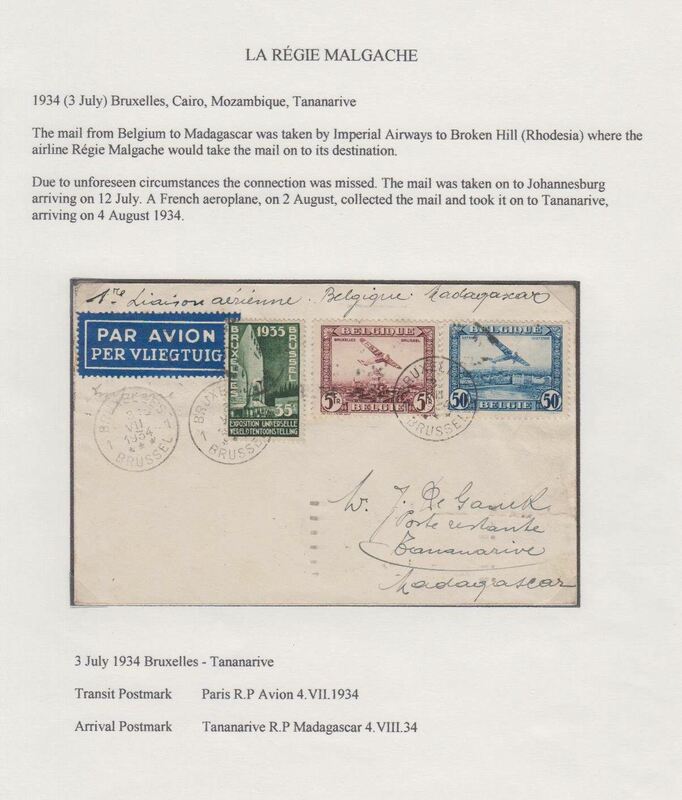 The connection of the flight at Broken Hill with Regie Malgache was missed, so mail taken to Johannesburg arriving 12 July. 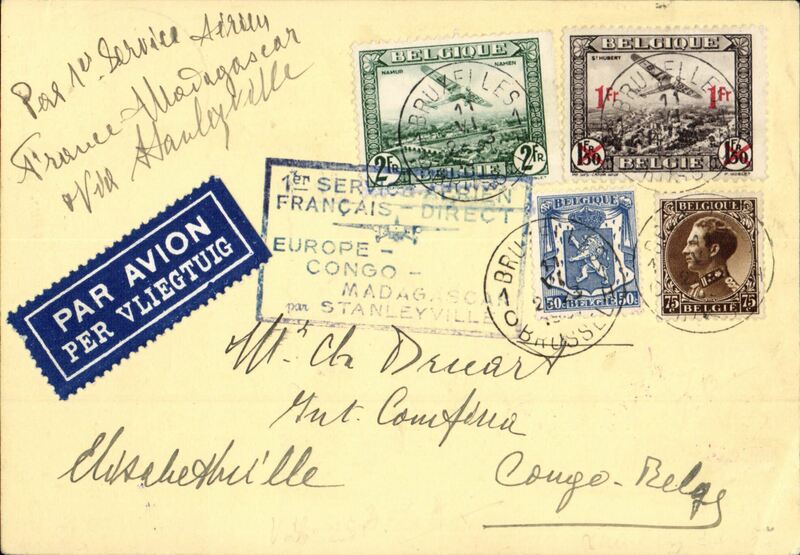 On Aug 2 a French plane collected the mail and took it on to Tananarive. Mu 169. Exhibition quality cover written up on display page. 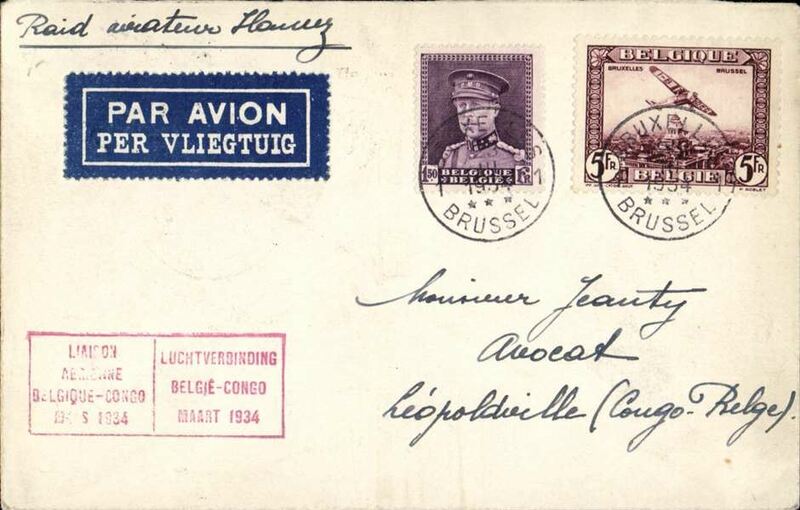 2nd Antwerp Meeting, franked 50c air canc special cds, B&W ppc addressed to England with picture of Antwerp airport.. Francis Field authentication hs verso. 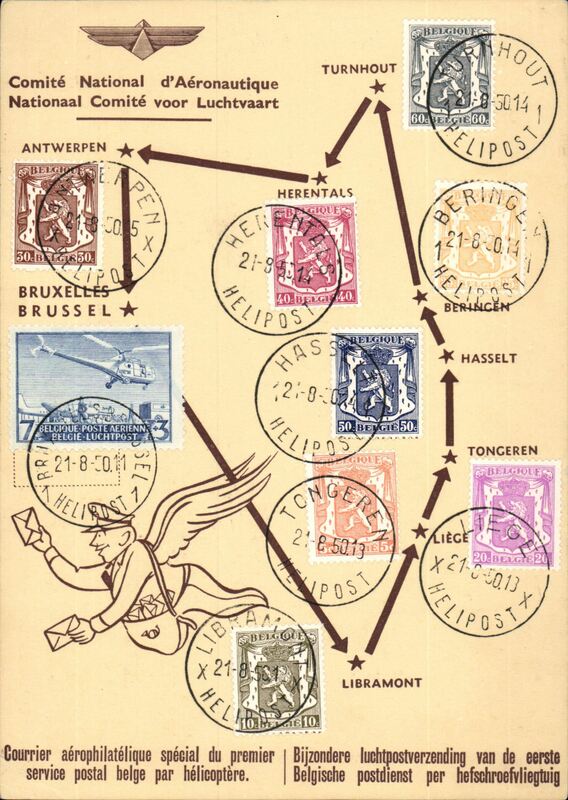 Brussels to Rome, bs 31/7, via Berlin 31/7 transit cds, franked block of four 75c canc Brussels cds, also tying airmail etiquette, fine strike red 'Luftpostampt/Berlin C2' hs. 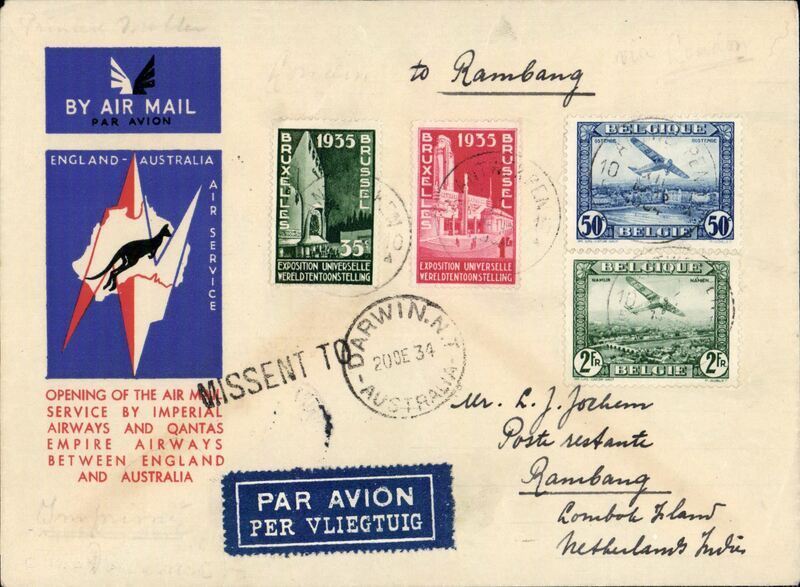 Rare first acceptance of mail from Belgium for Sumatra for carriage on the inaugural Imperial Airways/ITCA/Qantas regular service from London to Australia, Antwerp to Rambang, bs Laboeanhadji 21/12, official red/white/blue Kangaroo souvenir cover franked 3F 85c. Addressed to Rambang, but carried over to Darwin (19/12 ) where ‘Missent to’ and Darwin 20/12 pmk applied prior to return to Sumatra. Uncommon item in fine condition. 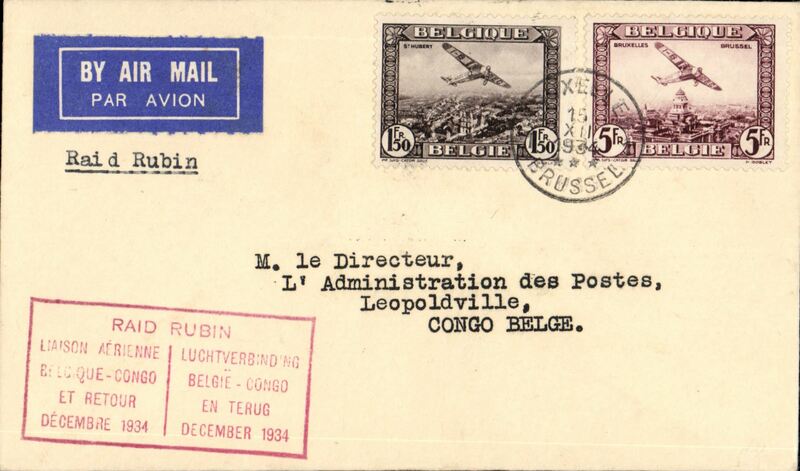 Raid Rubin record flight in DH Comet by Waller & Franchome, from Belgium-Congo in 22hrs, Brussels to Leopoldville, bs 22/12, boxed red special flight cachet, typed 'Raid Rubin', very fine. Image. 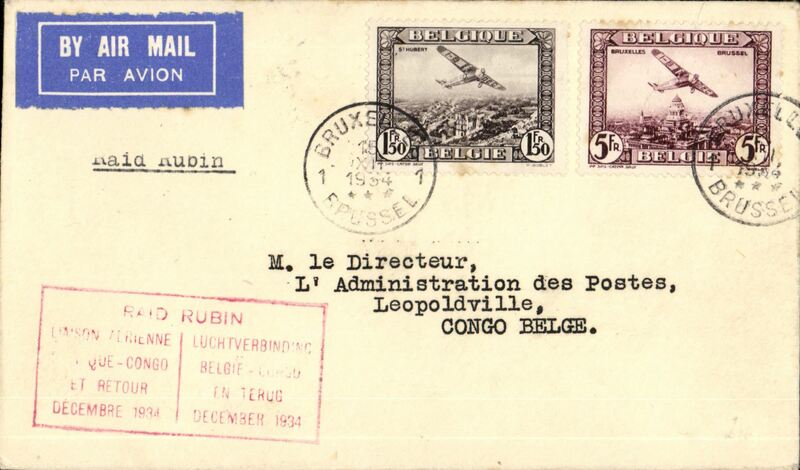 Raid Rubin record flight in DH Comet by Waller & Franchome, from Belgium-Congo in 22hrs, Brussels to Leopoldville, bs 22/12, boxed red special flight cachet, plain cover franked 6F50, typed 'Raid Rubin' cachet. 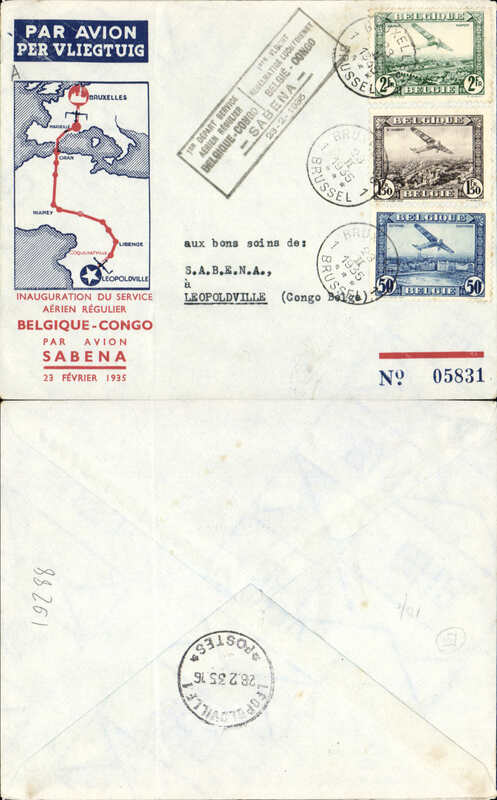 Sabena first GB acceptance for the Belgian Congo for carriage on the first regular Sabena Brussels-Leopoldville service, London to Brazzaville, bs 28/2, via Paris Avion 21/2, plain cover correctly rated 1/3d, cancLondon FS/Air Mail cds, carried by Sabena to Leopoldville, then by ferry across the River Congo to Brazzaville.. Exhibition quality cover written up on display page. 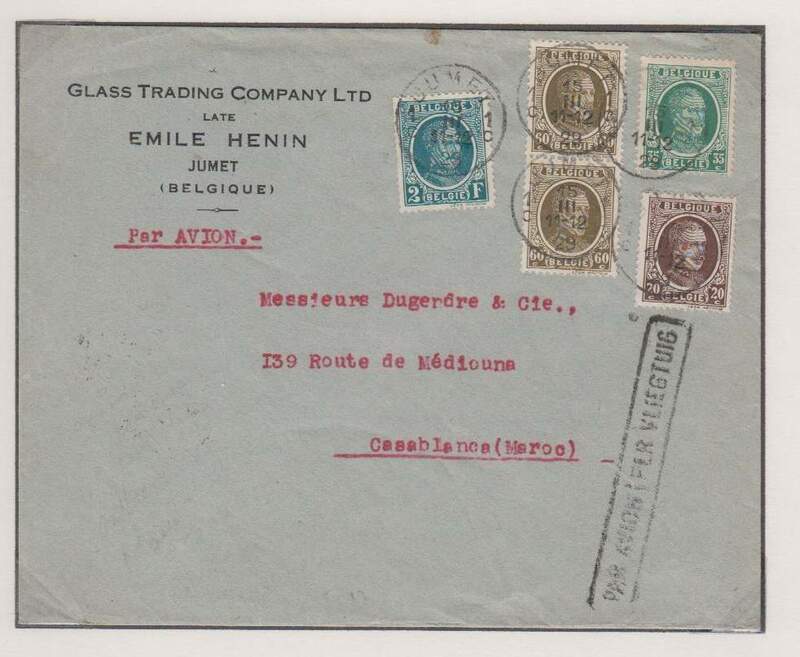 Sabena F/F Brussels-Leopoldville, bs 28/2, blue/red/pale blue souvenir cover franked 2fr,1.50fr and 0.50fr, faint vertical crease, uncommon BLACK framed bilingual French/Flemish F/F cachet. 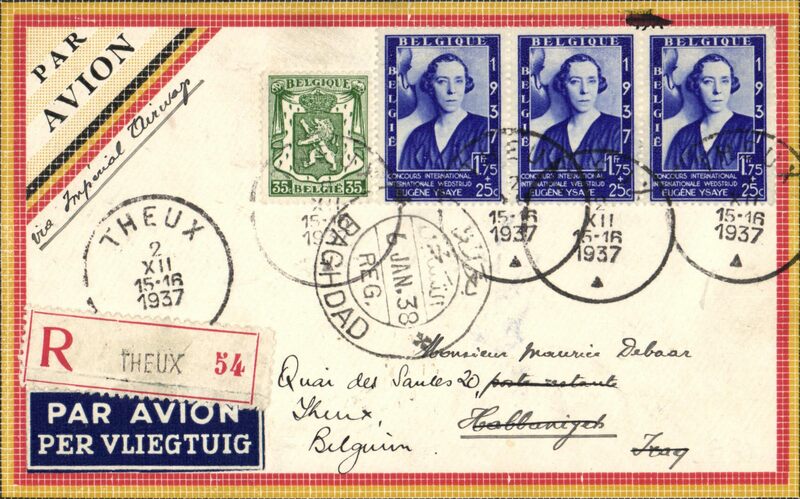 Sabena F/F regular Brussels-Leopoldville service, bs 28/2, blue/red/pale blue souvenir cover franked 2.890F, faint vertical crease, two different framed red flight cachets, one a bilingual French/Flemish F/F cachet. 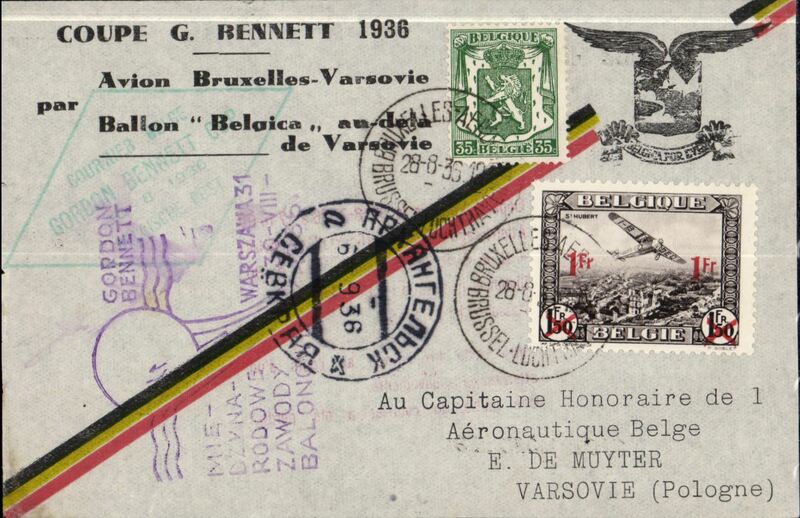 F/F SABENA Brussels-Leopoldville, bs 28/2, and return to Brussels, bs 8/3, souvenir cover carried on the first regular F/F SABENA flight by the aircraft "Edmond Thieffrey" from Brussels to Leopoldville via Marseilles-Oran-Colomb Bechar-Reggan-Gao-Niamey-Zinder-Fort Lamy-Bangui-Coquilhatville, franked Belgium 4F and Congo 4F75 stamps, red framed bilingual French/Flemish F/F cachet. 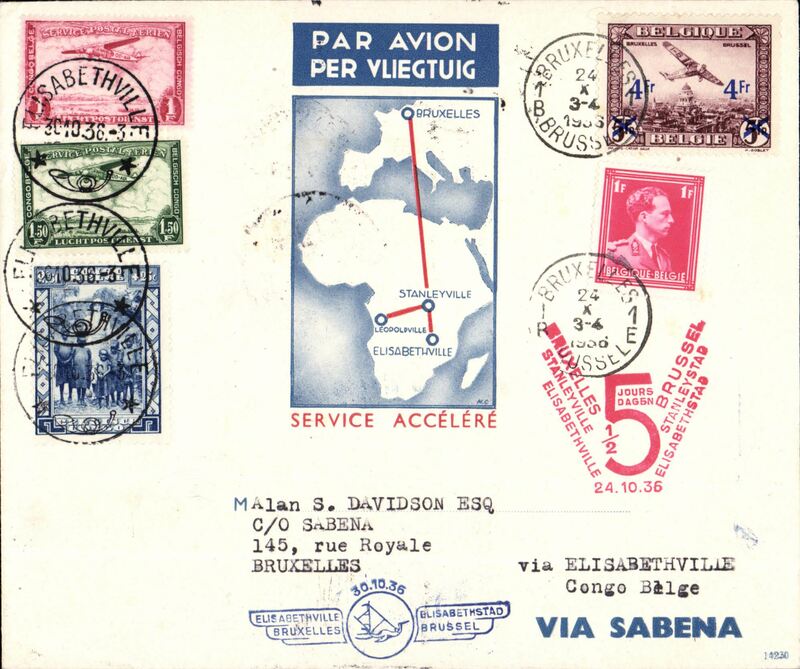 F/F SABENA Brussels-Leopoldville, bs 28/2, and return to Brussels 8/3, souvenir cover carried on the first regular F/F SABENA flight by the aircraft "Edmond Thieffrey" from Brussels to Leopoldville via Marseilles-Oran-Colomb Bechar-Reggan-Gao-Niamey-Zinder-Fort Lamy-Bangui-Coquilhatville, franked Belgium 4F and Congo 4F stamps, red framed bilingual French/Flemish F/F cachet. F/F SABENA Brussels-Leopoldville, bs 28/2, and return to Brussels 8/3, souvenir card with pictures of three crew members with facsimile signatures, carried on the first regular F/F SABENA flight by the aircraft "Edmond Thieffrey" from Brussels to Leopoldville via Marseilles-Oran-Colomb Bechar-Reggan-Gao-Niamey-Zinder-Fort Lamy-Bangui-Coquilhatville, franked Belgium 2F80 and Congo 2F80 stamps, red framed bilingual French/Flemish F/F cachet. 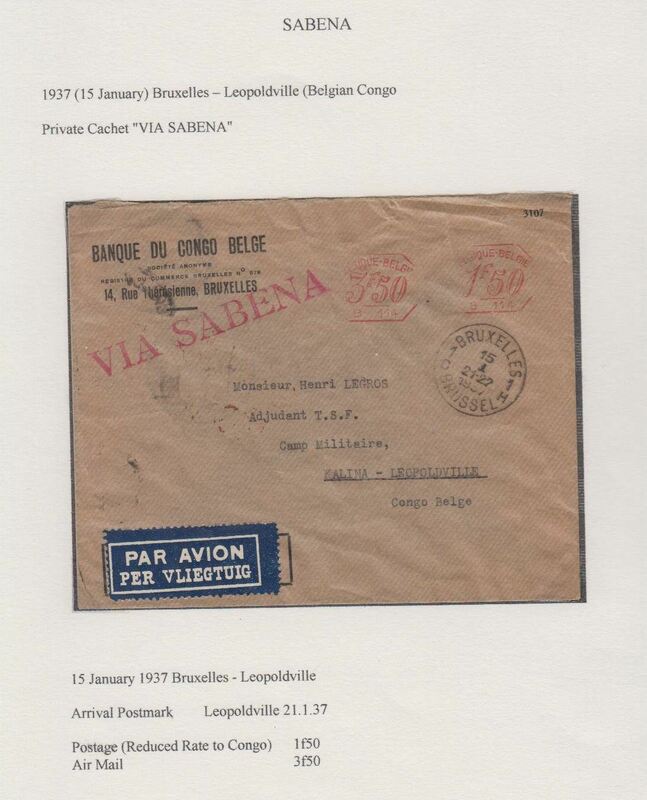 F/F SABENA Brussels-Leopoldville, bs 28/2, and return to Brussels 8/3, souvenir cover carried on the first regular F/F SABENA flight by the aircraft "Edmond Thieffrey" from Brussels to Leopoldville via Marseilles-Oran-Colomb Bechar-Reggan-Gao-Niamey-Zinder-Fort Lamy-Bangui-Coquilhatville, franked Belgium 4F and Congo 4F stamps, uncommon BLACK framed bilingual French/Flemish F/F cachet. 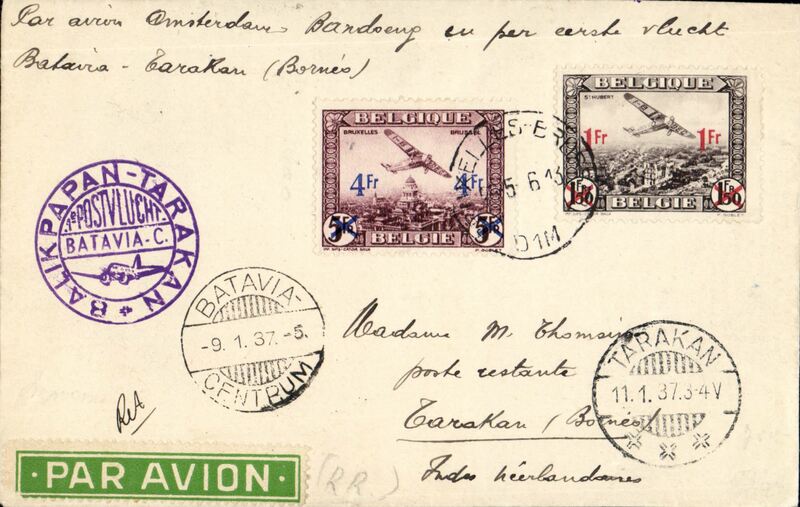 F/F SABENA Brussels-Reggan stage, and return, Arorar Oran 24/2 cds on front, and Arorar Oran 4/3 and Colom-Bechar 6/3 cds verso, souvenir cover carried on the first regular F/F SABENA flight by the aircraft "Edmond Thieffrey" from Brussels to Leopoldville via Marseilles-Oran-Colomb Bechar-Reggan-Gao-Niamey-Zinder-Fort Lamy-Bangui-Coquilhatville, franked Belgium 4F25 stamps, red framed bilingual French/Flemish F/F cachet. F/F SABENA Brussels-Zinder stage, bs 26/2, Van Reet cover carried on the first regular F/F SABENA flight by the aircraft "Edmond Thieffrey" from Brussels to Leopoldville via Marseilles-Oran-Colomb Bechar-Reggan-Gao-Niamey-Zinder-Fort Lamy-Bangui-Coquilhatville, franked Belgium 4F25 stamps, red framed bilingual French/Flemish F/F cachet. F/F SABENA Brussels-Coquilhatville stage, bs 28/2, plain cover addressed to Aketi 12/3 (425 mile NE Coquht'vlle), via Bumba 2/3, carried on the first regular F/F SABENA flight by the aircraft "Edmond Thieffrey" from Brussels to Leopoldville via Marseilles-Oran-Colomb Bechar-Reggan-Gao-Niamey-Zinder-Fort Lamy-Bangui-Coquilhatville, franked Belgium 4F25 stamps, red framed bilingual French/Flemish F/F cachet, then Coquilhatville-Bumba by regular internal F/F SABENA servce, then by surface to destination. Superb routing. F/F Air Afrique, Brussels to Matadi, bs 8/3 via Leopoldville 7/3, Van Reet cover carried on the first regular F/F Air Afrique fortnightly service from Algeria to Brazzaville (across the river from Leopoldville) via Marseilles-Alger-El Golea-Gao-Fort Lamy-Bangui-Coquilhatville, then by SABENA internal service to Matadi, franked Belgium 3F65. 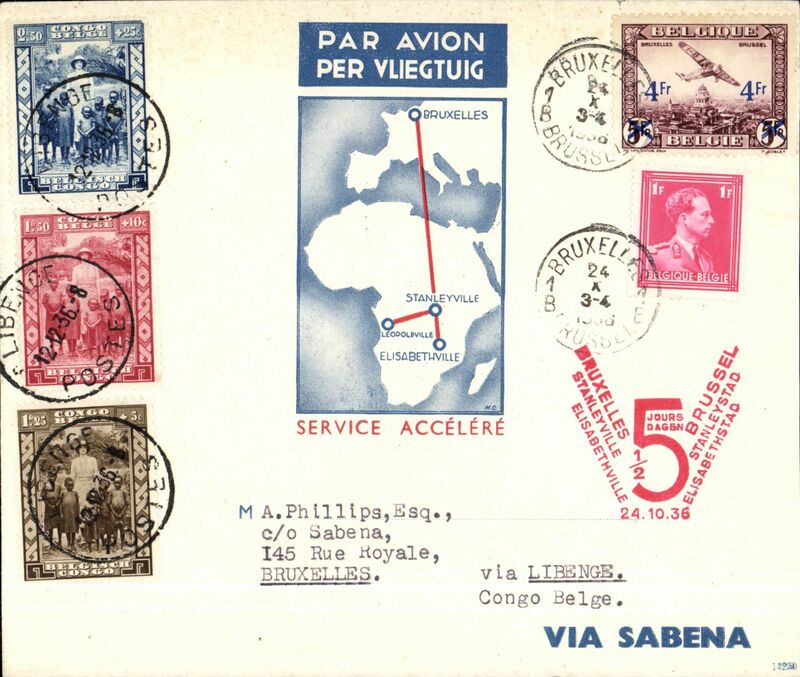 F/F Air Afrique, Brussels to Stanleyville, bs 13/3 via Coquilhatville 7/3, Van Reet cover carried on the first regular F/F Air Afrique fortnightly service from Algeria to Brazzaville (across the river from Leopoldville) via Marseilles-Alger-El Golea-Gao-Fort Lamy-Bangui, then by SABENA internal service to Stanleyville, franked Belgium 3F65. F/F Air Afrique, Brussels to Lusambo, bs, via Leopoldville 7/3, Van Reet cover carried on the first regular F/F Air Afrique fortnightly service from Algeria to Brazzaville (across the river from Leopoldville) via Marseilles-Alger-El Golea-Gao-Fort Lamy-Bangui-Coquilhatville, then by SABENA internal service to Lusambo, franked Belgium 3F65. 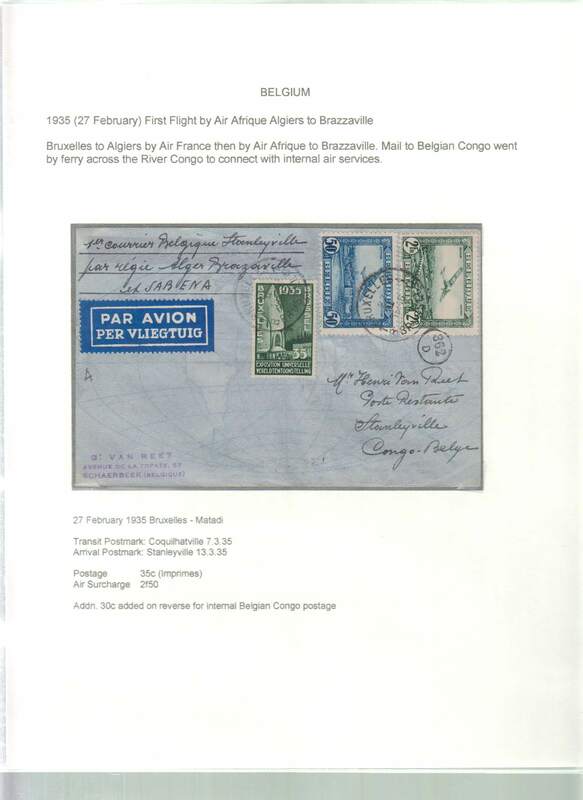 F/F Air Afrique, Brussels to Stanleyville, bs 13/3 via Coquilhatville 7/3, Van Reet cover carried on the first regular F/F Air Afrique fortnightly service from Algeria to Brazzaville (across the river from Leopoldville) via Marseilles-Alger-El Golea-Gao-Fort Lamy-Bangui, then by SABENA internal service to Stanleyville, correctly franked Belgium 35c postage and 2F50 airmail fee. Exhibition quality cover written up on display page. F/F Air Afrique, Brussels to Lusambo, bs, via Leopoldville 7/3, Van Reet cover carried on the first regular F/F Air Afrique fortnightly service from Algeria to Brazzaville (across the river from Leopoldville) via Marseilles-Alger-El Golea-Gao-Fort Lamy-Bangui-Coquilhatville, then by SABENA internal service to Lusambo, franked Belgium2F85. Exhibition quality cover written up on display page. F/F Air Afrique, Brussels to Matadi, bs 8/3 via Leopoldville 7/3, Van Reet cover carried on the first regular F/F Air Afrique fortnightly service from Algeria to Brazzaville (across the river from Leopoldville) via Marseilles-Alger-El Golea-Gao-Fort Lamy-Bangui-Coquilhatville, then by SABENA internal service to Matadi, franked Belgium 2F85. Exhibition quality cover written up on display page. 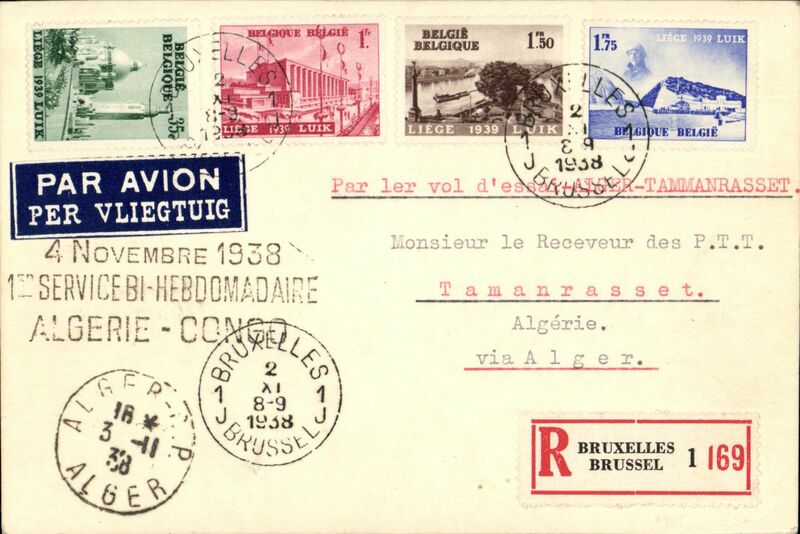 F/F Brussels to Reggan (Oran) leg of the inaugural Air Afrique, Marseilles to Brazzaville service, Van Reet cover correctly franked Belgium 35c postage and 2F50 airmail fee, verso Paris 23/2, Aoulef 6/3 and Oran 12/3 transit cds's. Great routing. 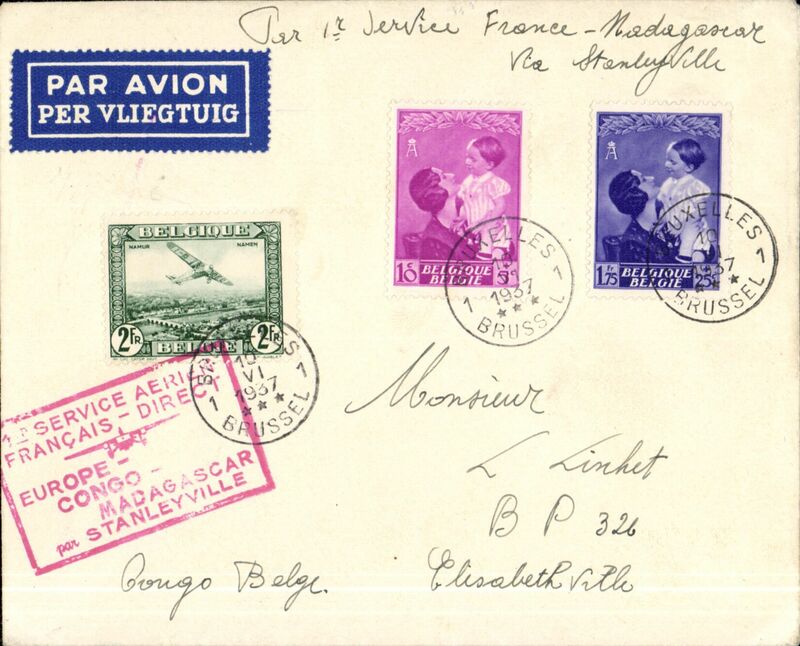 F/F Brussels to Zinder (NIger) leg of the inaugural Air Afrique, Marseilles to Brazzaville service, Van Reet cover correctly franked Belgium 35c postage and 2F50 airmail fee, verso Paris 23/2 transit cds, and Niger 4/3 arrival cds. 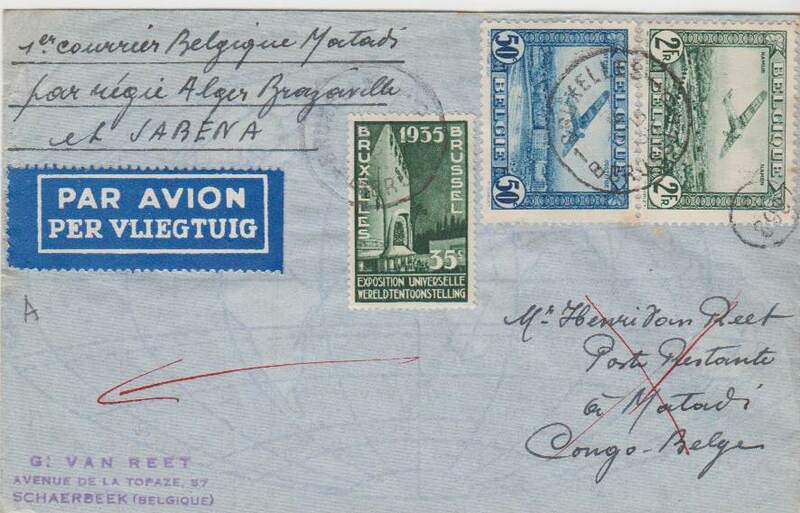 Uncommon Belgian acceptance fro Brazil, cover postmarked Brussels March 29, 1935 with transit b/s Paris March 30 and arrival b/s Porto Alegre (Brazil) April 7th. 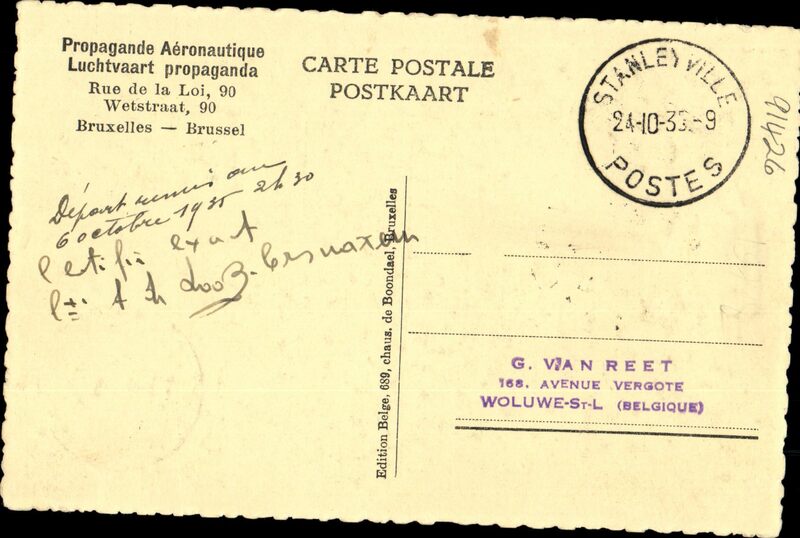 Blue bilingual Belgian airmail label. Nice clean cover. 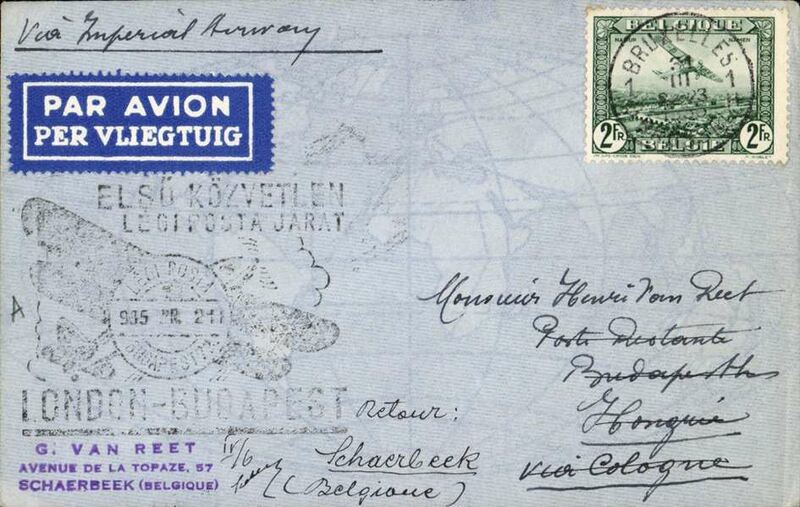 Imperial Airways first Central European airmail route, Belgium acceptance for F/F London to Budapest, plain etiquette cover franked 2F, canc Brussels 31/3/1935, large black F/F cachet applied by Hungarian PO on arrival in Budapest Apr 2nd. 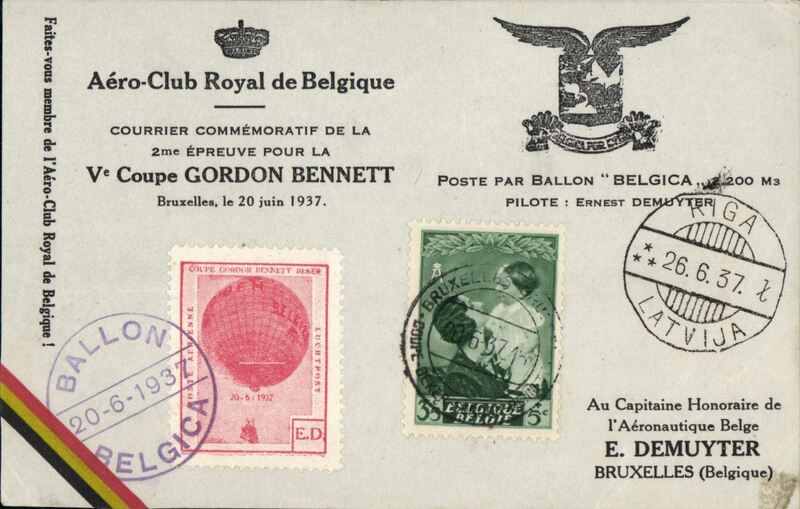 Balloon flight, Brussels-Rozlucz, Poland, bs 24/7, red cachet, souvenir card, signed by the pilot. 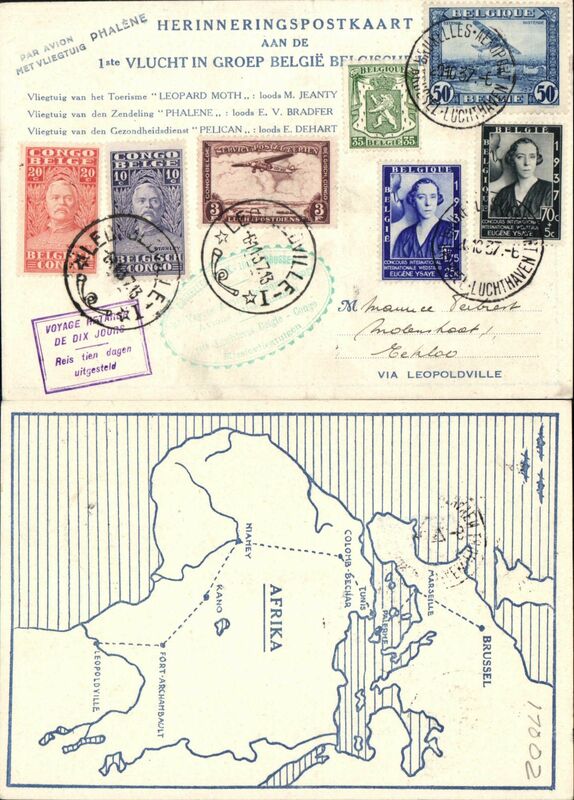 Count De Looz-Corswarem, Mahieu and D'Hoore official flight to the Congo via the shortest route over the Libyan desert, Brussels to Leopoldville, bs 17/10, Premier Aerienne/Bruxelles-Tunis-Sebha-Fort Lamy-Stanleyville" souvenir cover franked 1F50, canc Bruxelles 30/9, red seven line "Raid Belgique-Congo/Via La Lybie/Octobre 1935/Depart de Bruxelles/prevu par le 1-10-1935, retarde Jusqu'a 6/Arrive a Coquilhatville le 9/En Mission a Leopoldville le 17". Rare item, only 40 carried over all stages of this flight. Ex Clowes. Count De Looz-Corswarem, Mahieu and D'Hoore official flight to the Congo via the shortest route over the Libyan desert via Tunis-Sebha-Fort Lamy, Brussels to Fort Lamy 8/10 arrival ds on front, carried by air to Chad then returned by surface mail to Belgium, Van Reet pictorial card franked Belgium 1F1c and Belgium 1c to obtain ultimate arrival mark (1/12) and Chad 90c, signed by Count De Looz-Corswarem under a handwritten comment on the deferred departure from Brussels. Rare item, only six items were flown to Chad. Ex Clowes. 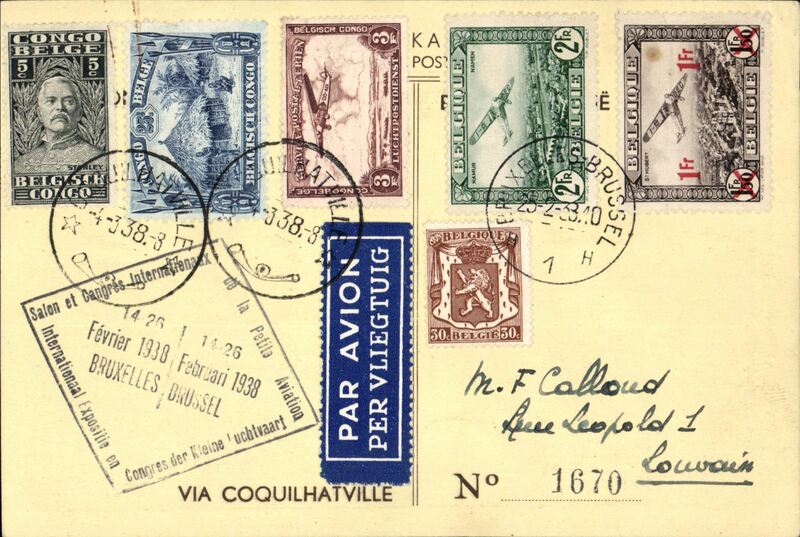 Count De Looz-Corswarem, Mahieu and D'Hoore official flight to the Congo via the shortest route over the Libyan desert via Tunis-Sebha-Fort Lamy, Brussels to Leopoldville 17/10, carried by air to Leopoldville, then returned by surface mail to Belgium, Van Reet pictorial card franked Belgium 1F and Belgium 1c to obtain ultimate arrival mark (1/12) and Congo 75c canc Lepoldville 17/10, black "Raid Mahieu" cachets front and verso, signed by Count De Looz-Corswarem under a handwritten comment on the deferred departure from Brussels. Rare, only ten such items were carried. Ex Clowes. Count De Looz-Corswarem, Mahieu and D'Hoore official flight to the Congo via the shortest route over the Libyan desert via Tunis-Sebha-Fort Lamy, Brussels to Leopoldville and return, by air in both directions, Van Reet pictorial card franked Belgium 1F canc Brussels 1/10 and Belgium 70c to obtain ultimate arrival mark (last dat Brussels Expo cancellation) and 1.50 Congo stamp canc Leopoldville 22/10, also Stanleyville 24/10 postmark verso, black "Raid Mahieu" cachets x2, signed by Count De Looz-Corswarem under a handwritten comment on the deferred departure from Brussels. Rare, only ten such items were carried. 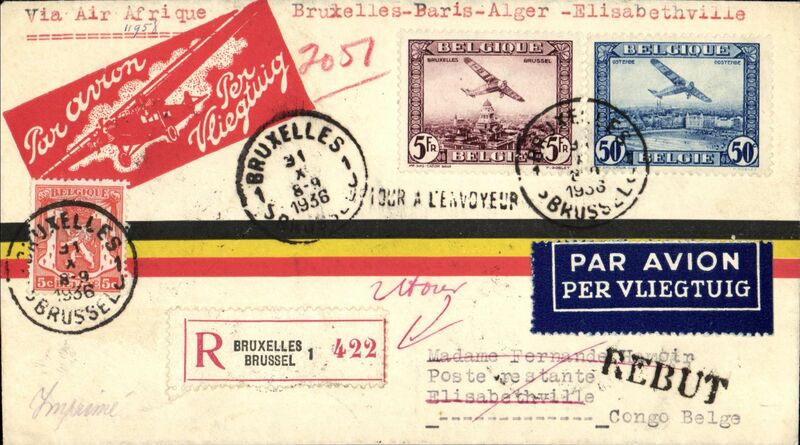 Air France/Air Afrique, Brussels to Elisabethville, bs 14/11, via Paris 7/11, scarce Belgium acceptance for F/F Air France/Air Afrique Paris-Leopoldville extension to Elisabethville, Van Reet airmail etiquette cover franked 3F80, canc Bruxelles 7/11 cds, red boxed "!ier Service Aerien/Francais Regulier/Europe-Congo-Madagascar" flight cachet. 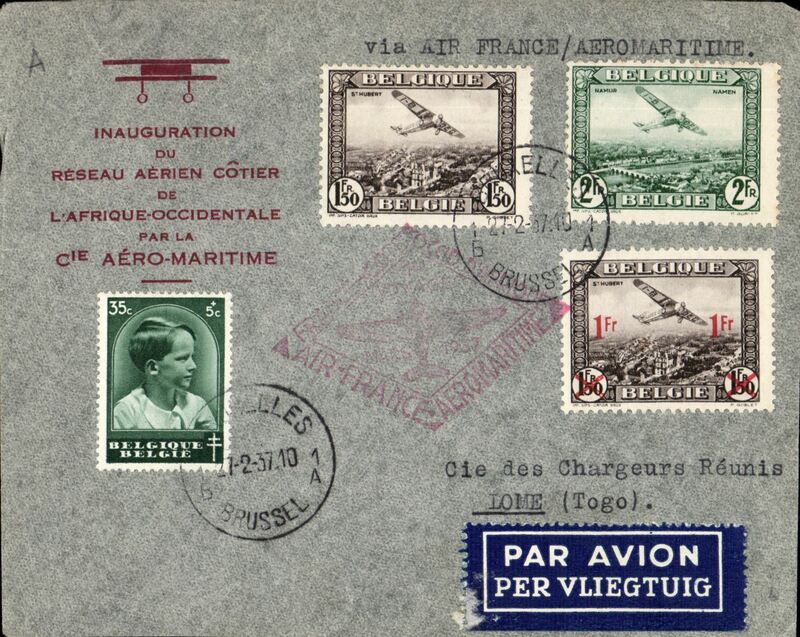 One of only c50 covers to catch the first flight. Due to an error in the official announcement most Belgian acceptances went by the second (ie the first Sabena) flight which left Brussels on 15/11/35. Ex Clowes. 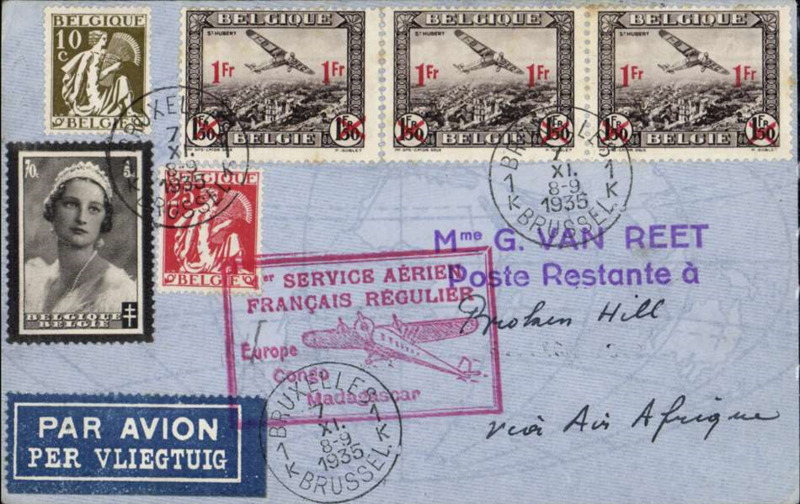 Brussels to Broken Hill, bs 16/11, scarce Belgium acceptance for F/F Air France/Air Afrique/Regie Malgache Paris-Leopoldville extension to Elisabethville and Madagascar, Van Reet airmail etiquette cover franked 4F05, canc Bruxelles 7/11 cds, red boxed "!ier Service Aerien/Francais Regulier/Europe-Congo-Madagascar" flight cachet. 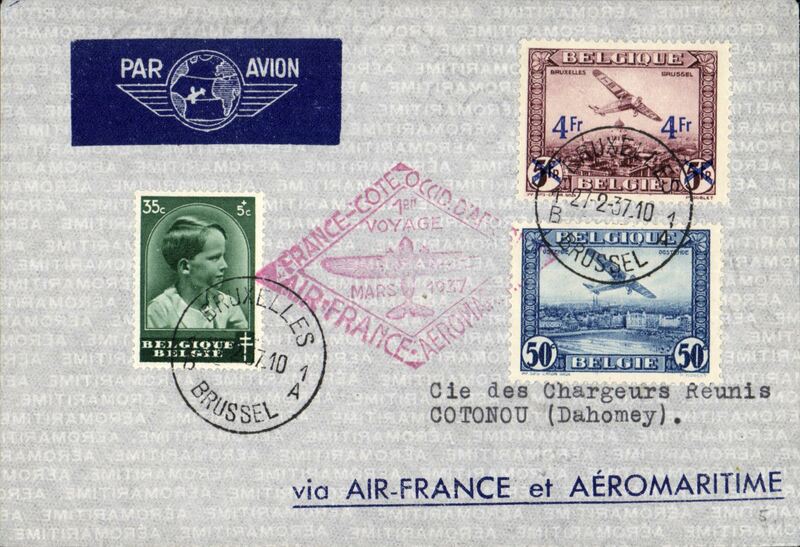 One of only c50 covers to catch the first flight. Due to an error in the official announcement most Belgian acceptances went by the second (ie the first Sabena) flight which left Brussels on 15/11/35. Repaired closed tear verso, hardly visible, see scan, Francis Field authentcation hs verso. Hungary acceptance for the Sabena F/F extension of the regular service Brussels to Elisabethville, bs 23/11, registered (label) souvenir cover franked 247f canc Budapest LegipostaNov 15 cds. An uncommon accetance in fine condition. 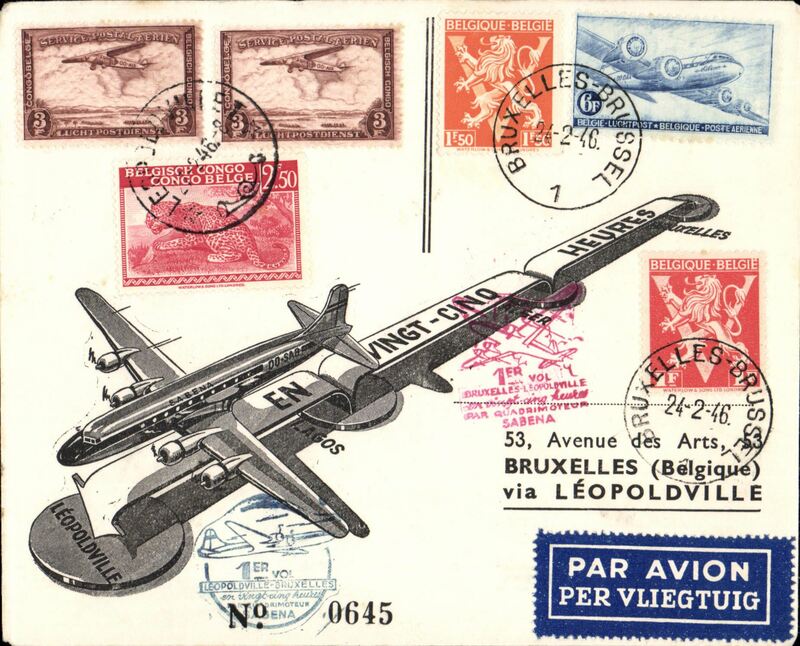 Brussels acceptance for the 1st Sabena Brussels-Elisabethville service, airmail etiquette card franked 3F 80, canc Bruxelles 7/11and 15/11 cds, green bilingual flight cachet verso.Intended for the 7/11 first Air France/Air Afrque flight to E'ville. 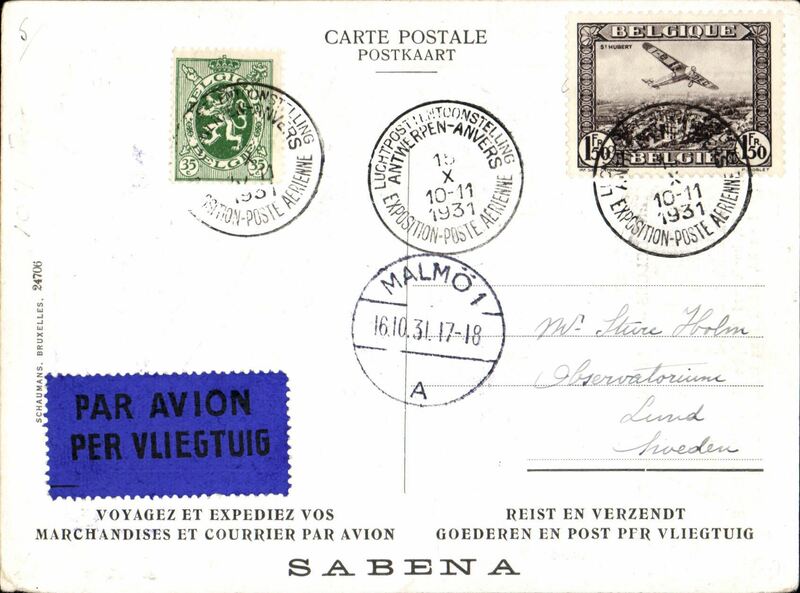 But, due to an error in the official announcement most Belgian mail went by the first Sabena flight instead, which left Brussels on 15/11/35. Hence the 7/11 and 15/11 departure postmarks on this card. 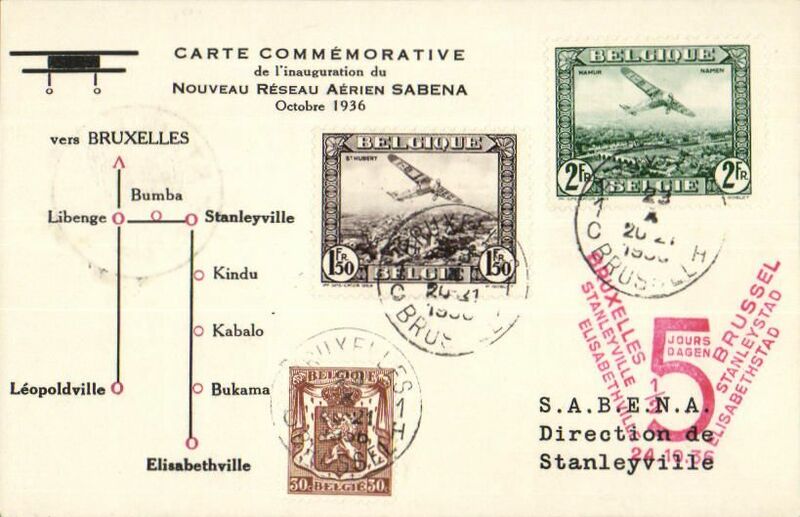 Sabena, first direct flight from Brussels to Elisabethville, bs 21/11, then OAT by Regie Malgache toTananarive, Madagascar, bs 24/11, souvenir cover franked 9F 25, canc Bruxelles 15/11 cds, green framed bilingual flight cachet on front. Sabena F/F extension of the regular service to Elisabethville, round trip all the way by air, Brussels to Elisabethville, bs 21/11, and return to Brussels 29/11, Sabena Brussels-Elisabethville F/F souvenir cover franked Belgium 5F, canc Brussels 15/11 cds, and Congp 5F canc Elisabethville 21/11, green framed Brussels-Elisabethville F/F and purple framed Elisabethville Bruxells/Sabena 23-11-1935 flight cachets, signed by the pilot Captain Prosper Cocquyt. Nice item. 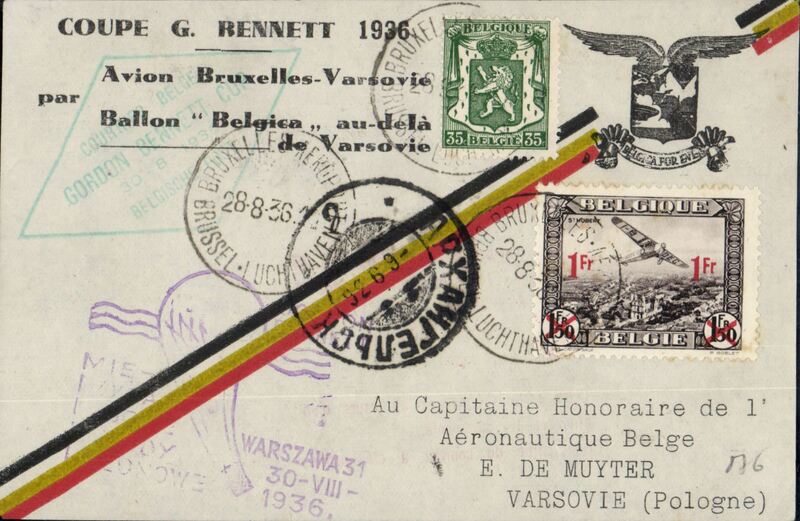 Sabena, Brussels to Kamina (750 miles SW Leopoldville), bs 21/11, carried on F/F Brussels-Leopoldville extension to Elizabethville, blue/grey Sabena souvenir cover with map of route, franked 3F50 airs + 2F10 ordinary, canc Brussels 15/11 cds, special green framed flight cachets front and verso, addressee unknown, Elizabethville Poste restante 22/11. Sabena, Brussels to Elizabethville, bs 21/11 and return to Brussels, bs 29/11, carried on F/F Brussels-Leopoldville extension to Elizabethville service, blue/grey Sabena souvenir cover with map of route, franked 5F Belgium stamps, canc Bruxelles 15/11 cds, and 5F Congo stamp, canc Elizabethville 22/11 cds, green framed outward and purple framed inward flight cachets. Sabena, Brussels to Port Franqui, bs 20/11 and return to Brussels, bs 29/11, carried on F/F Brussels-Leopoldville extension to Elisabethville service, blue/grey Sabena souvenir cover with map of route, franked 5F Belgium stamps, canc Bruxelles 15/11 cds, and 4.5Fair + 50c ordinary Congo stamps, canc Port Franqui 21/11 cds, special green framed flight cachet. A scarcer round flight. 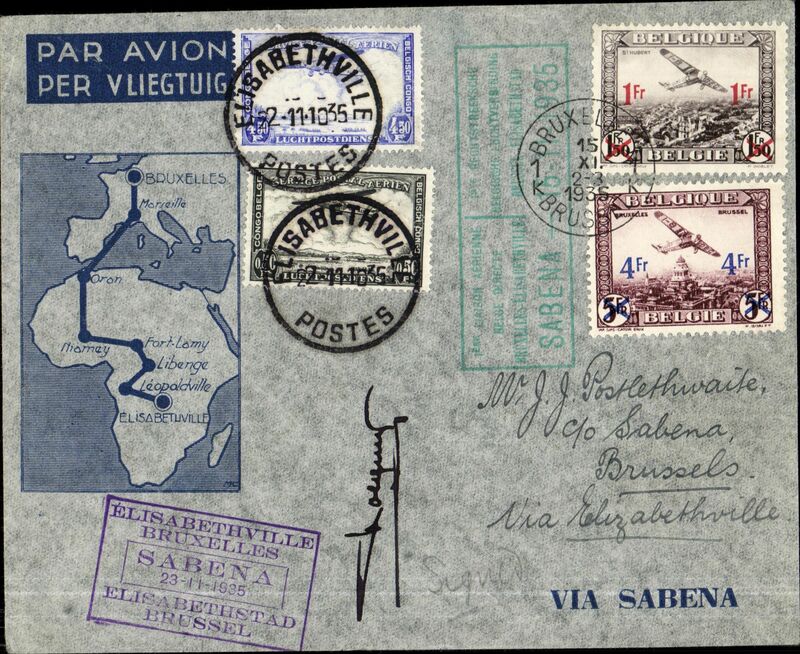 Sabena, Brussels to Banningville (Bandundu), bs 20/11 and return to Brussels, bs 29/11, carried on F/F Brussels-Leopoldville extension to Elizabethville service, blue/grey Sabena souvenir cover with map of route, franked 5F Belgium stamps, canc Bruxelles 15/11 cds, and 4.5Fair + 50c ordinary Congo stamps, canc Banningville 20/11 cds, special green framed flight cachet. A scarcer round flight. 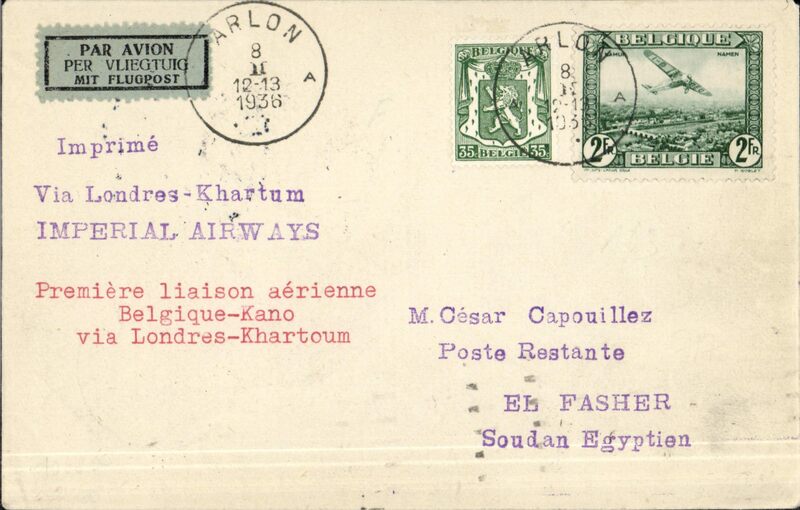 First Belgium acceptance for the Sudan via the Imperial Airways inaugural London- Khartoum-Kano service, Brussels to El Fasher (Sudan), bs 15/2, via Paris 9/2 and Khartoum 14/2, Caesar Capouillez cover franked 2F 35, canc Arlon 8/2, violet two line "Via Londres-Khartoum/Imperial Airways" flight cachet. Very little notice was given for this fight, so these covers are very scarce, see Jennekins & Godinas, 1969, p63. A superb item in pristine condition. 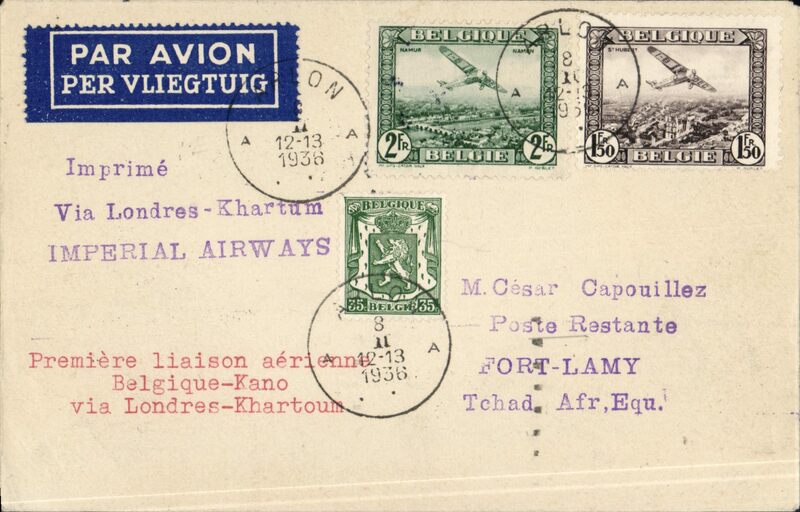 Belgium acceptance for the Imperial Airways inaugural London- Khartoum-Kano service, Brussels to Fort Lamy (Tchad), bs 16/2, via Paris 9/2 and Khartoum 14/2, Caesar Capouillez cover franked 3F75, canc Arlon 8/2, violet two line "Via Londres-Khartoum/Imperial Airways" flight cachet. Very little notice was given for this fight, so these covers are very scarce, see Jennekins & Godinas, 1969, p63. A superb item in pristine condition. 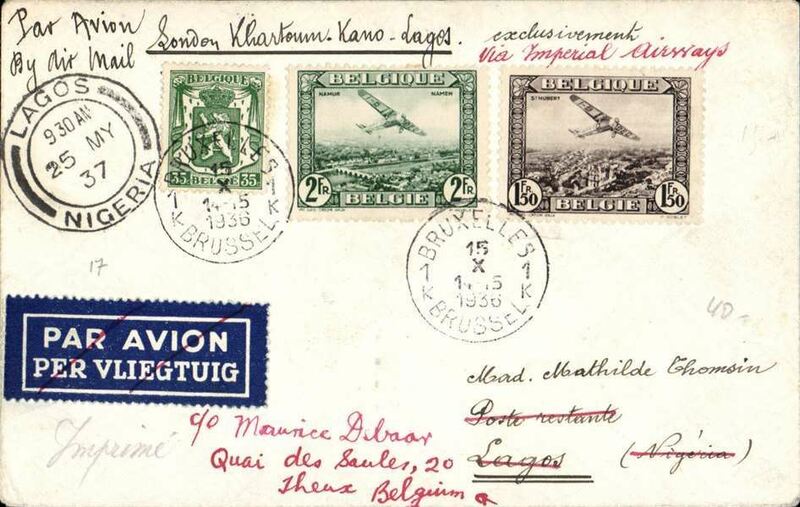 Belgium acceptance for the Imperial Airways inaugural London- Khartoum-Kano service, Brussels to Maidugari (Nigeria), bs 16/2, via Paris 9/2 and Khartoum 14/2, van Reet (hold this envelpe up to the light) airmail cover franked 3F65, canc Bruxelles 8/2, typed 'By Imperial Airways'. Very little notice was given for this fight, so these covers are very scarce, see Jennekins & Godinas, 1969, p63. A superb item in pristine condition. 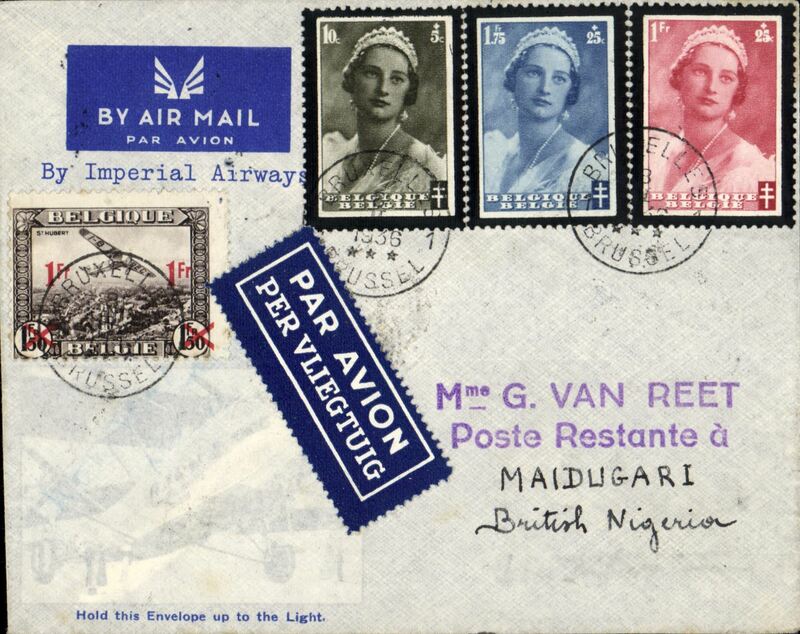 First Belgium acceptance for first Imperial Airways London-Nigeria service Brussels to Maidugari, bs 16/2 a, via Paris 9/2 and Khartoum 14/2, correctly franked 3.85 F, canc Brussels cds, Van Reet pale grey imprint etiquette official envelope with transparent lower left section depicting aircraft, typed 'By Imperial Airways'. 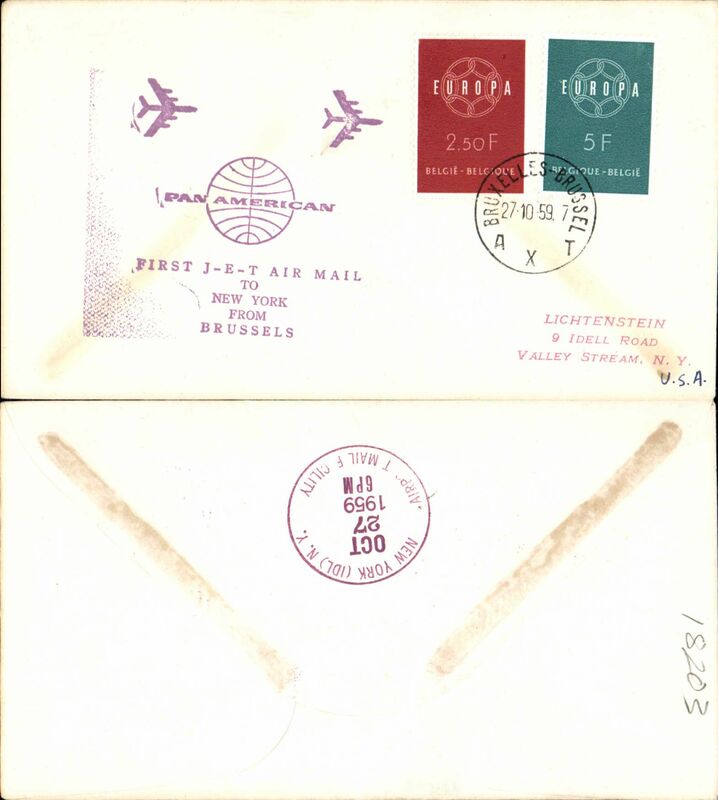 See West African Airmails, ed B. Priddy, p17..
Air Afrique, Brussels to Leopoldville, bs 12/3, bank corner cover, red meter postmark 1F50 postage (reduced to Congo) and 3F50 air mail surcharge, large red "Via Air Afrique" hs, blue/white airmail etiquette. Exhibition quality cover written up on display page. 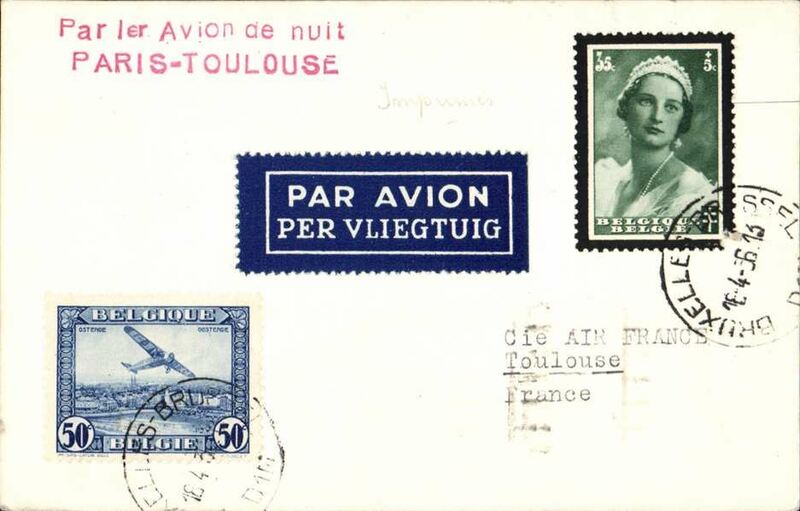 Acceleration of the Paris to South America service, first acceptance of Belgian mail for carriage on the inaugural first night service from Paris to Toulouse, bs 19/4, card franked 35c canc Brussels cds, red two line 'Paris 1er Avion de nuit/Paris-Toulouse'. 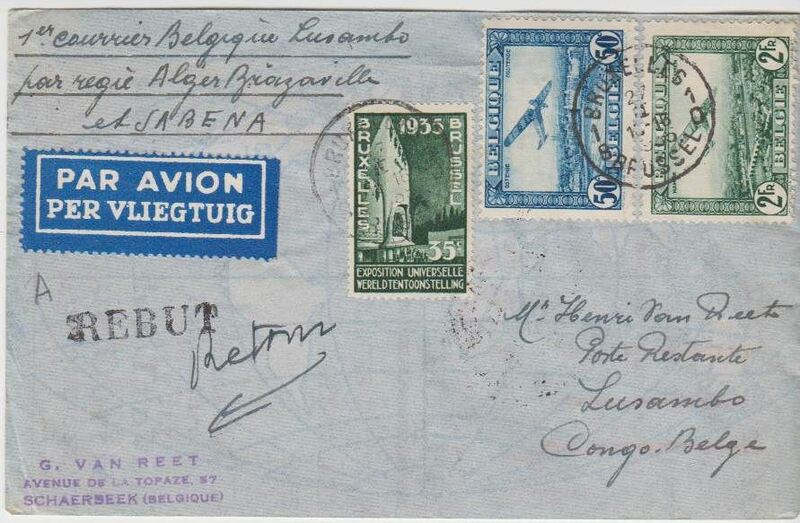 LAPE, Spanish Postal Airlines (Lםneas Aיreas Postales Espaסolas), the Spanish national airline during the Second Spanish Republic, interrupted F/F Brussels-Madrid-Lisbon, via Paris Avion 21/4, plain cover franked 1F 35c, green/white airmail etiquette.. 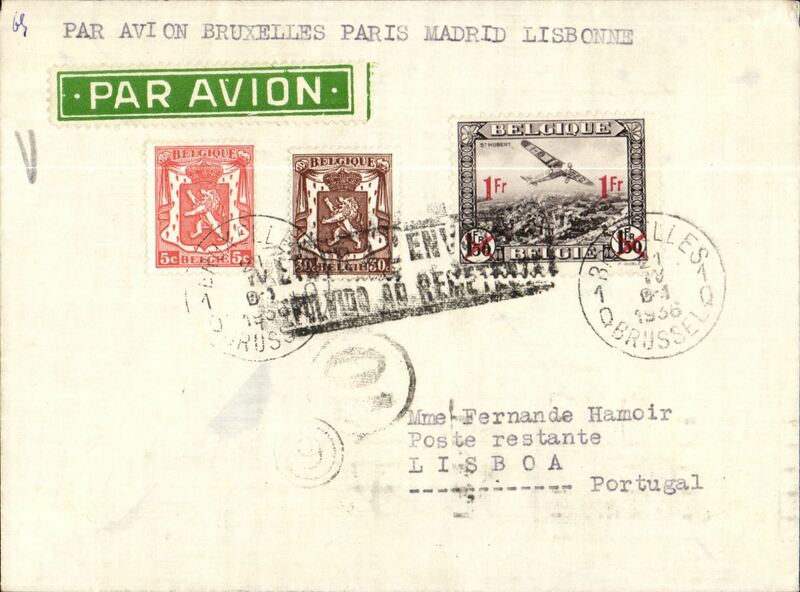 The plane was damaged in an accident between Madrid and Lisbon, and some of the mail does not have a Lisbon arrival ds. See Godinas, 1969, p64. 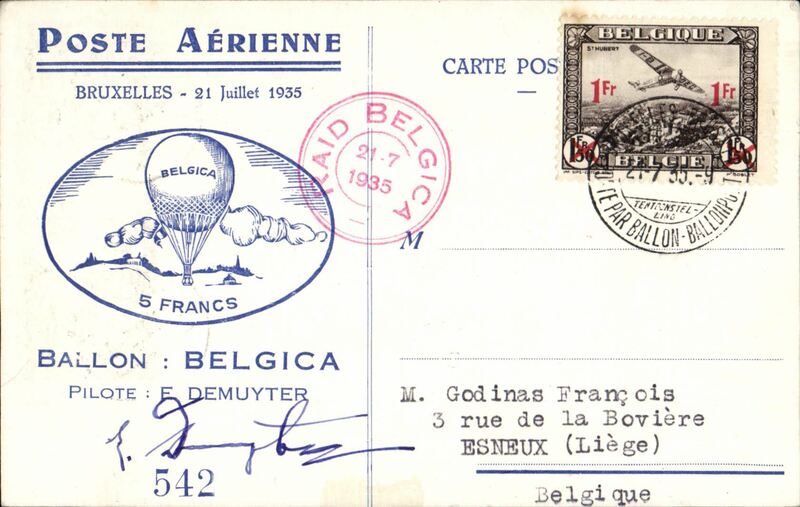 (Polar) Belgium-Poland-Russia:Balloon flight card,19361936 Gordon Bennett Cup, carried by renown Belgian balloonist E.de Muyter: flown by plane to Warsaw, Poland; then on de Muyter's balloon "Belgica" that flew 1715km in 46 hours, and landed way north, near Arkhangelsk. Imprint on reverse states, in part, that "une partie du courrier a ete perdu" - part of carried mail was destroyed or lost (probably thrown out to prolong the flight). 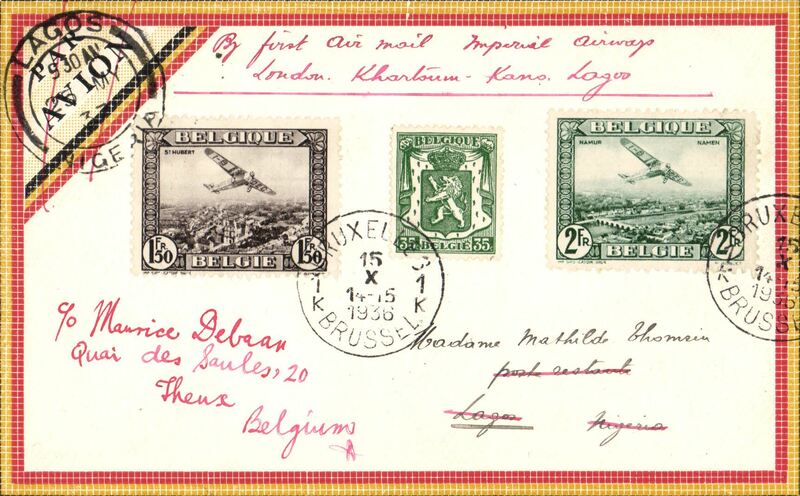 First Belgium acceptance for the Imperial Airways Kano-Lagos extension of the London-Nigeria service, Brussels to Lagos, bs 26/10, via Paris, 19/10, plain cover, franked 3F 85c, ms "Par Avion London-Khartoum-Kano-Lagos/ exclusvement Via Imperial Airways", dark blue/white etiquette, ref Godinas 1951, and Jennekens and Godinas 1969. 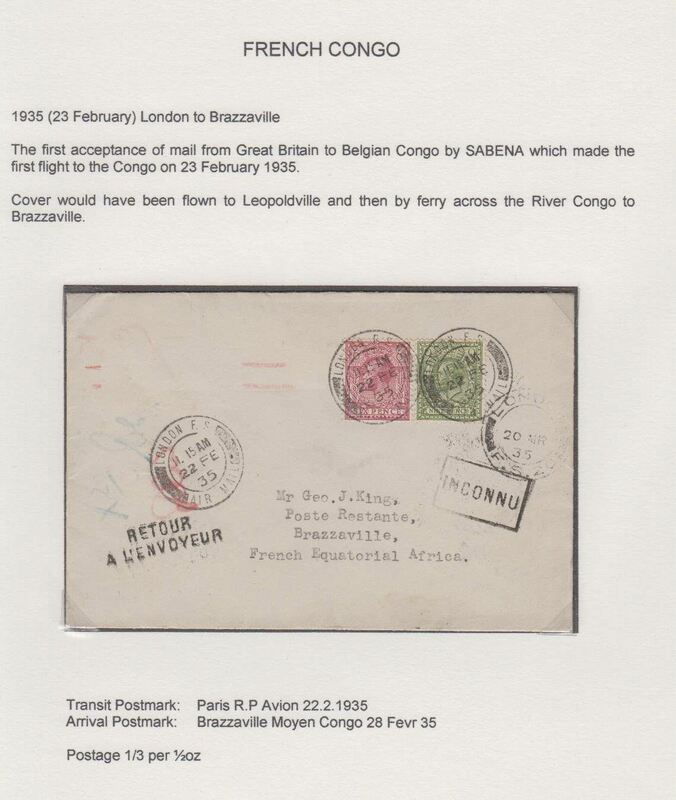 Brussels to Elisabethville, bs 29/10 and return to Brussels, 5/11, Belgian and Belgian Congo stamps, all bs's and cachets, cachet, illustrated souvenir cover, Sabena. Image. 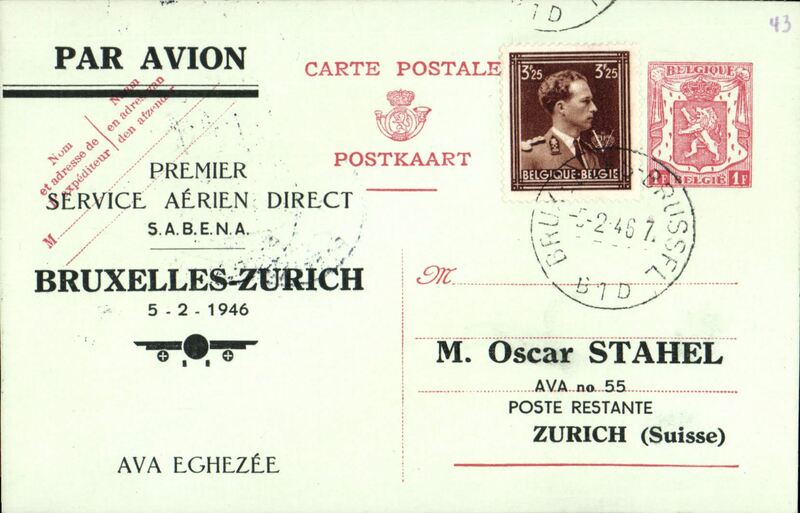 First five day flight, Brussels to Stanleyville, bs 28/10, souvenir card with printed stages of route franked 3F50, Sabena. 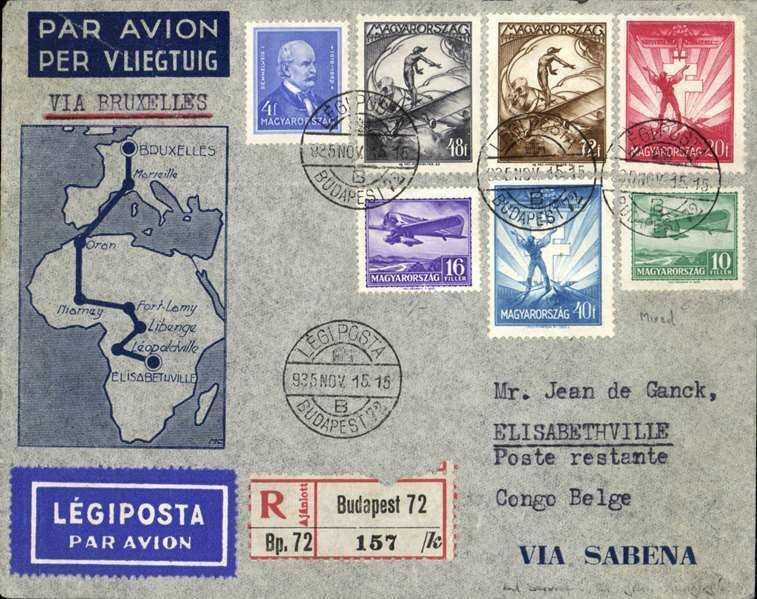 Brussels to Libenge, bs 29/10 and return 12/12 to Brussels, Belgian and Belgian Congo stamps, all bs's, cachet, illustrated souvenir cover, Sabena. 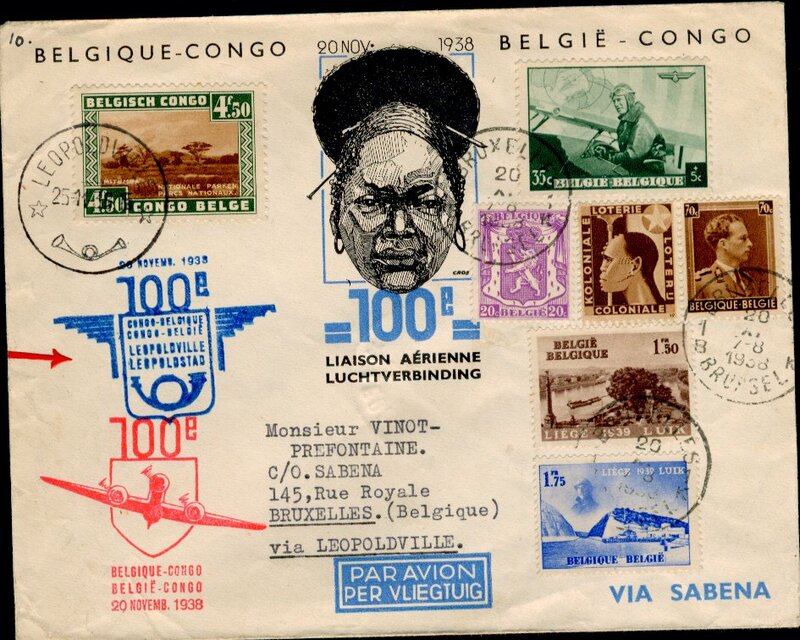 Brussels to Kindu, bs 29/10 and return 5/11 to Brussels, Belgian and Belgian Congo stamps, all bs's, cachet, illustrated souvenir cover, Sabena. 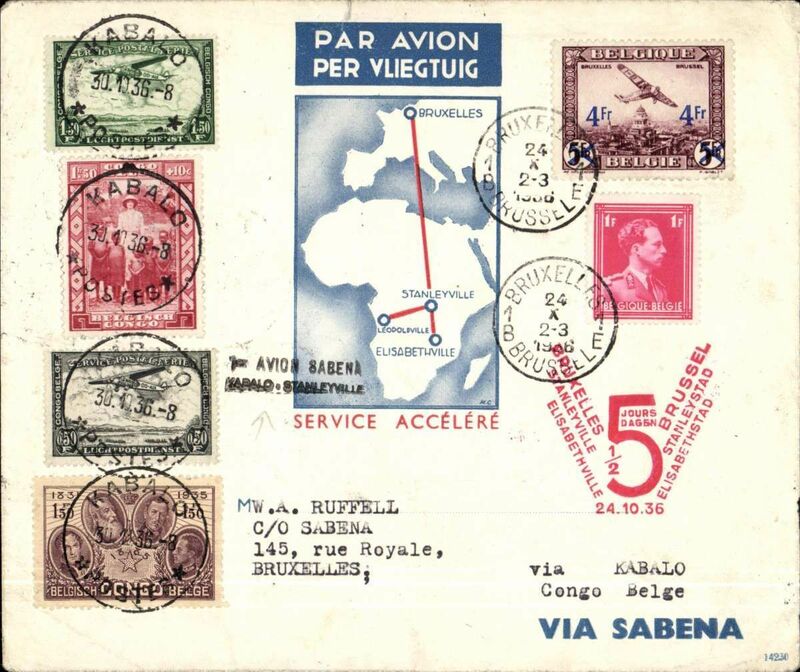 Brussels to Kabalo, bs 29/10 and return 30/10 to Brussels 5/11, Belgian and Belgian Congo stamps, all bs's, cachet, illustrated souvenir cover, Sabena. 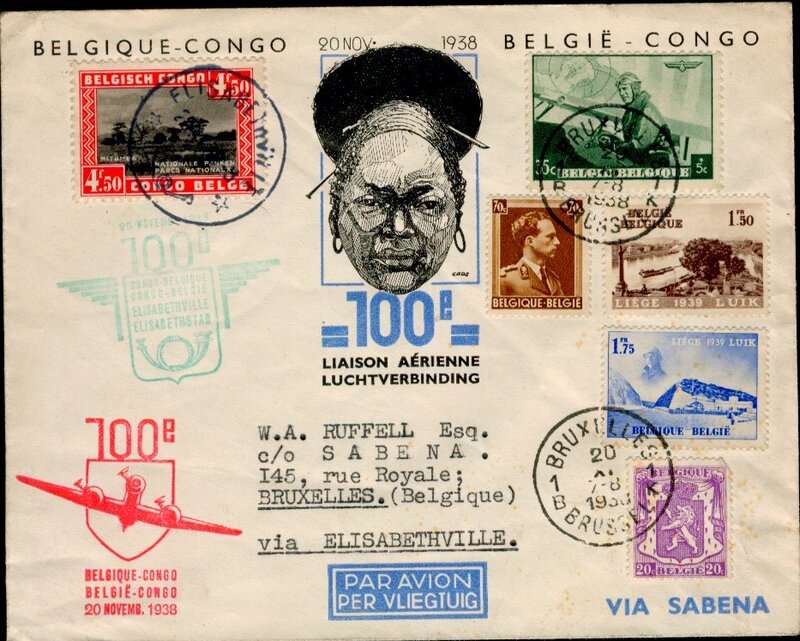 Brussels to Bukama, bs 29/10 and return 30/10 to Brussels, 5/11, Belgian and Belgian Congo stamps, all bs's, cachet, illustrated souvenir cover, Sabena. Brussels to Elisabethville, 12/11, via Marseilles 1/11, carried on the first accelerated Sabena Brussels to Elisabethville service via the NEW (via Stanleyville) schedule, registered (label) red/yellow/black stripe airmail cover franked 5F50, type "Via Air Afrique/Bruxelles-Paris-Alger-Elisabethville". Intended for 1sr Air Afrique flight, but this was deferred for several weeks. So carried on the second Sabena flight. A nice historical item and one for the exhibit. Brussels to Elisabethville, 12/11, via Marseilles 1/11, carried on the first accelerated Sabena Brussels to Elisabethville service via the NEW (via Stanleyville) schedule, registered (label) red/yellow/black stripe airmail cover franked 5F50, type "Via Air Afrique/Bruxelles-Paris-Alger-Elisabethville". 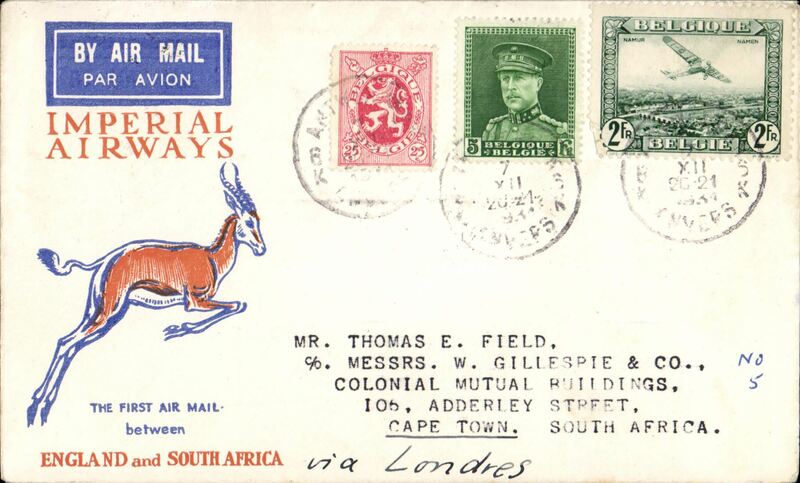 Intended for 1st Air Afrique flight, but this was deferred for several weeks. So carried on the second Sabena flight. A nice historical item and one for the exhibit. 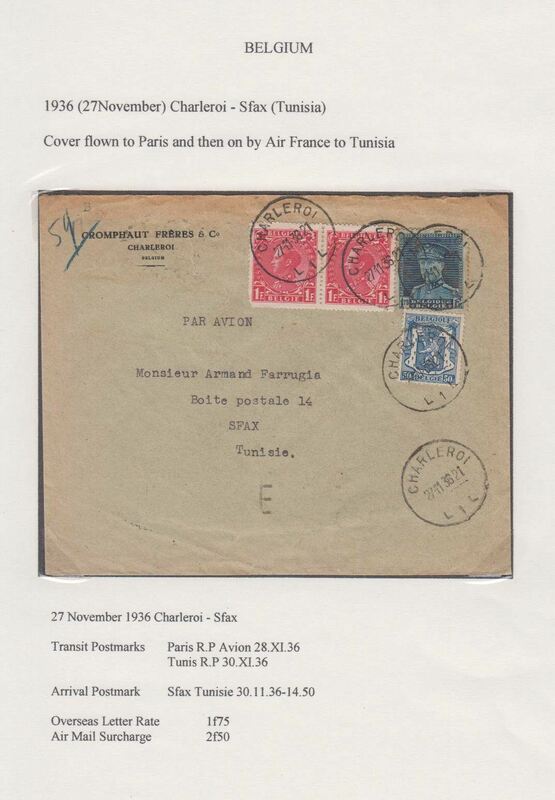 Belgium to Tunisia, bs Sfax Tunisie 30/11, via Paris RP Avion 28/11, commercial corner cover franked 1F25 overseas letter rate + 2F50 airmail surcharge. Exhibition quality cover written up on display page. 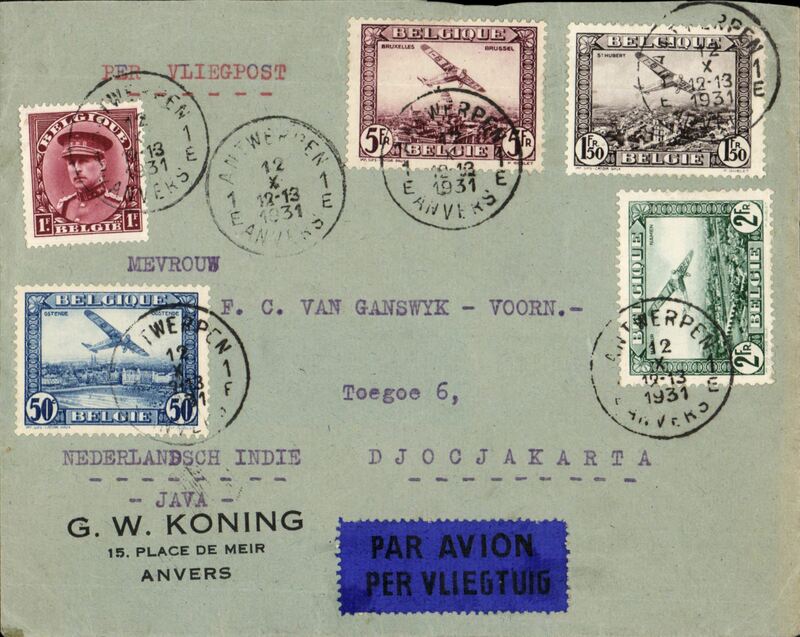 Double Belgian acceptance for two NEI first flights, F/F Batavia 9/1/37 to Takaran 9/1, and return F/F Takaran 9/1 to Batavia 11/1, plain cover franked 5F, fine purple strikes of the batavia and Takaran F/F cachets, atractive green/cream 'Par Avion' etiquette. 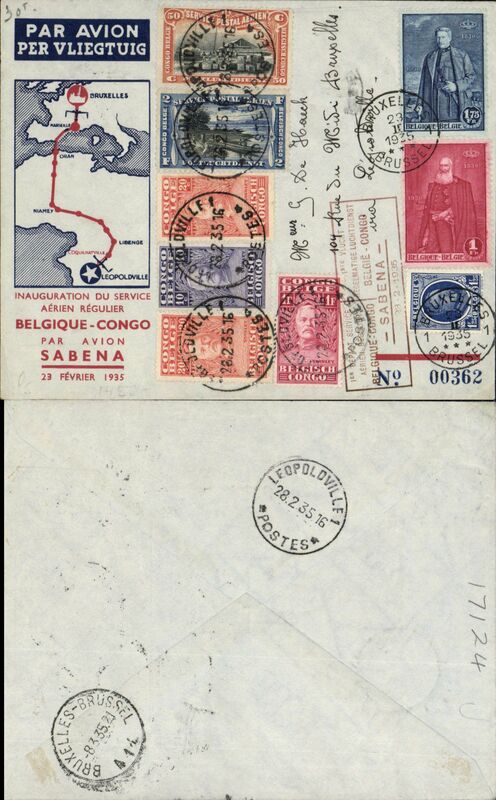 Sabena, Brussels to Leopoldville, bs 21/1, bank corner cover, red meter postmark 1F50 postage (reduced to Congo) and 3F50 air mail surcharge, large red "Via Sabena" hs, blue/white airmail etiquette. Exhibition quality cover written up on display page. 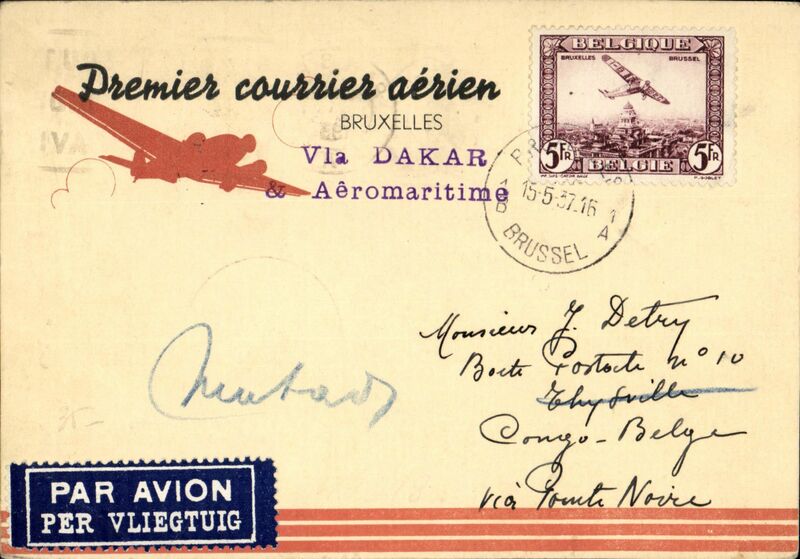 Belgium to Liberia, Brussels to Monrovia, bs 2/3, Belgium acceptance for carriage on the Air France/Aeromaritime F/F Dakar to Cotonau, Dahomey, black diamond cachet, printed souvenir cover franked 35c postage and 4F50 air surcharge. Exhibition quality cover written up on display page. Belgium acceptance for F/F Paris to Cotonau, Dahomey, no arrival ds, red diamond cachet, Air France/Aeromaritime printed cover franked 4F50. 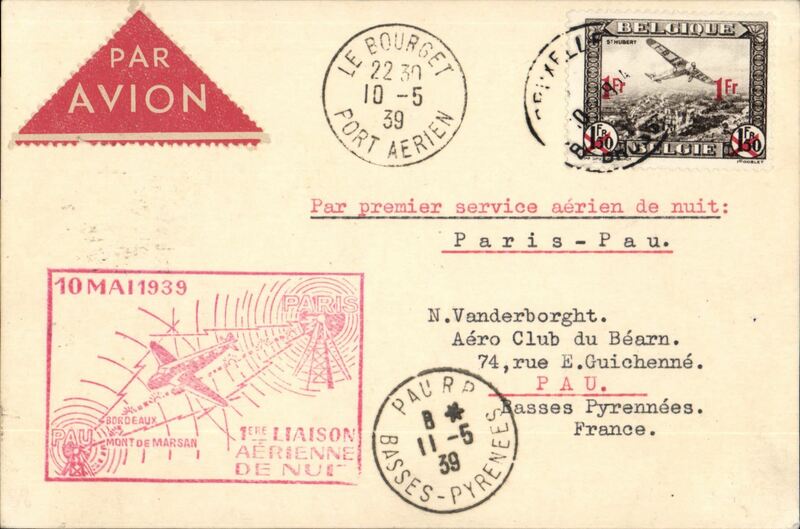 Air France/Aeromaritme, Belgium acceptance for F/F Paris to Lome, Togo, bs 3/3, via Cotonau, bs, red diamond cachet, Small faults verso, see scan. Francis Field authentication hs verso. 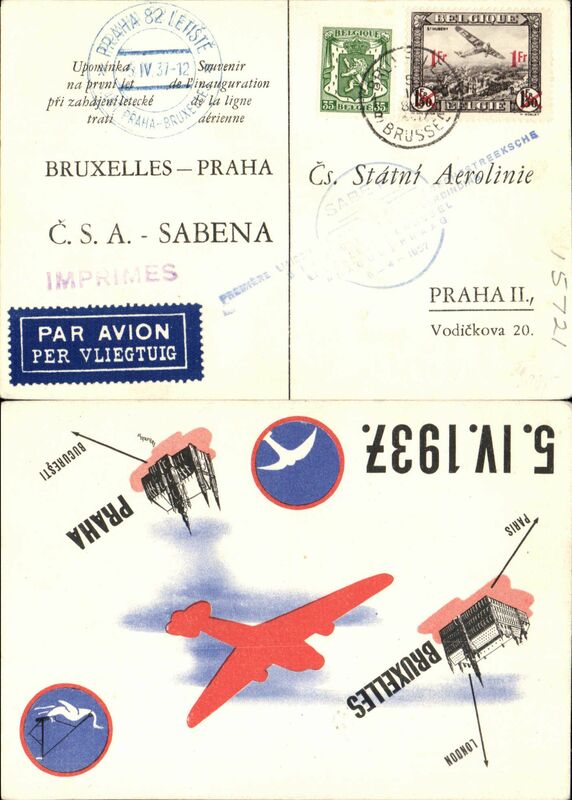 Sabena, first direct flight Brussels to Prague, arrival ds on front, flight cachet, b/s, multicoloured souvenir PPC. 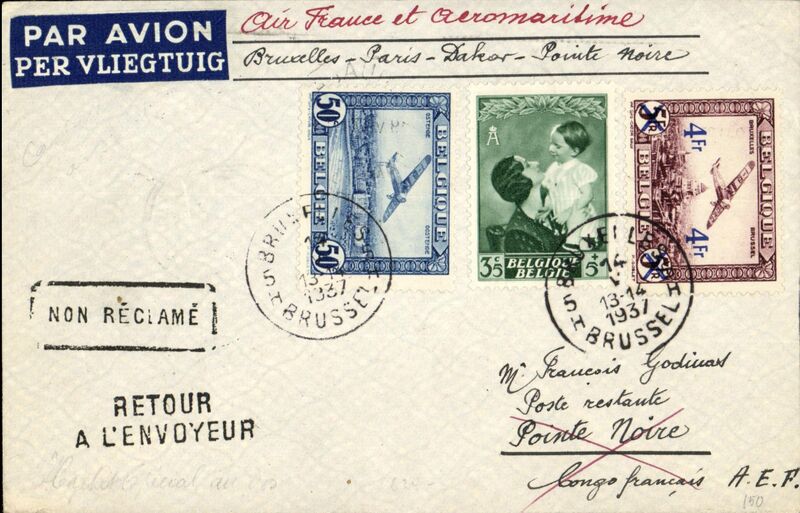 Air France/Aeromaritime extension to Douala and Pointe Noire, Thieux (Belgium) to Pointe Noire (French Congo), bs 20/5, grey/blue Air France/Aeromaritime air cover franked 5F25, black framed "Service Aerien Senegal-Congo/Aeromaritime/1er voyage Mai 1937/en laison avec/Air France Air Afrique", ms "Bruxelles-Paris-Dakar-Pointe Noire", two uncommon and attractive se tanant Congo/Belgium publicity labels verso. Nice item. 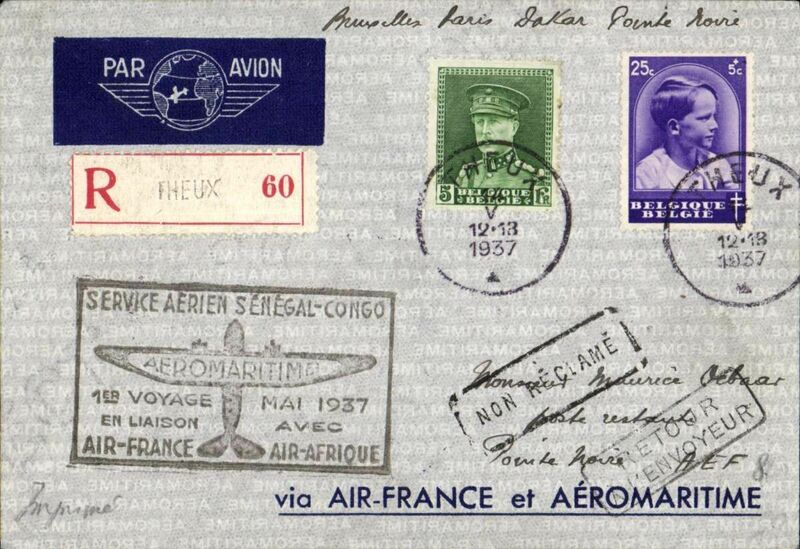 Air France/Aeromaritime extension to Douala and Pointe Noire, Thieux (Belgium) to Port Gentil (French Equatorial Africa), bs 20/5, grey/blue Air France/Aeromaritime air cover franked 5F25, black framed "Service Aerien Senegal-Congo/Aeromaritime/1er voyage Mai 1937/en laison avec/Air France Air Afrique", ms "Bruxelles-Paris-Dakar-Pointe Noire". 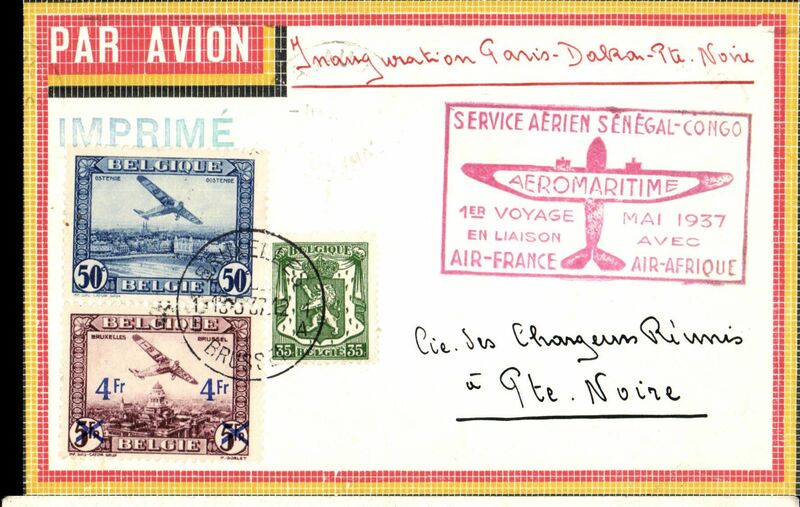 Air France/Aeromaritime extension to Douala and Pointe Noire, Brussels to Pointe Noire (French Congo), bs 6/6, via Duala 19/5, plain airmail etiquette Godinas cover franked 4F85, verso black framed "Service Aerien Senegal-Congo/Aeromaritime/1er voyage Mai 1937" without "en laison avec/Air France Air Afrique", ms "Air France et Aeromaritime/Bruxelles-Paris-Dakar-Pointe Noire". 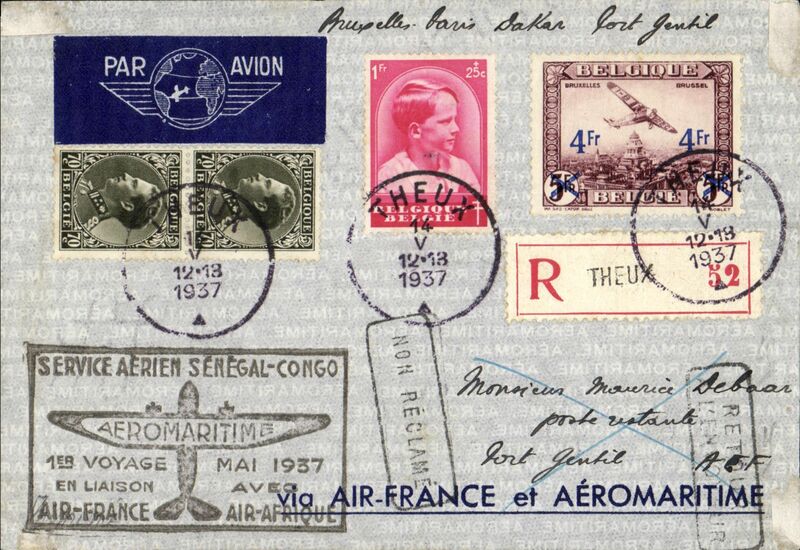 Air France/Aeromaritime extension to Douala and Pointe Noire, Brussels to Thysville (Congo) via Paris 15/5, and on to Matadi 27/5, van Reet red/yellow/black border "Premier courrier aerien" airmail card, uncommon violet two line "Via Dakar/& Aeromaritime" cachet "Inauguration Paris-Dakar-Pointe Noire". 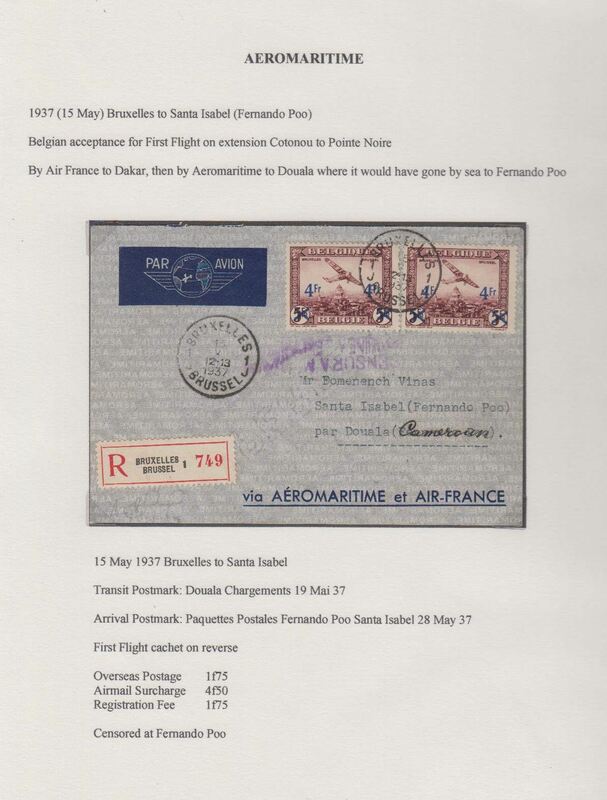 Belgium to Fernando Poo, Brussels to Santa Isabel, bs 28/5, Belgium acceptance for carriage on the first Air France/Aeromaritime extension to Pointe Noire of the Dakar-Cotonau-Dahomey service, registered (label) printed company cover franked 1F75 overseas postage, 4F50 air surcharge and 1F75 reg fee. By Air France to Dakar, Aeromaritime to Douala and sea to Fernando Poo. Exhibition quality cover written up on display page. 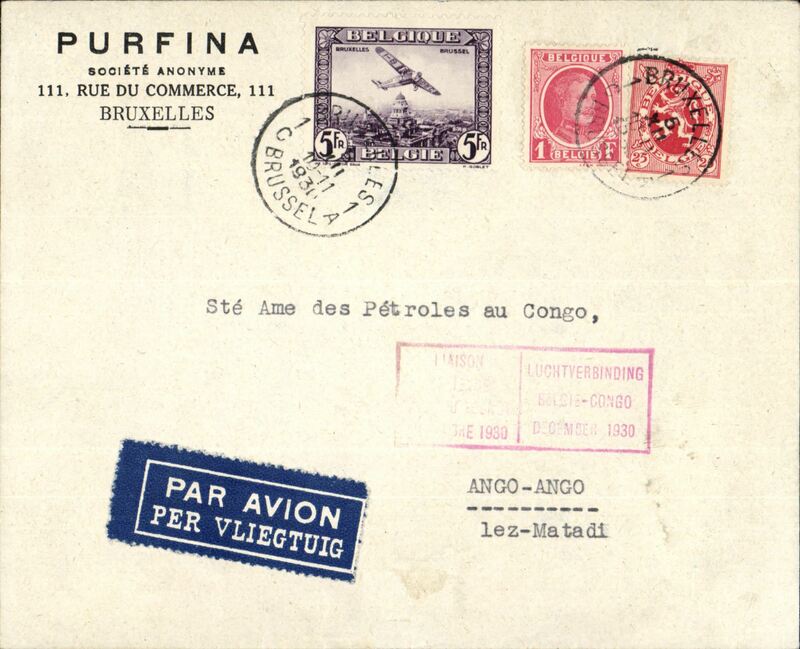 Air France/Aeromaritime extension to Douala and Pointe Noire, Brussels to Pointe Noire (French Congo), bs /6/, via Douala 19/5, Nawratil red/yellow/black border airmail envelope franked 4F85, red framed "Service Aerien Senegal-Congo/Aeromaritime/1er voyage Mai 1937/en laison avec/Air France Air Afrique", ms "Inauguration Paris-Dakar-Pointe Noire". 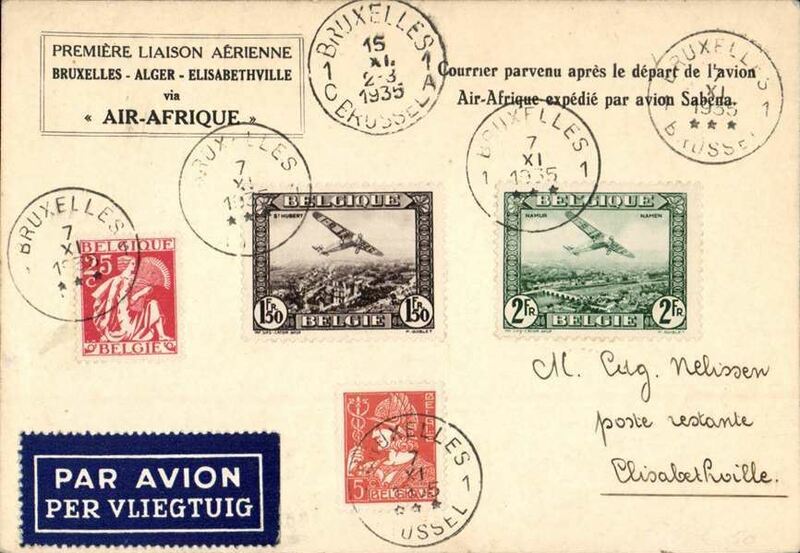 F/F accelerated Air Afrique connection Algiers-Elisabethville, Brussels (Air Show) to Fort Dauphin 24/6 via Tananarive 20/6 and Ihosy 22/6, registered (label) cover franked 9F10, canc Brussels Air Show 28/5 cds, black framed "1er Service Aerien/Francais Directe/Europe-Congo-Madagascar/par Stanleyville" cachet, ms "Par Avion Air Afrique/Paris-Stanleyville-Tananarive". 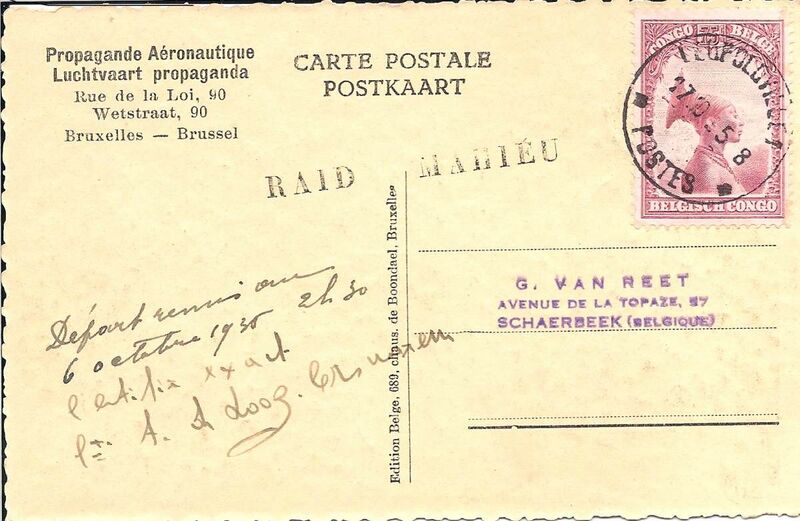 The Belgian PO was willing to hold back this cover until the right time for the Air Afrique connection. 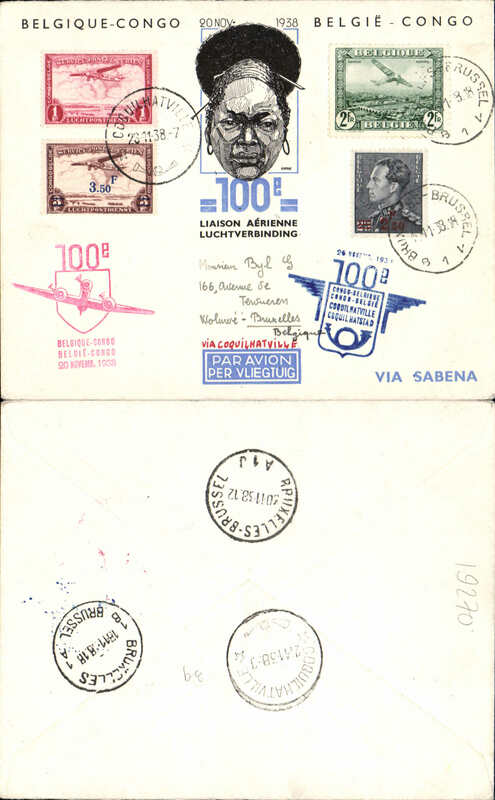 Sabena special flight to inaugurate Iloilo City, Philippines, bs 21/6, via Hong Kong 17/6, and redirected to Cebu 10/7, black/red/yellow Sabena airmail cover franked 4F85, canc Bruxelles cds, violet framed inauguration cachet. Uncommon. 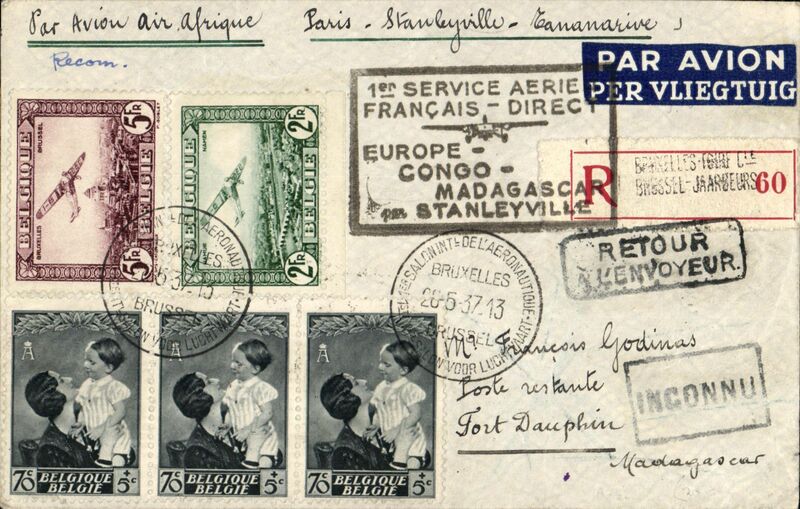 F/F accelerated Air Afrique connection Algiers-Elisabethville, Brussels to Elisabethville, bs 17/6, plain cover franked 3F85, red framed "1er Service Aerien/Francais Directe/Europe-Congo-Madagascar/par Stanleyville" cachet. 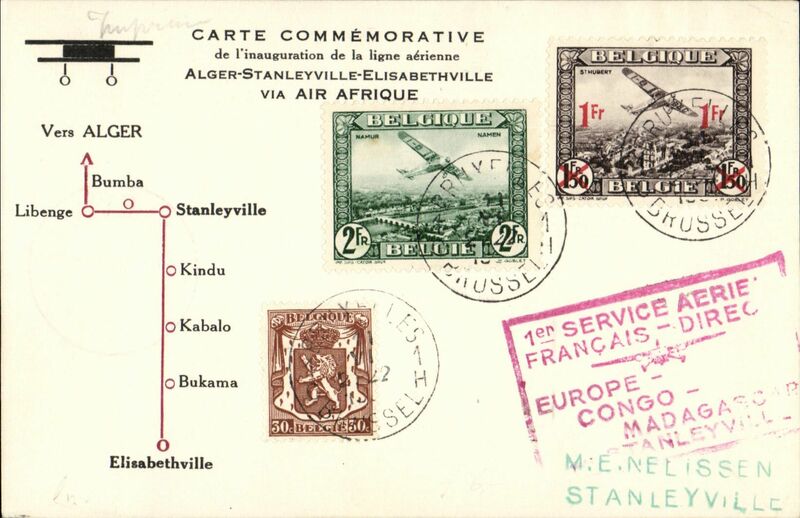 F/F accelerated Air Afrique connection Algiers-Elisabethville, Brussels to Stanleyville, commemorative card with diagram of route franked 3F30, red framed "1er Service Aerien/Francais Directe/Europe-Congo-Madagascar/par Stanleyville" cachet. 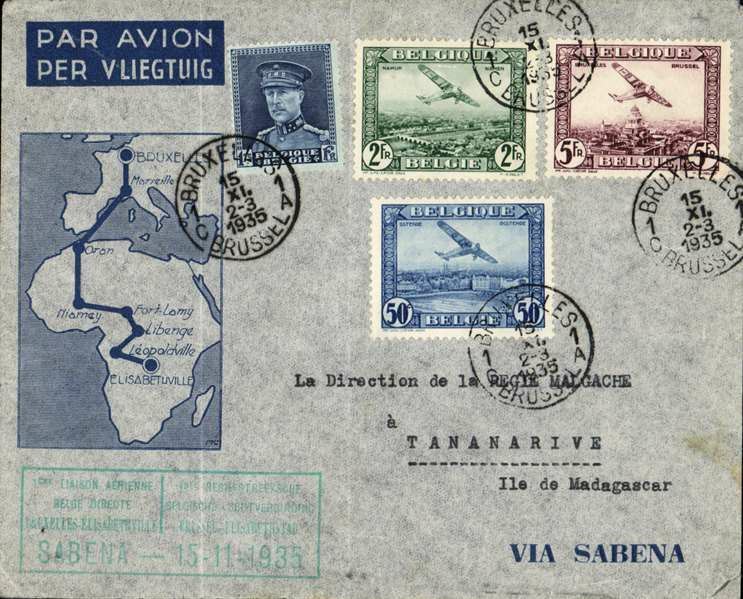 Trans-Sahara airmail, F/F Air Afrique, new itinerary, Algiers to Madagascar via Stanleyville instead of Brazzaville, airmail etiquette card correctly franked 75 for PC overseas postage and 3F50 airmail surcharge, special framed flight cachets, blue on front and red verso. 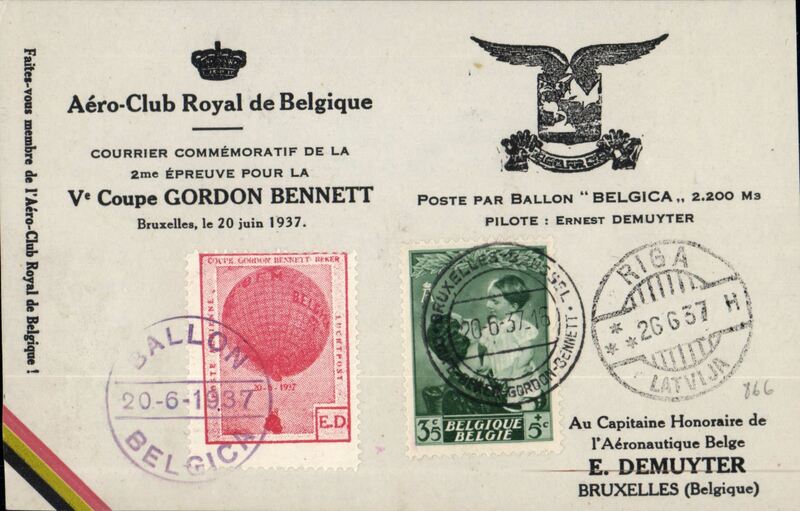 Gordon Bennett balloon, Brussels to Riga, arrival ds 26/6 on front, piloted by Demuyter, special card with red vignette canc Ballon/Belgica. 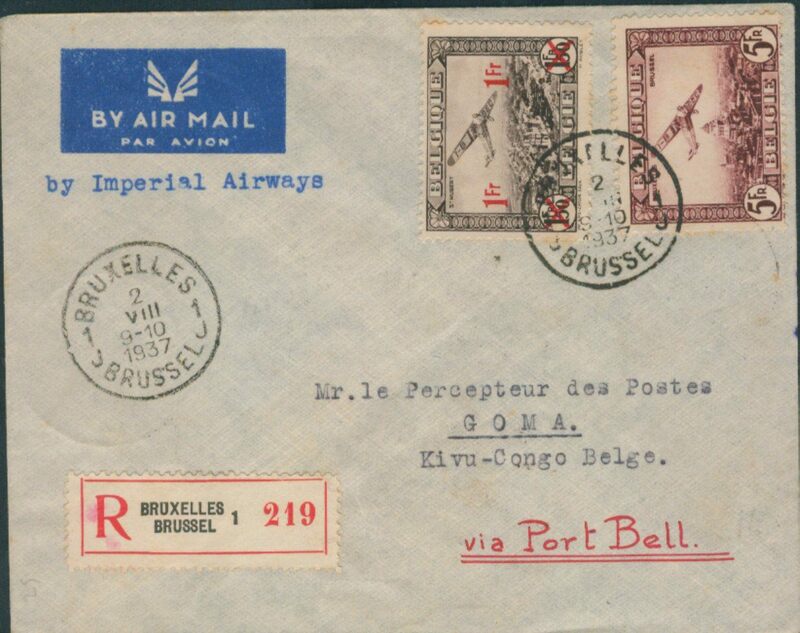 First acceptance of Belgian mail for the Eastern Congo for carriage by Imperial Airways East Africa service, Brussels to Goma, via Rutshuru 9/8 and Kampala 6/8, imprint etiquette registered (label) cover franked 6F +25c verso, canc Bruxelles 2/8 cds, typed "By Imperial Airways". Imperial AW flying boats were serving East Africa 3x week, so it was better for mail for the Eastern Cong to travel via Port Bell (Kampala). 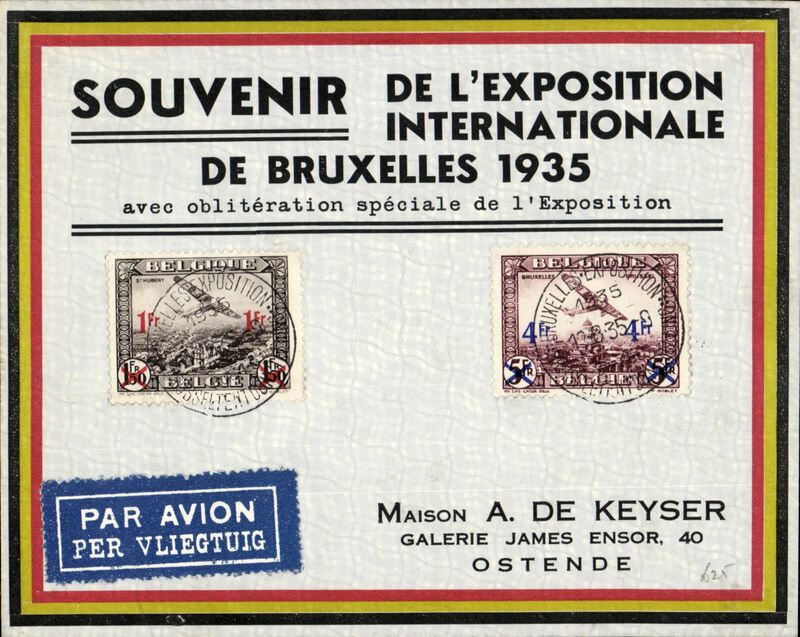 Special mail carried to the Congo, Stanleyville 1/10 arrival ds, and back on the occasion of the opening of the permanent aeronautical exhibition at Antwerp, Souvenir card, franked 3F 35 Belgian and 2F 5 Congo stamps, showing Icarus verso. 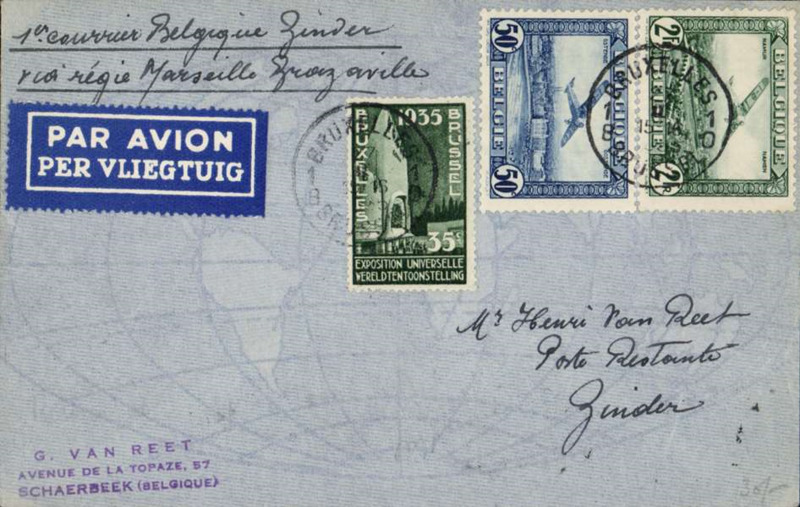 First group flight from Belgium to the Congo, Brussels to Leopoldville, and return, 6/11 arrival ds, blue/cream souvenir cover in Flemish with map of route verso, franked 3F30 Belgian stamps and 3F30 Congo stamps, green oval toothed flight cachet, also boxed violet 'Voyage Retarde/De Dix Jours/Reis tien dagen/uitgstteld' hs, Carried by the 'Phalene'. Flemish cards are much more elusive. 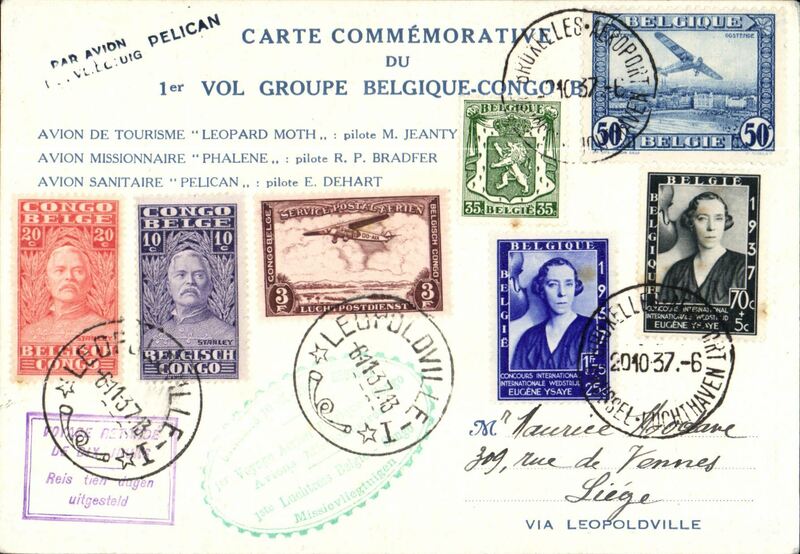 Pelican Missionary Flight Belgium-Congo, and return, Brussels to Leopoldville and return, 6/11, to Eghezee, commemorative 'Pelican' card in French with map of route verso, franked 3.30F Belgian and 3.30F Congo stamps, green and purple cachets. 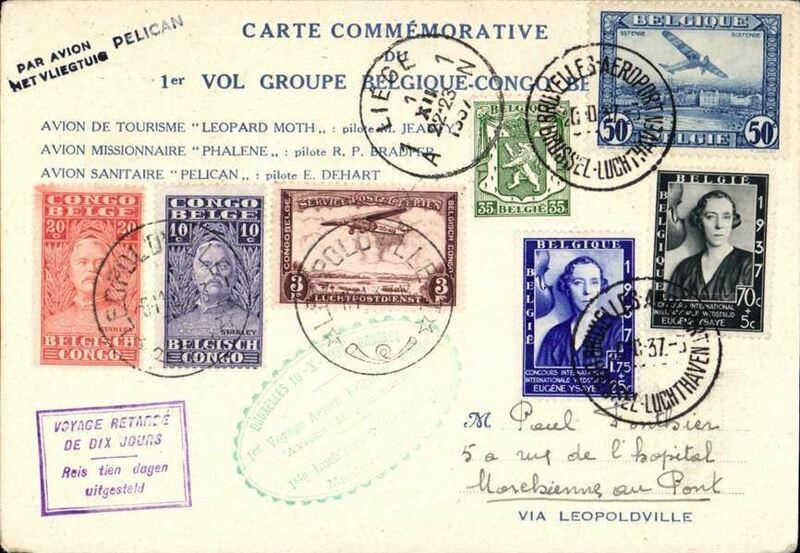 Pelican Missionary Flight Belgium-Congo, and return, Brussels to Leopoldville and return, 5/11, commemorative 'Pelican' card in French with map of route verso, franked 3.30F Belgian and 3.30F Congo stamps, green and purple cachets. 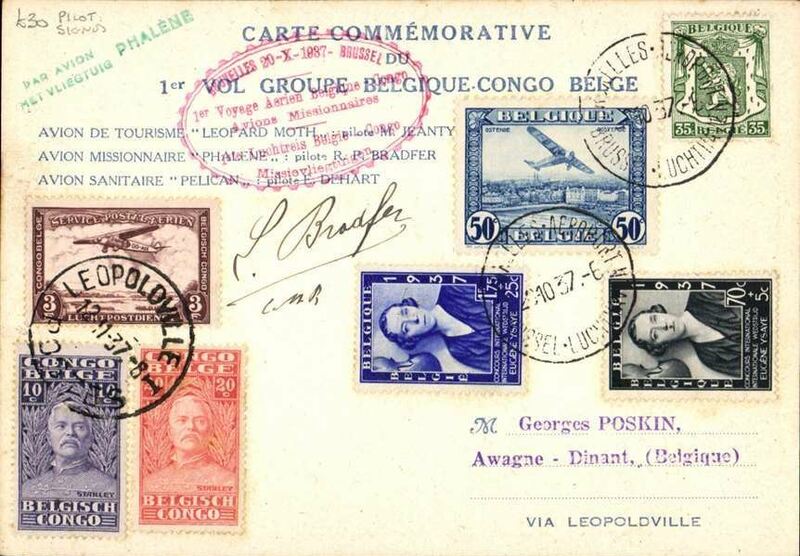 Phalene Missionary Flight Belgium-Congo, and return, Brussels to Leopoldville, 6/11, and return, 12/11, to Awant-Dinant, commemorative 'Phalene' card in French with map of route verso, franked 3.30F Belgian and 3.30F Congo stamps, green two line 'Phalene' cachet, and scarcer red toothed oval flight cachet. Signed by the pilot Pierre Bradfer. Nice item. 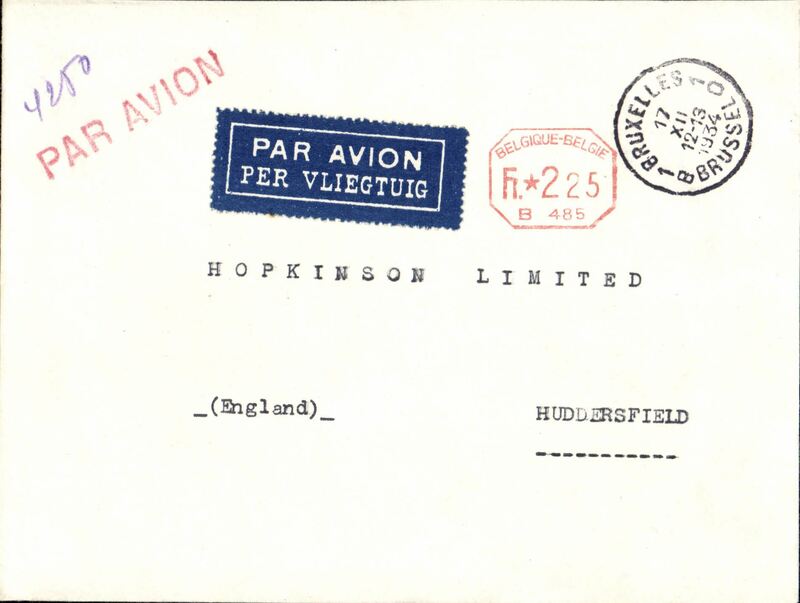 First Belgium acceptance for the first Imperial Airways service to Habbaniya (Dhibban, Iraq), bs 11/12, via Baghdad 10/12 , a new stop on the England to Australia service, M Debaar registered (label) black/yellow/red border airmail cover franked 5F85, canc Theux 2/12/1937. There was a Royal Air Force station at Habbaniyah, about 55 miles (89 km) west of Baghdad, on the banks of the Euphrates near Lake Habbaniyah. It was operational from October 1936 until the 31 May 1959 when the British were finally forced to withdraw following the July 1958 Revolution. This is the first Imperial Airways F/F to Habbaniya (Dhibban) we have seen, see Jennekins & Godinas, 1969, p82. A superb item in pristine condition. 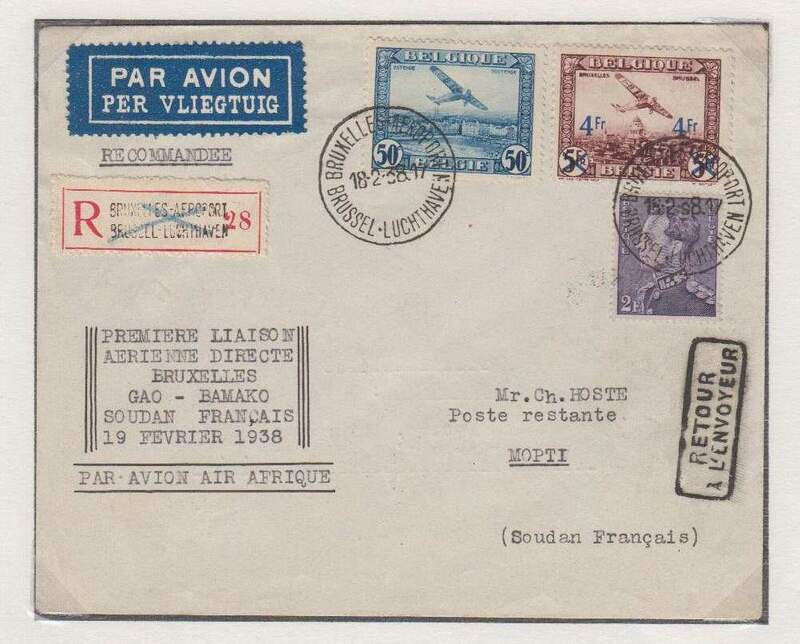 Belgium acceptance for French Sudan, Brussels to Mopti, bs 22/2, for carriage on the Air Afrique F/F Alger-Gao-Bamako, reg (label) cover franked 6F50, black six line flight cachet, blue/black bilingual airmail etiquette. Exhibition quality cover written up on display page. 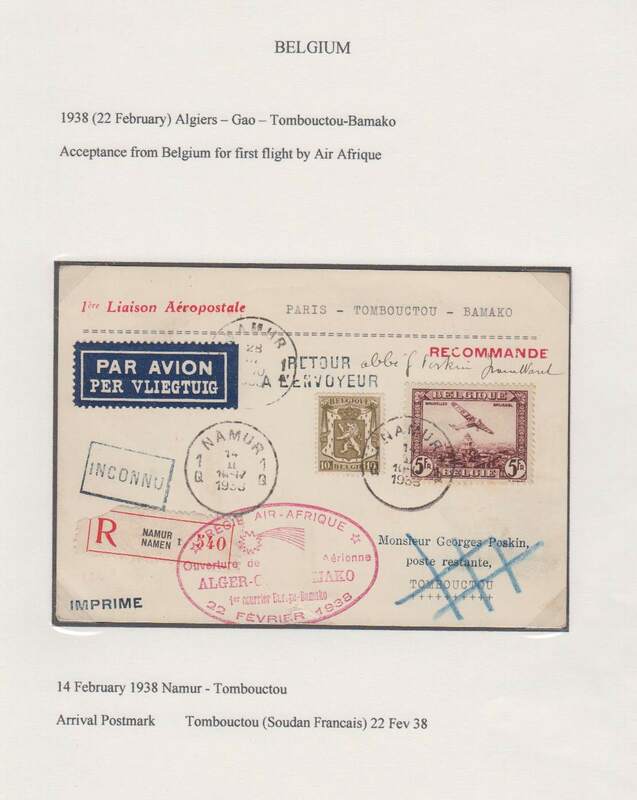 Belgium acceptance for French Sudan, Brussels to Timbouctu, bs 22/2, for carriage on the Air Afrique F/F Alger-Gao-Timbouctu- Bamako service, reg (label) cover franked 5F10, red oval 'Alger'Gao'Bamako' flight cachet, blue/black bilingual airmail etiquette. Exhibition quality cover written up on display page. 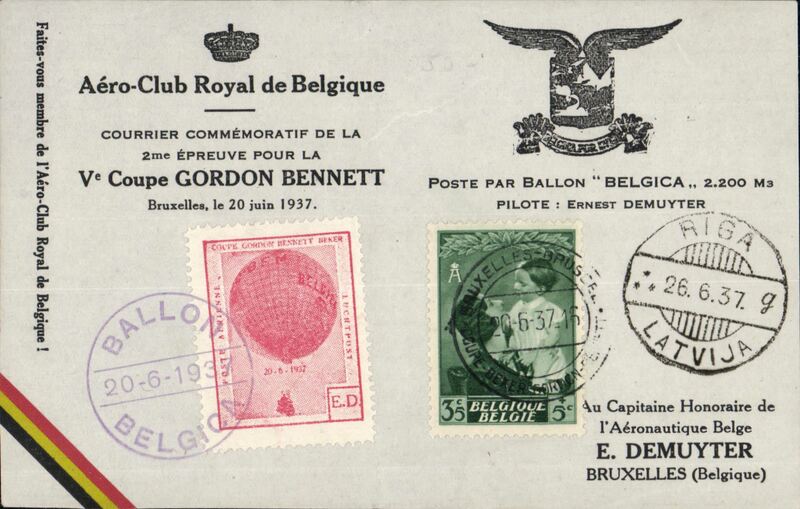 Federation de la Petite Aviation Belge, special flight Belgium-Congo, Brussels to Coquilhatville, souvenir card franked 3F30 Belgium stamps canc Brussels cds, and 3F30 Congo stamps canc Coquilhatville cds. 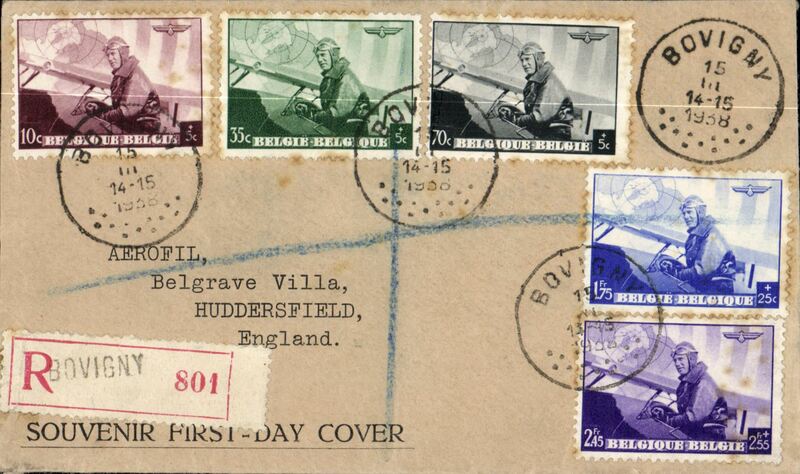 FDC 1938 Aeronautical set of five, registered (label) cover, canc Bovigny 15.3.1938. 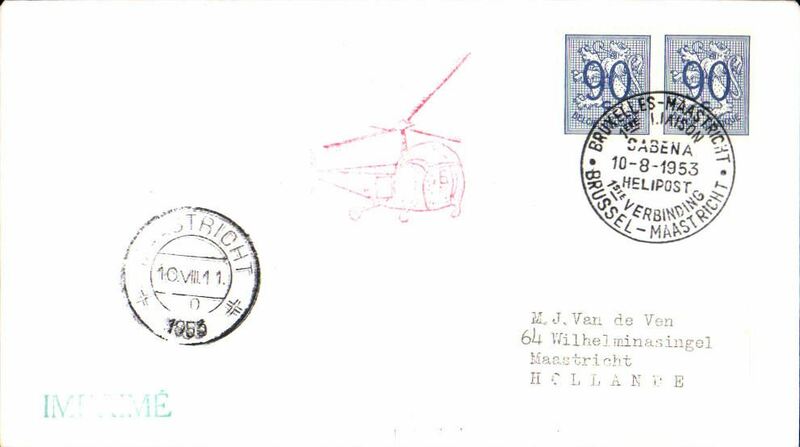 Belgium acceptance first KLM/KNILM regular weekly service operated by a foreign company, Eghezee to Sydney, bs 5/7, registered (label) cover franked 9F, large violet Amsterdam-Batavia-Sydney F/F . Red 'Unclaimed' hs verso overlaid by red circular 'Dear Letter' hs.cachet. See Godinas A331. Image. 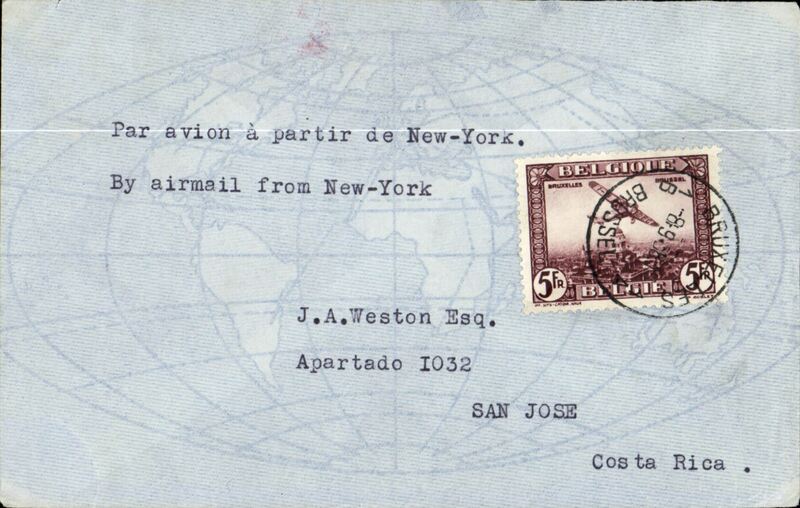 Belgium to Costa Rica, Brussels to San Jose, bs 18/9, airmsil cover franked 5F, flown from New York to CR, typed "By Airmail from New York". 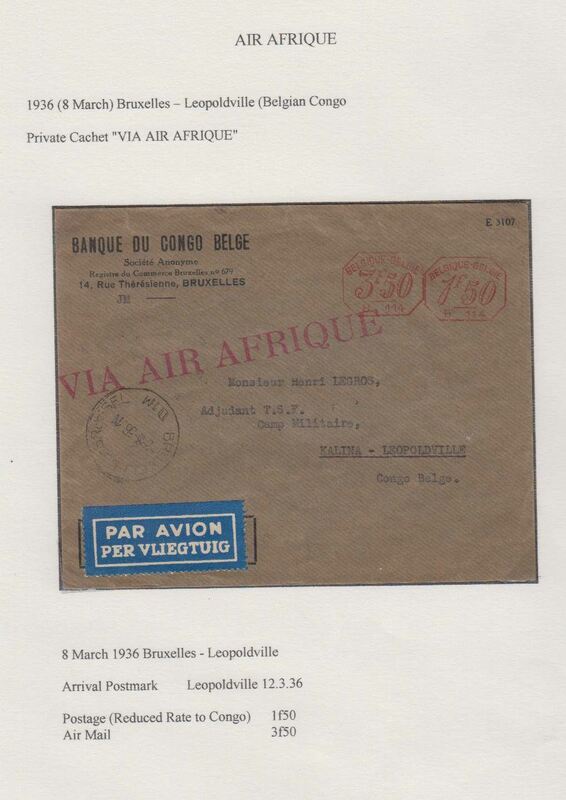 Belgium acceptance for French Congo, Brussels to Brazzaville, bs 6/11, for carriage on the Air Afrique F/F Alger-Gao-Zinder-Bangui-Brazzaville service, Van Reet cover franked 3F35, red triangular flight cachet, blue/black bilingual airmail etiquette. Exhibition quality cover written up on display page. 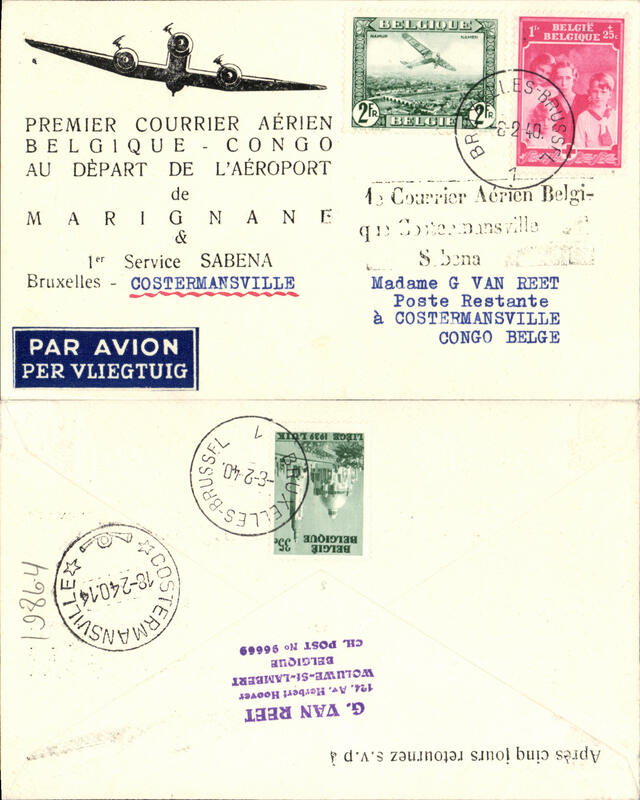 Air Afrique, first twice weekly service, Europe-Congo, Brussels to Leopoldville, bs 5/11, via Paris 2/11, ream card franked 3F 30, large red triangular flight cachet 'Alger -Brazzaville. 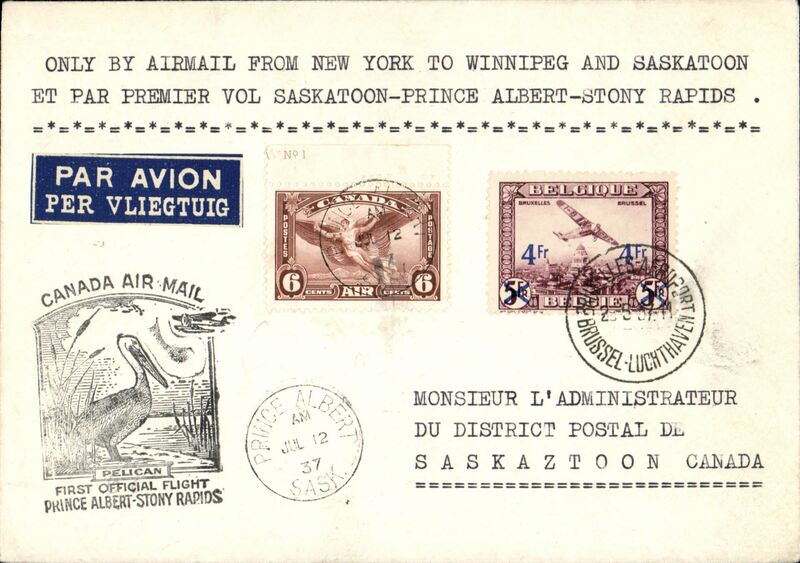 Air Afrique, first acceptance of mail from Belgium for carriage on the S.A.T.T. 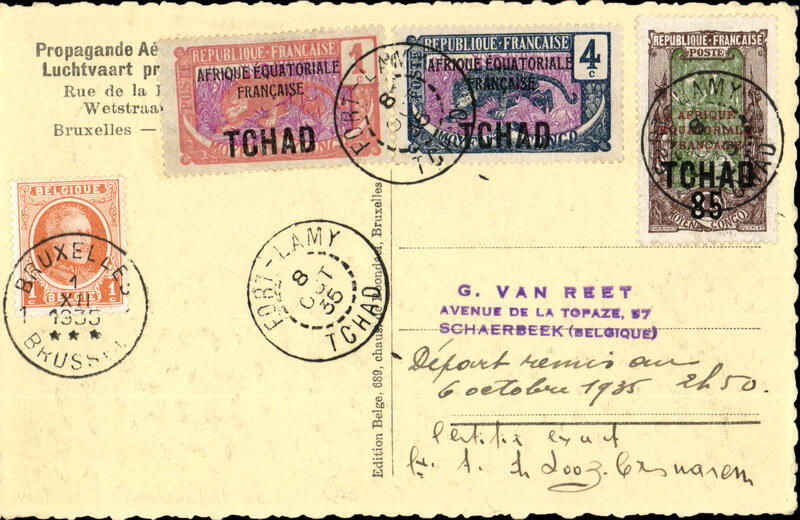 service to to Tamanrasset, Algeria, bs 13/11, via Algiers 3/11 and Aoulef 5/11, registered (label) card franked 4F 60, black three line "4 Novembre 1938/1 ier Service Bi-Hebdominaire/Algerie-Congo", dark blue/white airmail etiquette. A scarce item in fine condition. One for the specialist. 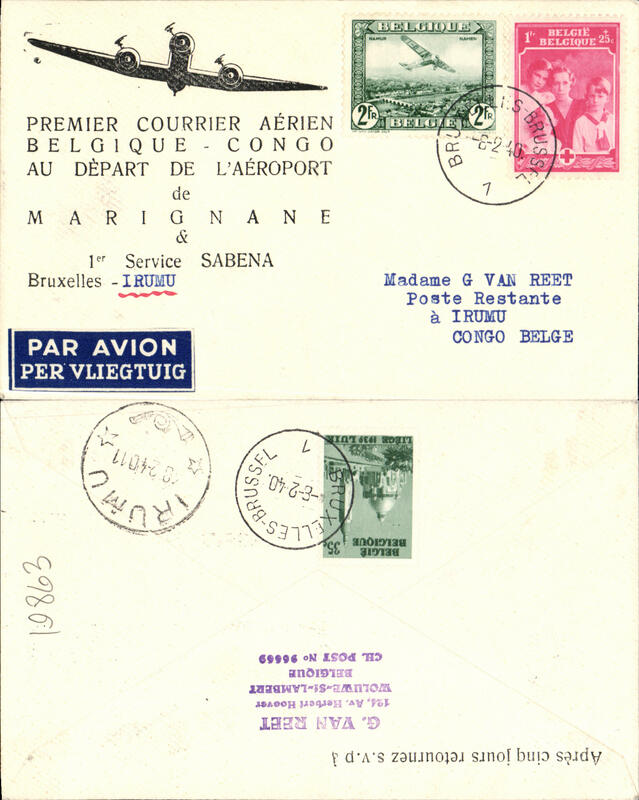 Sabena, first twice weekly service, Belgium-Congo, Brussels to Elizabethville, special card with dates of the first four flight from the Congo. 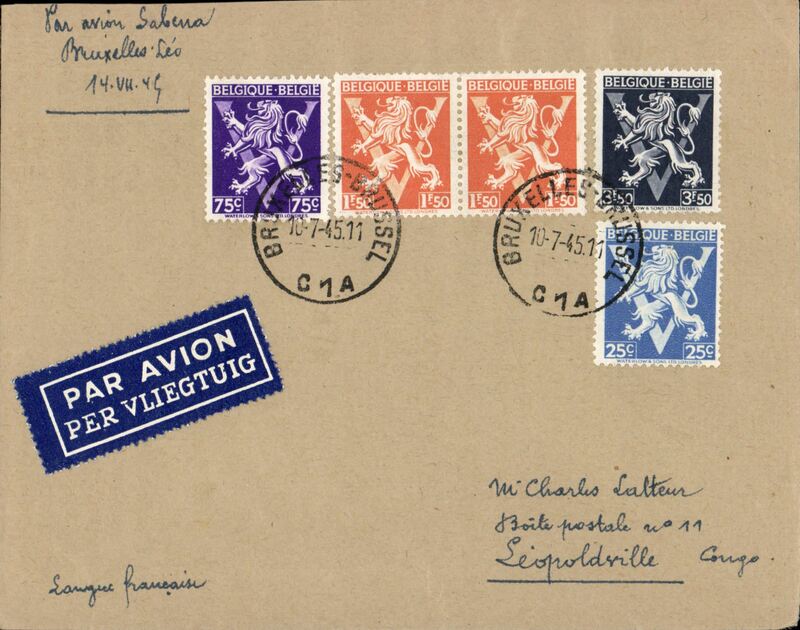 Boma to Uccle, Belgium, via Irumu 16/11, imprint etiquette cover franked 4F 50, black 'Avion' hs. Quick two day transit to Irumu, then Imperial Airways to Europe. Interesting. 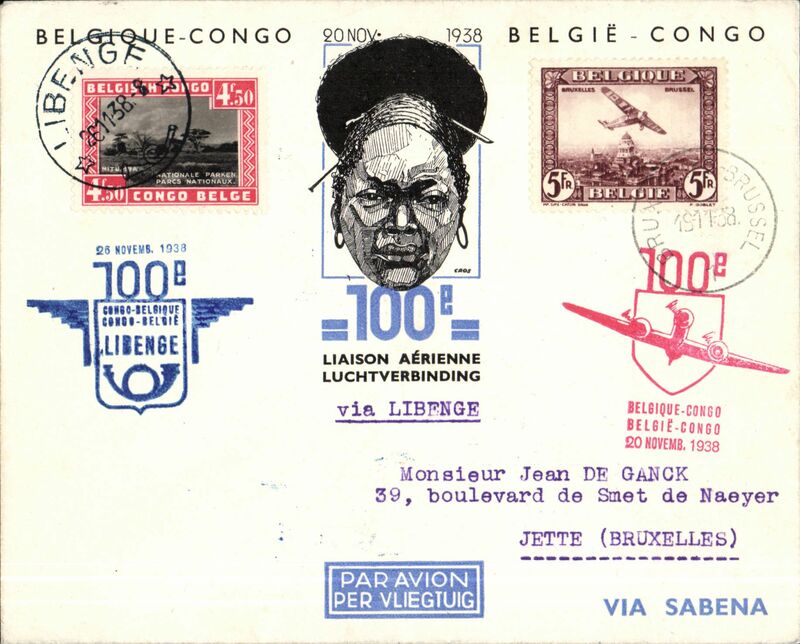 Sabena, Brussels to Kindu, 24/11 arrival ds on front, and return Kindu to Brussels, bs 30/11, souvenir cover commemorating the 100th flight Congo-Belgium, franked Belgian and Congo stamps, two flight cachets. 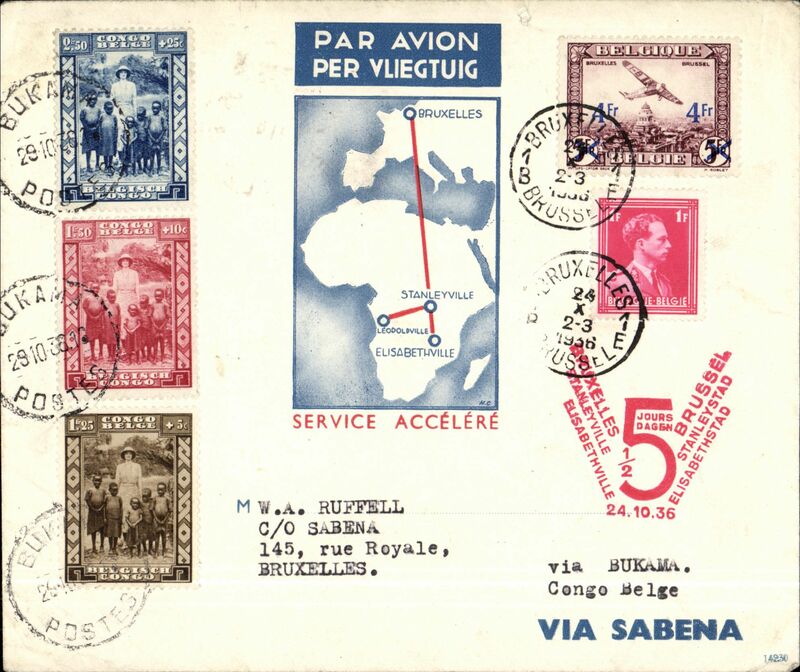 Sabena, Brussels to Coquilhatville, 28/11 arrival ds on front and return Coquilhatville to Brussels, bs 30/11, souvenir cover commemorating the 100th flight Congo-Belgium, franked Belgian and Congo stamps, two flight cachets. 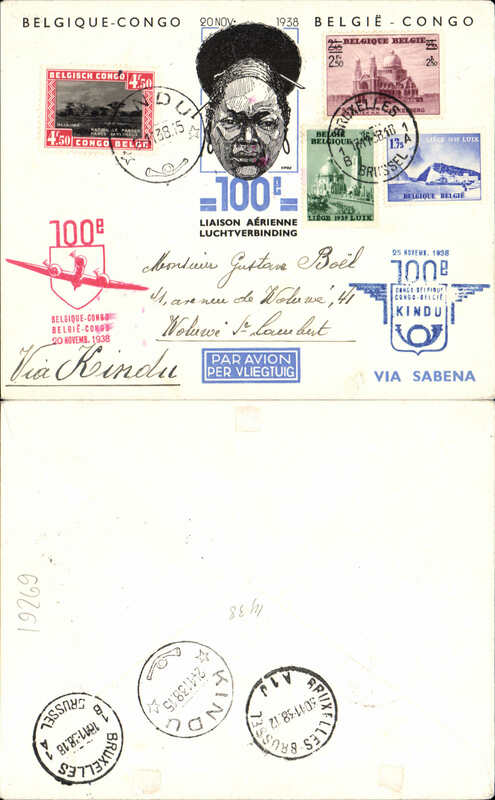 Brussels to Libennge, and return, commemorating the 100th flight, fully franked, cacheted and bs, souvenir cover, Sabena. 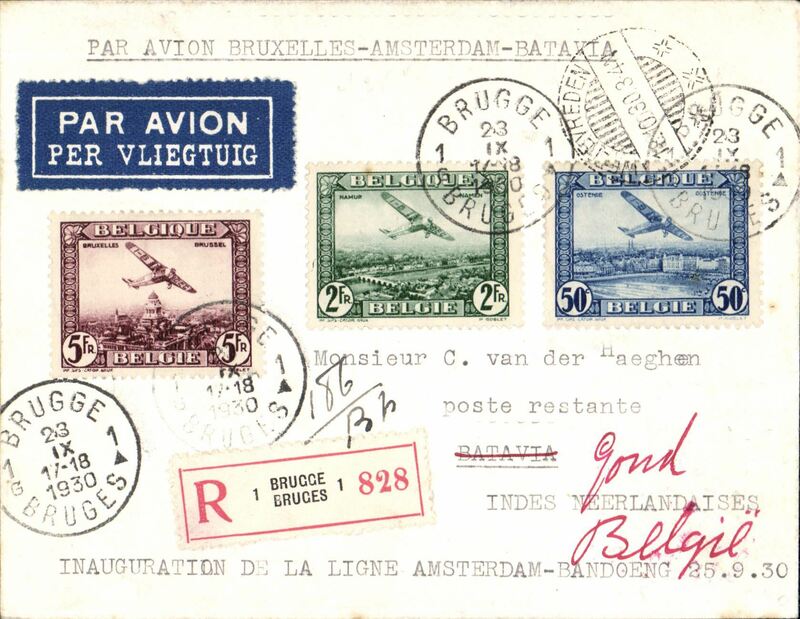 Brussels to Elisabethville, 24/11, and return 25/11 to Brussels 30/11, commemorating the 100th flight, souvenir cover fully franked with Belgian and Congo stamps, flight cachets and bs's, Sabena. 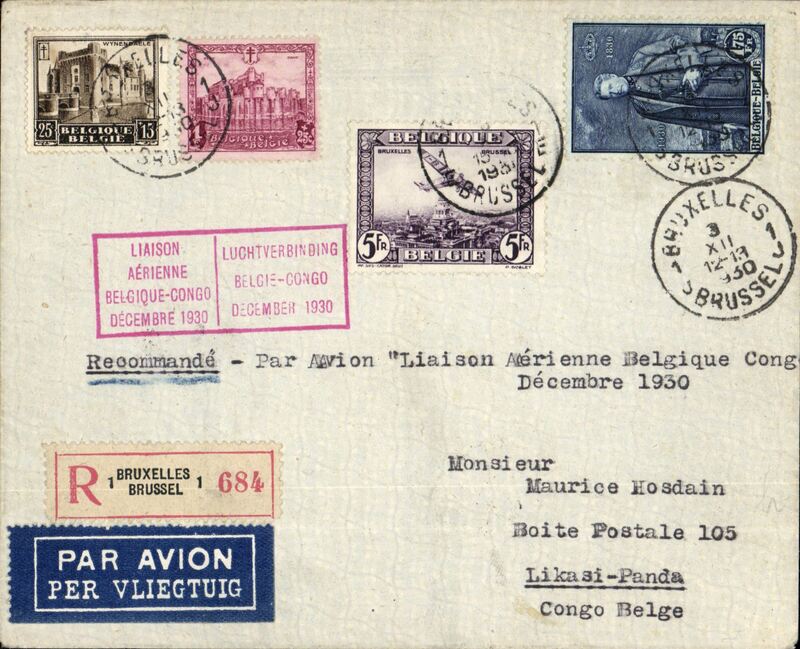 Brussels to Leopoldville, 24/11, and return 25/11 to Brussels 30/11, commemorating the 100th flight, souvenir cover fully franked with Belgian and Congo stamps, flight cachets and bs's, Sabena. 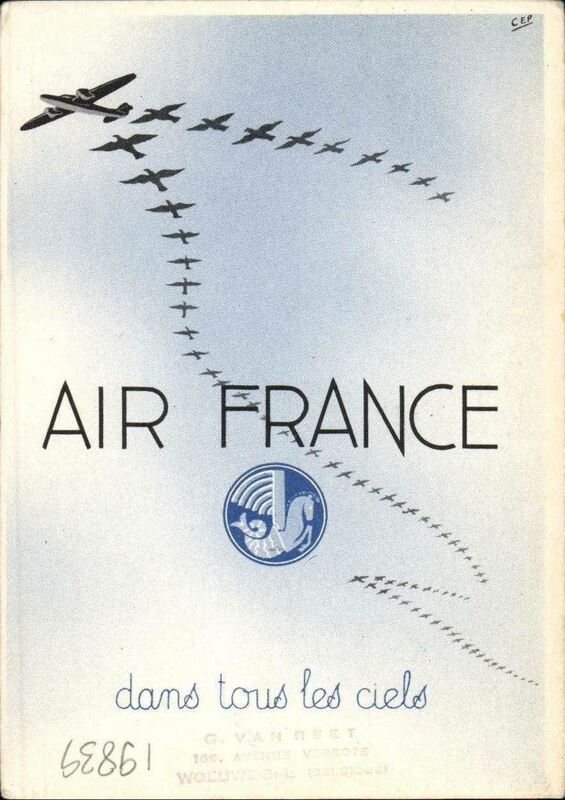 Christmas and New Year Air France publicity greetings card, Brussels to Elisabethville, 30/12 arrival ds on front. 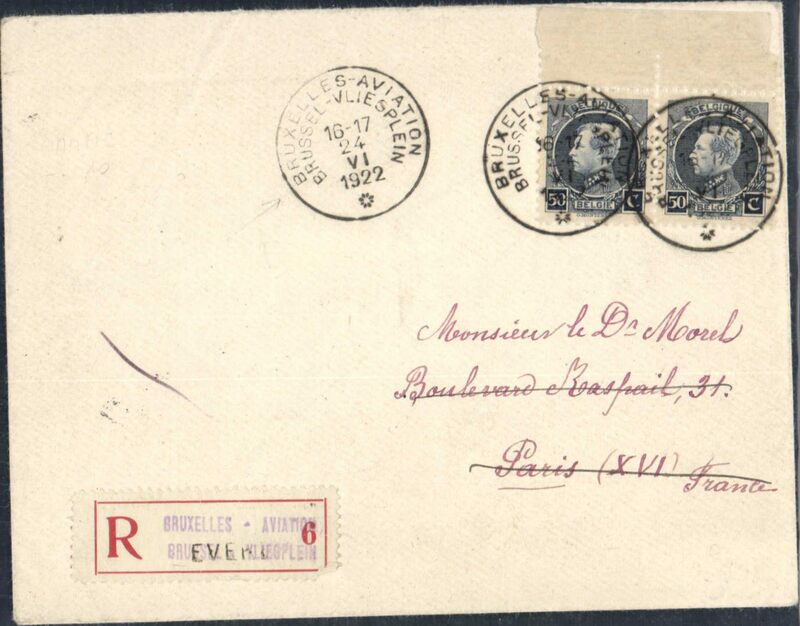 Franked 1F, although the card enjoyed a reduced tariff, against the normal 3F. Verso shows a design of aircraft/birds in arrowhead formation. Scarce. 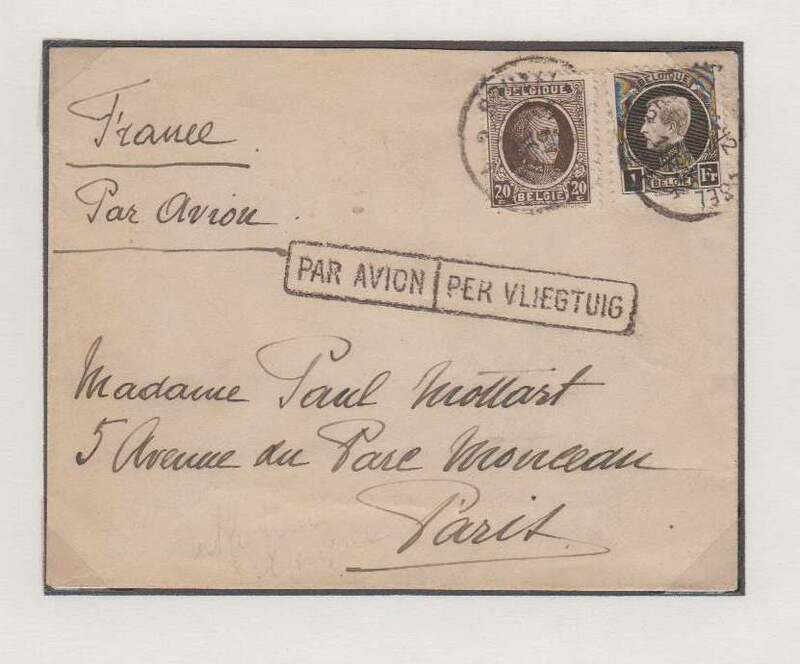 Belgium acceptance for Pau (Pyrenees), 11/5 arrival cds on front, for carriage on the first night flight from Paris, canc Le Bourget, 10/5, PC franked 1Fm fine strike red framed flight cachet, red/cream triangular airmail etiquette. 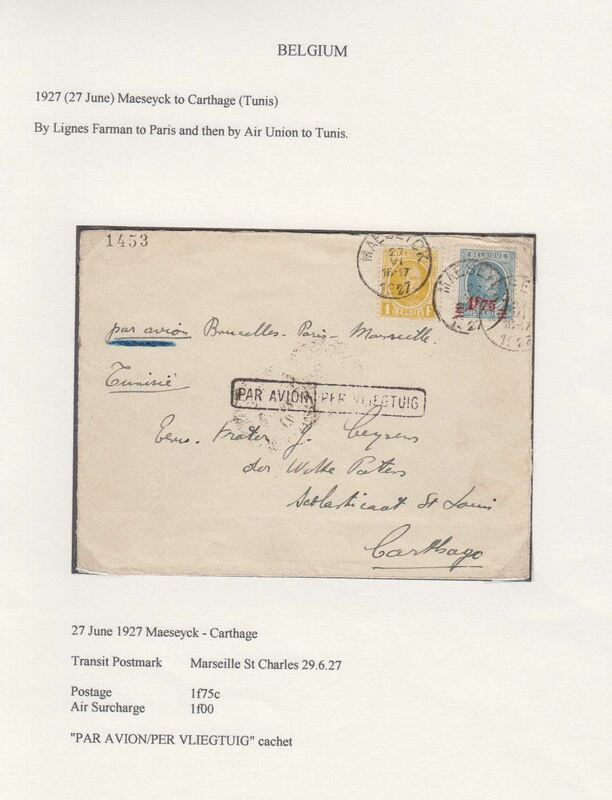 Belgium acceptance for Pan American F/F Marseille, bs 24/5 to New York, bs 27/5, airmail cover franked 7F (4F verso), fine strike red flight cachet . image. 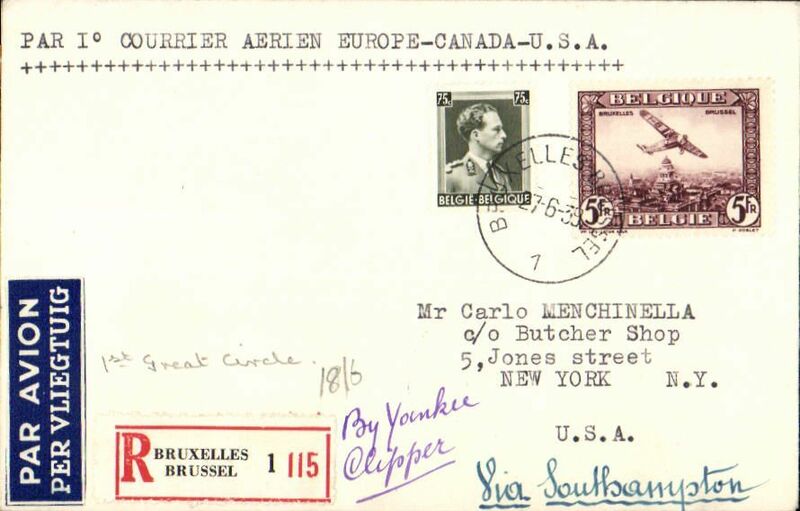 Belgium acceptance for Pan American F/F Marseille, bs 24/5 to New York, bs 27/5, plain cover franked 75c postage and 5F air surcharge, fine strike red flight cachet . 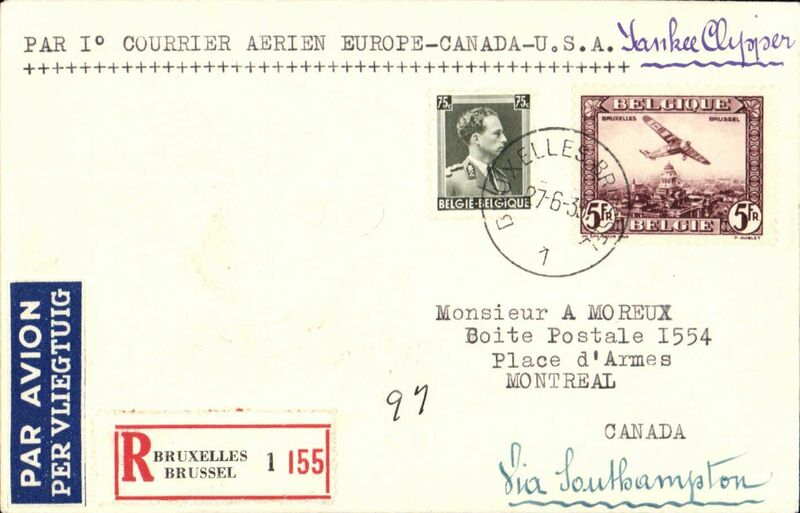 Belgium acceptance for Pan American F/F Marseille, bs 24/5 to New York, bs 27/5, plain cover franked 1F75 postage and 4F air surcharge, fine strike red flight cachet verso, blue/white airmail etiquette. Exhibition quality cover written up on display page. First Belgium acceptance for New York, bs 1/7, for carriage on Pan American F/F 'Northern' trans Atlantic route. 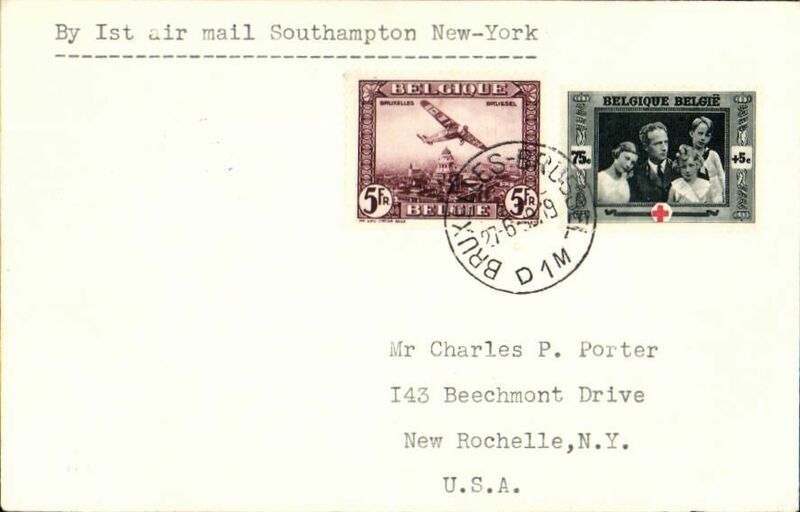 Plain cover franked 5F air + 75c, canc Bruxelles 27/6 cds, typed "By 1st air mail Southampton New-York". Francis Field authentication hs verso. First Belgium acceptance for New York, bs 2/7, for carriage on Pan American F/F 'northern' trans Atlantic route Southampton-Shediac. 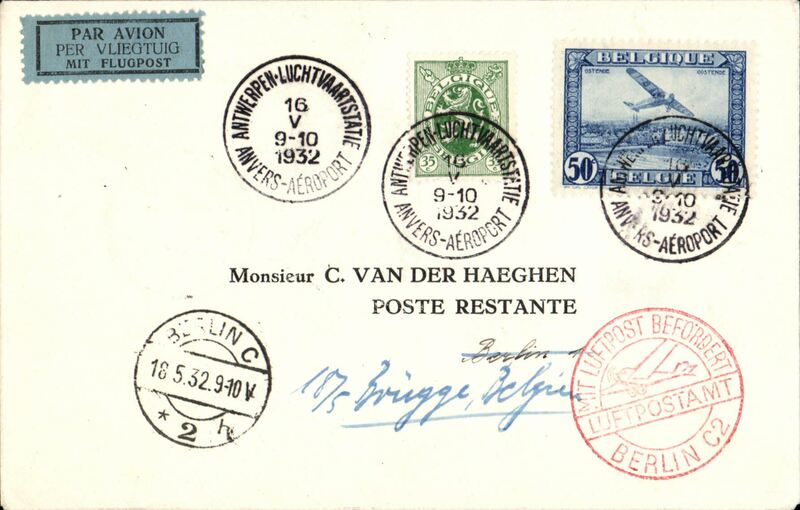 Plain registered (label) cover franked 5F air + 75c, 35c ordinary, canc Bruxelles 27/6 cds, ms 'Via Southampton' and 'Yankee Clipper'. Francis Field authentication hs verso. Scarce. First Belgium acceptance for Canada, bs Montreal 2/7, for carriage on Pan American F/F 'northern' trans Atlantic route Southampton -Shediac. 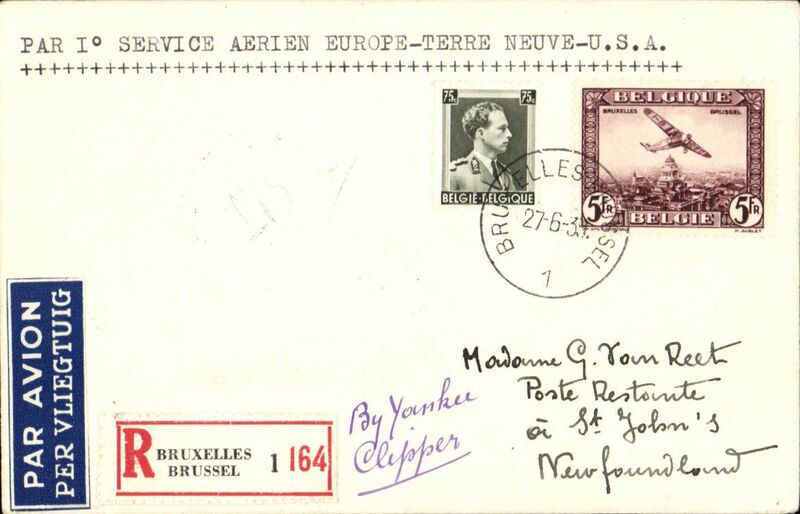 Plain registered (label) cover franked 5F air + 75c, 35c ordinary, canc Bruxelles 27/6 cds, ms 'Via Southampton' and 'Yankee Clipper'. Scarce. First Belgium acceptance for Newfoundland, bs Botwood 1/7, for carriage on Pan American F/F 'northern' trans Atlantic route Southampton-Botwood. 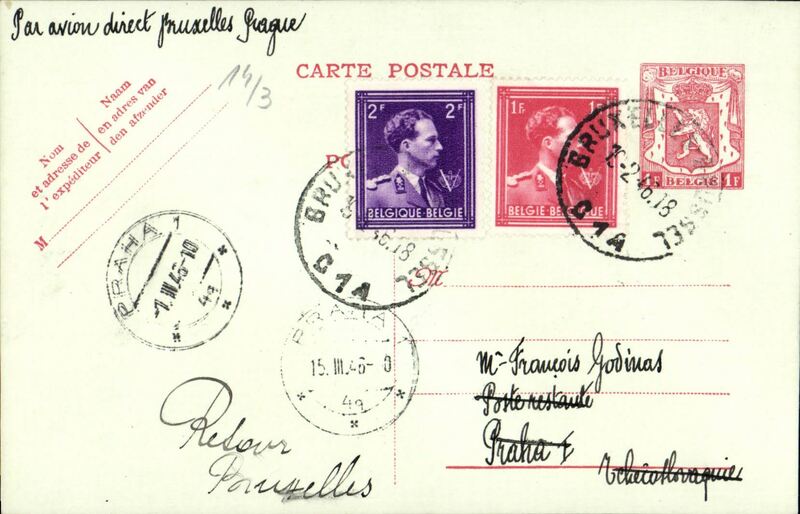 Plain registered (label) cover franked 5F air + 75c, 35c ordinary, canc Bruxelles 27/6 cds, ms 'By Yankee Clipper', Scarce. 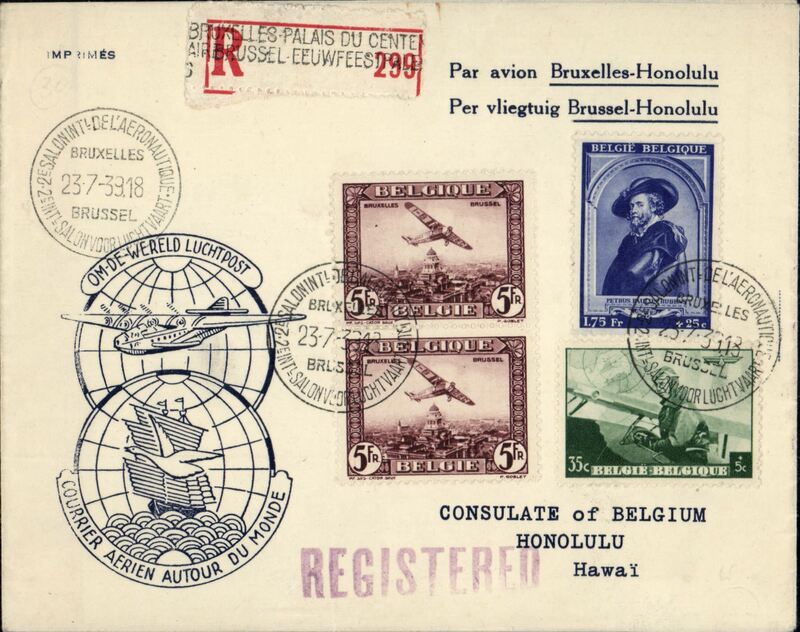 Air Union Belgique, Belgium to Hawaii proving flight, Brussels to Honolulu, 3/8, via New York 27/7, special souvenir cover franked 12.10F canc '2e Salon Intnl de L'Aeronautique/Bruxelles/23-7-39', blue double globe 'Courrier Aerien Autour du Monde' flight cacket. 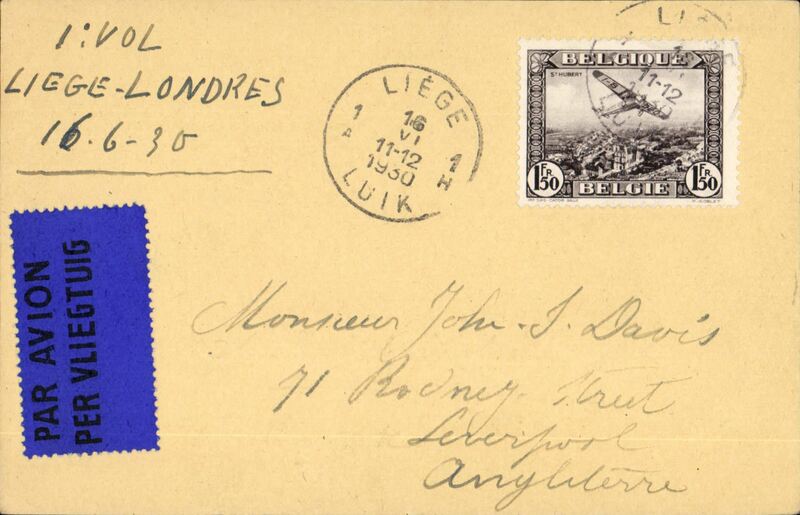 Returned to Brussels by sea, 20/12/39 arrival cds verso. Uncommon. 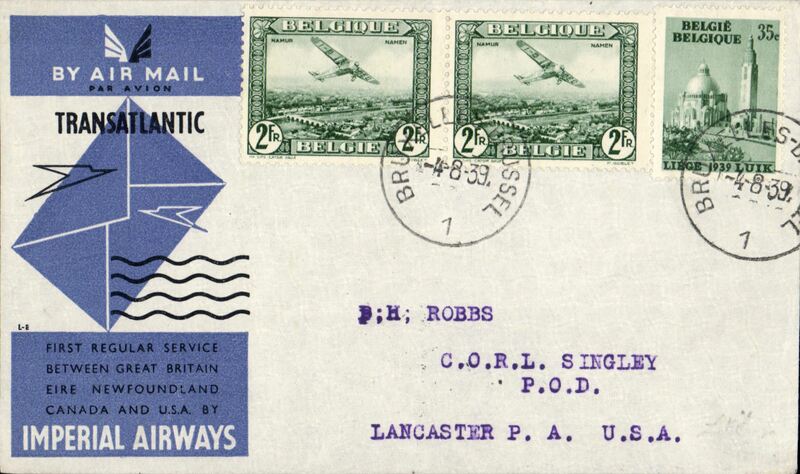 Scarce first acceptance of mail from Belgium for USA for carriage on the inaugural Imperial Airways trans Atlantic service from London to New York, bs 6/8, official black/blue/grey souvenir cover franked 1930 2F x2, and 35c ordinary, canc Brussels 4/8 cds. Only 24 flown. 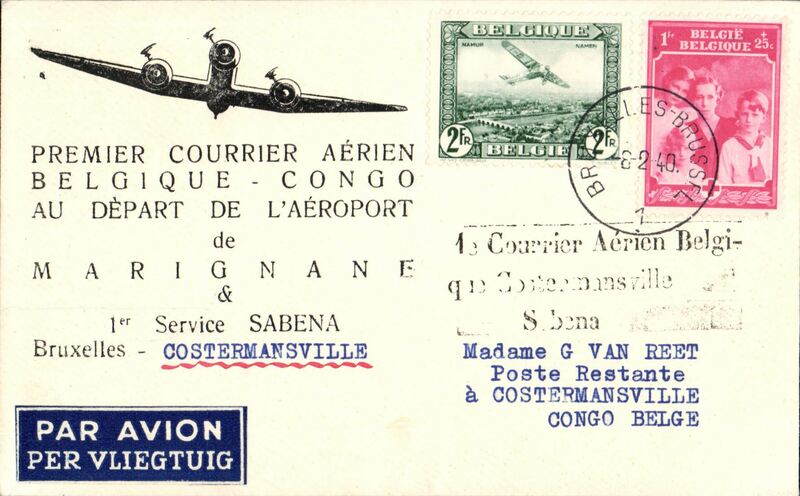 First connection between the Sabena internal service to Usumbura, and the Kikwit-Tshikapa service, Brussels to Costermansville, bs 18/2, black three line flight cachet '1e Courrier Aerien Belgi-/que Costermansville/Sabena', Van Reet printed souvenir cover franked 3F + 35 verso. 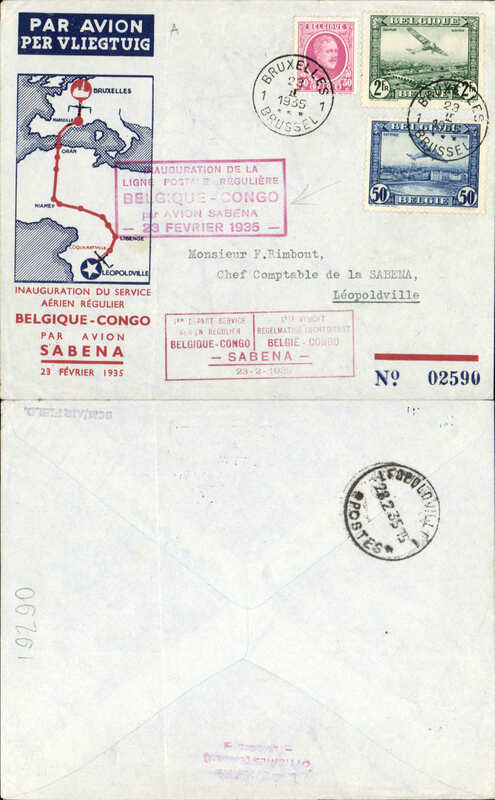 First connection between the Sabena internal service to Usumbura, and the Kikwit-Tshikapa service, Brussels to Irumu, bs 18/2, Van Reet printed souvenir cover franked 3F 25 + 35 verso. 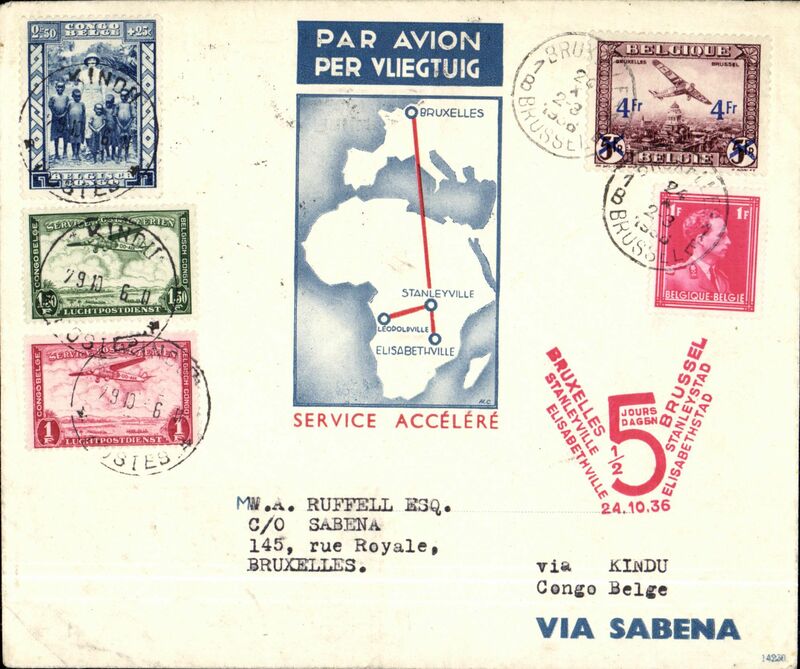 First connection between the Sabena internal service to Usumbura, and the Kikwit-Tshikapa service, Brussels to Costermansville, bs 18/2, Van Reet printed souvenir cover franked 3F 25 + 35 verso. Sabena F/F direct Brussels to Zurich, bs 5/2, souvenir 1F PSC with additional 3F25. F/F direct service Brussels to Prague, arrival s on front, 1F PSC with additional 3f stamps. Sabena, Brussels to Leopoldville, 25/2, in 25 hours, carried on the first direct flight via Lagos, and return Leo 27/2-Brussels 28/1. 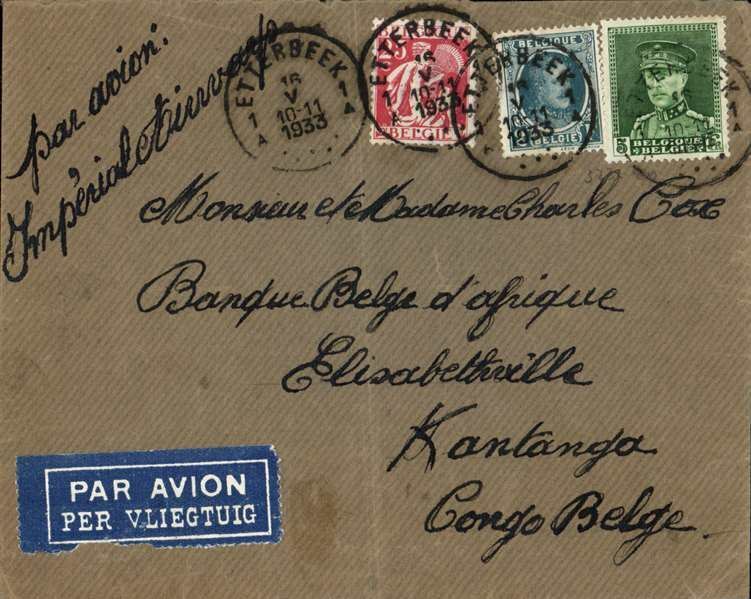 Attractive printed souvenir cover, franked Belgium and Congo stamps, both correctly postmarked and outward and return flight cachets on front. 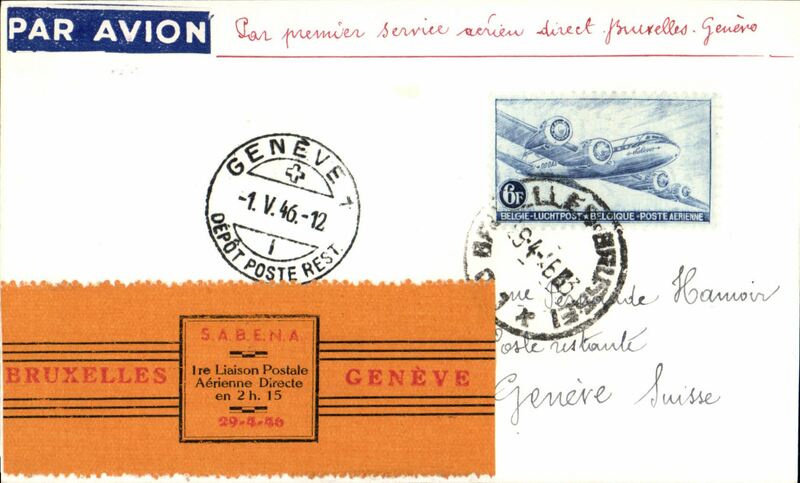 Sabena, F/F direct service Brussels to Geneva, card franked 6F, attractive black/red/orange souvenir label, 'par avion' etiquette. 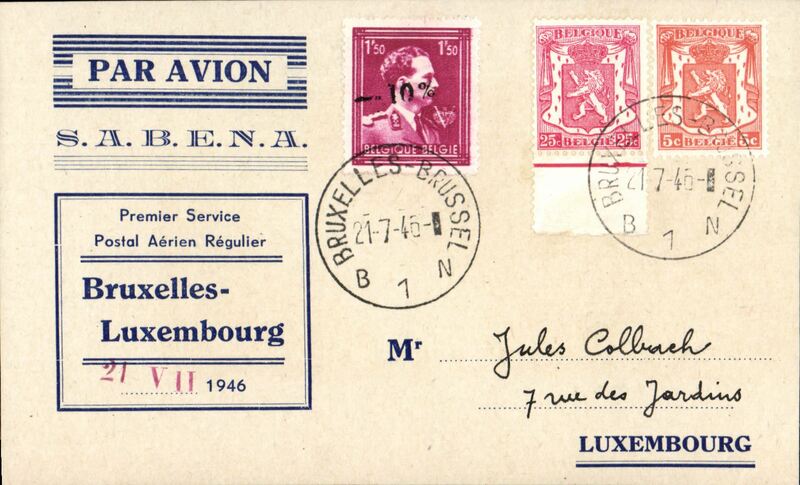 Sabena F/F Brussels to Luxembourg, bs 21/7, Souvenir card franked 1F80. 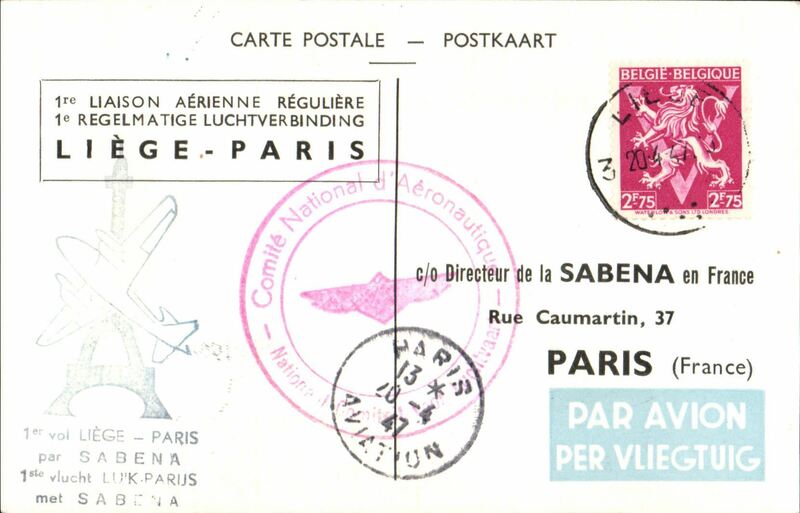 First regular Sabena flight, Liege to Paris, b/s, cachets x2, illustrated souvenir card. 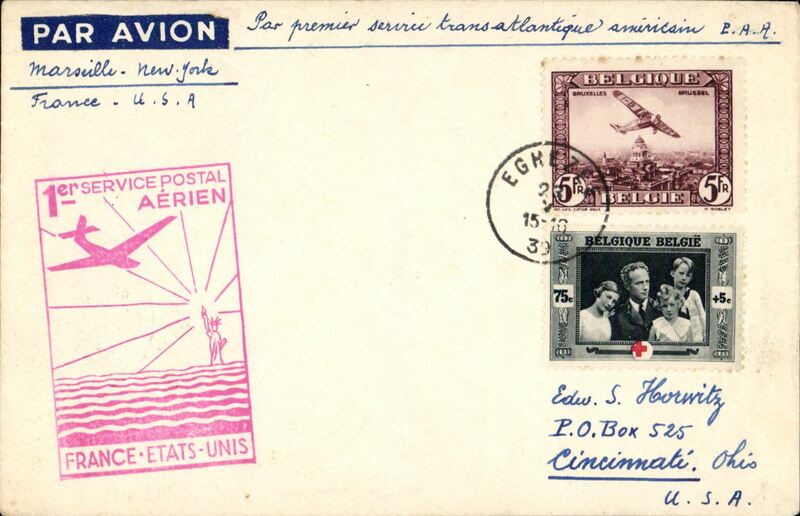 Cipex special flight, Brussels to New York, b/s, franked Damianus set x2 overprinted for airmail use, special depart cachet, souvenir cover, 21x9cm, Sabena. 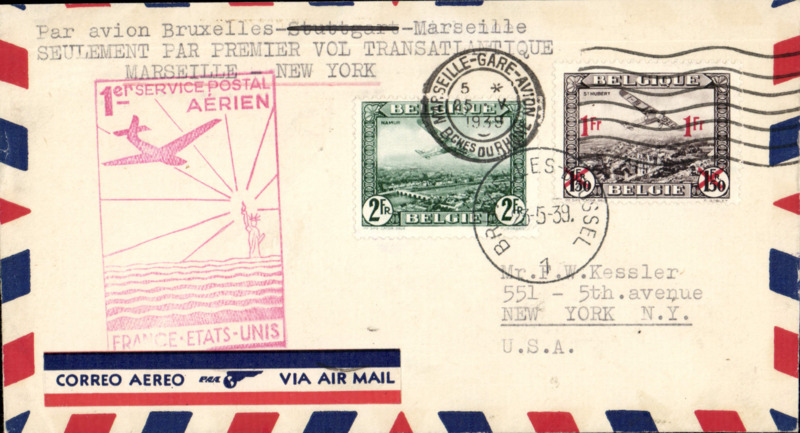 Sabena Cipex special flight, Brussels to New York, b/s, franked Emile Vandervelde set x2 overprinted for airmail use, special depart cachet, souvenir cover, 21x9cm. 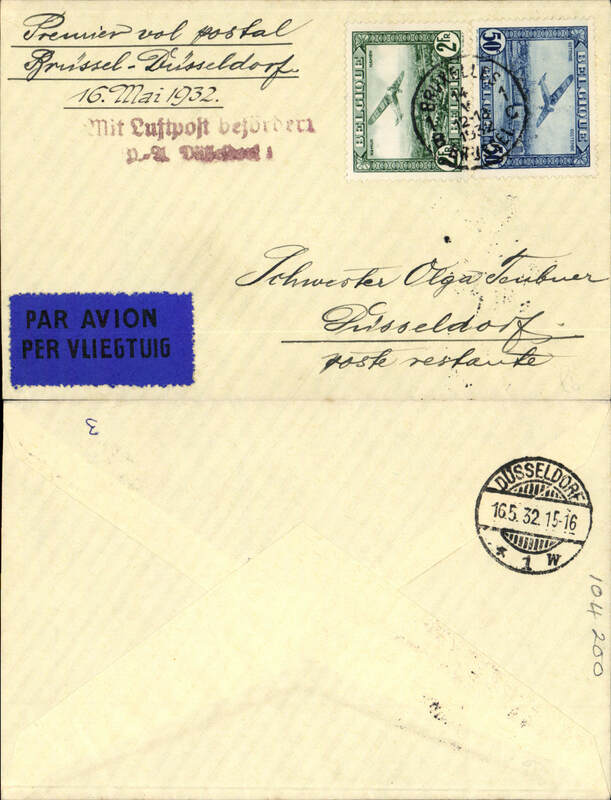 Sabena, F/F Brussels to Milan,bs 13/6, airmail cover franked 6F. 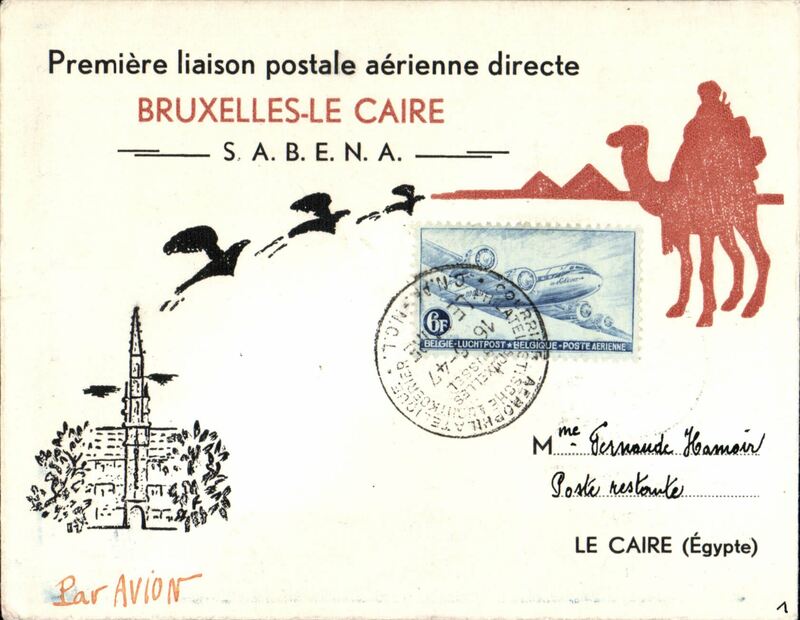 Sabena F/F Brussels to Cairo, bs 17/6, souvenir cover franked 6F canc special depart postmark. 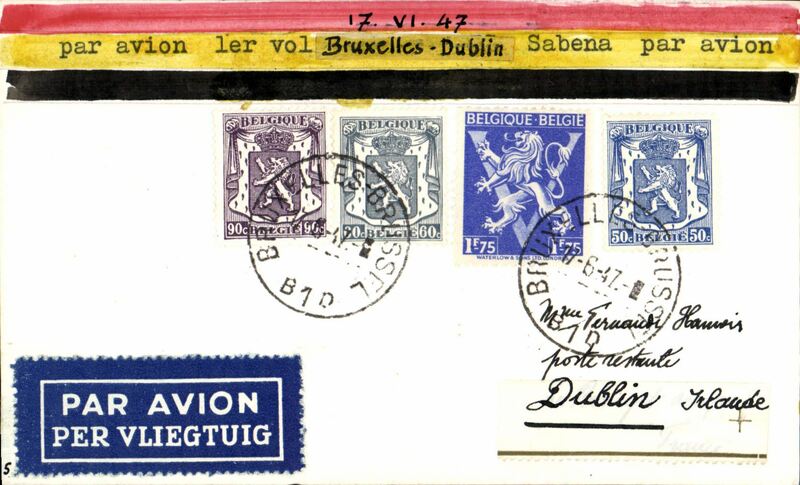 Sabena F/F Brussels to Dublin, bs 18/6, PPC franked 3F75. 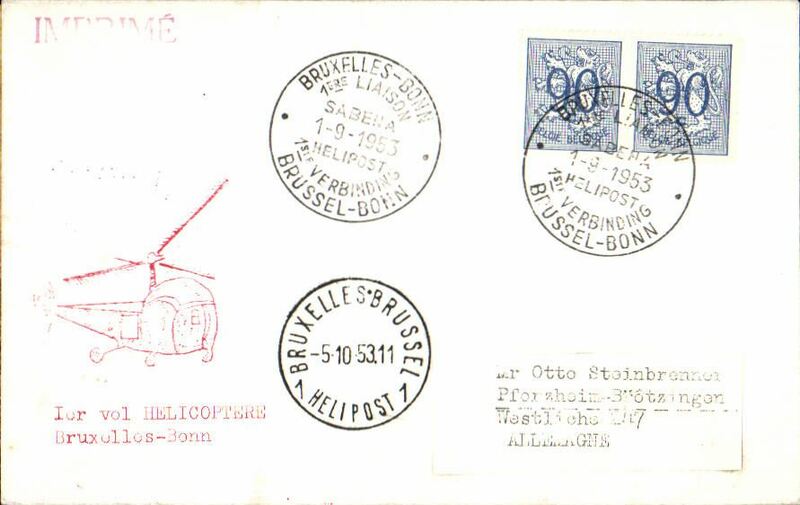 Sabena F/F Belgian postal service by helicopter, round trip of nine stops fromTurnhout-Turnhout, souvenir card with nine intermediate transit postmarks and stamps.Image. F/F Brussels to Lille, bs 5/8, black cachet. F/F Brussels to Maastricht, no arrival ds, red flight cachet. F/F Brussels to Cologne, bs 5/9, red flight cachet. F/F Brussels to Bonn, bs, red flight cachet. First jet Brussels to New York, b/s, cachet, illustrated souvenir cover, Pan Am. 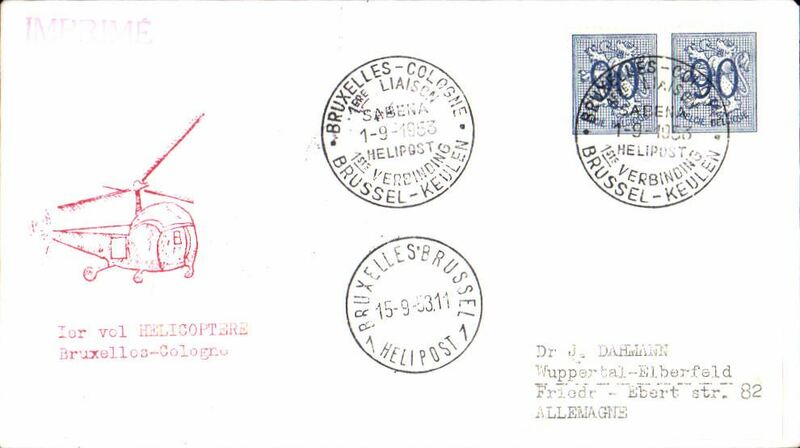 Last mail from Belgian Antarctic Base, Brussels 16/2 arrival ds on front, souvenir magenta 4F aerogramme with additional 3.5F canc special date stamp, 130 letters carried. 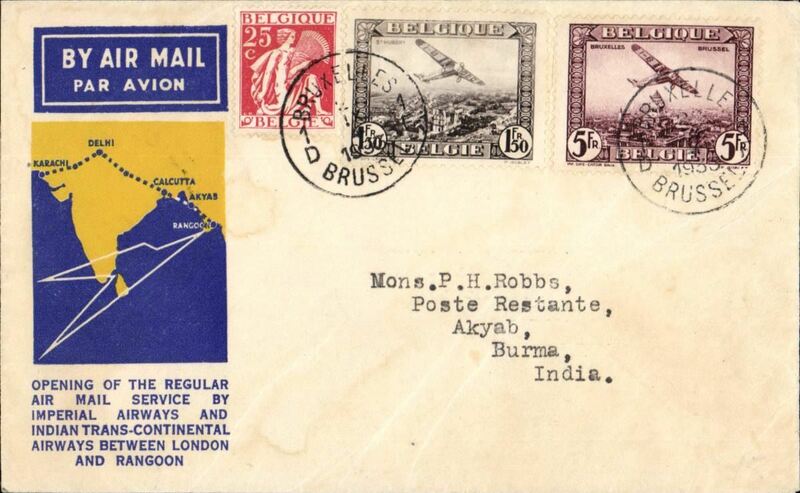 Sabena F/F Brussels to Bombay, bs, souvenir cover, cachet. 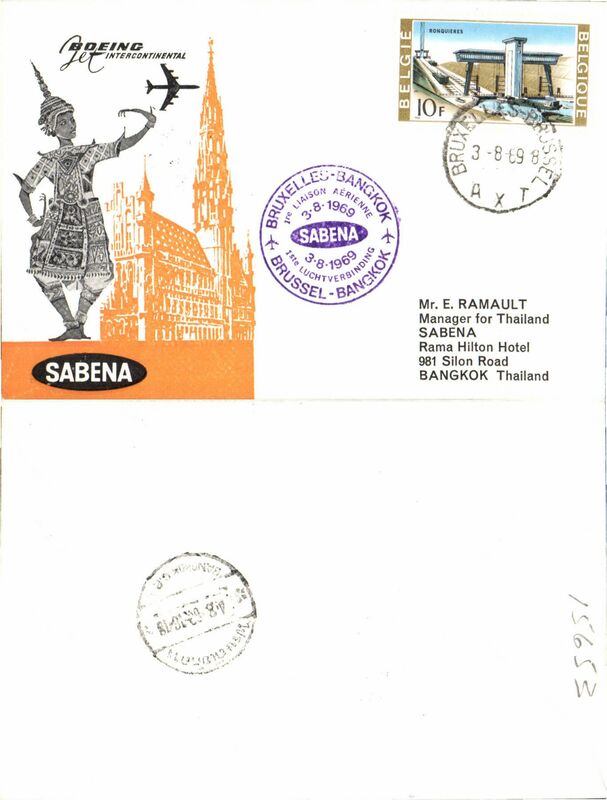 Sabena F/F Brussels to Bangkok, bs, souvenir cover. 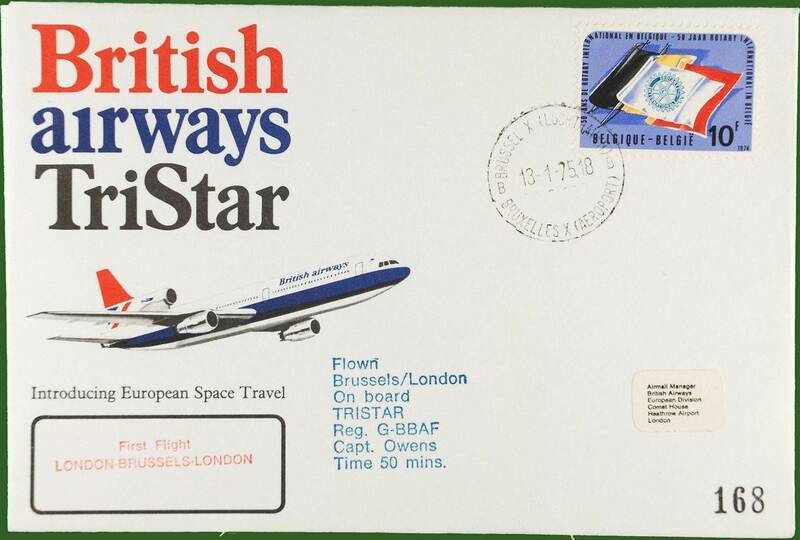 Brussels-London, POA 13/1,BA TRISTAR souvenir cover franked 10F.